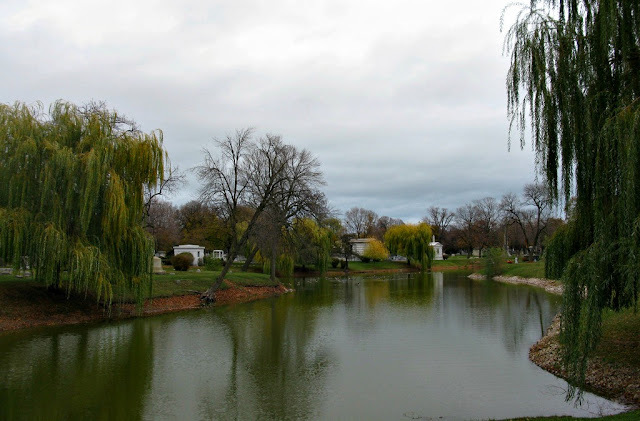 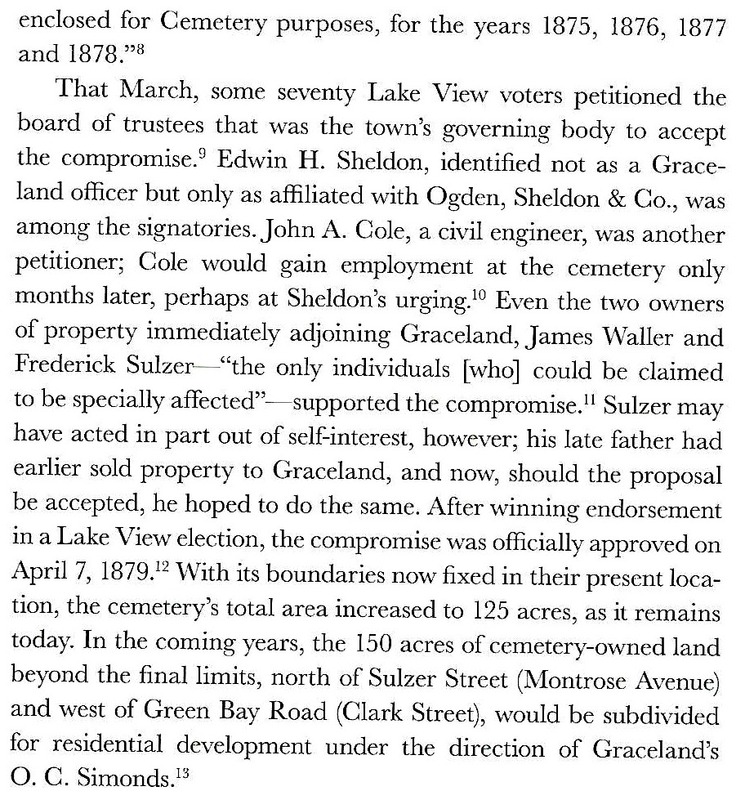 It is my view that Lake View would have had a protracted development if it was not for the establishment of the cemeteries in the Township of Lake View in the early 1860's. 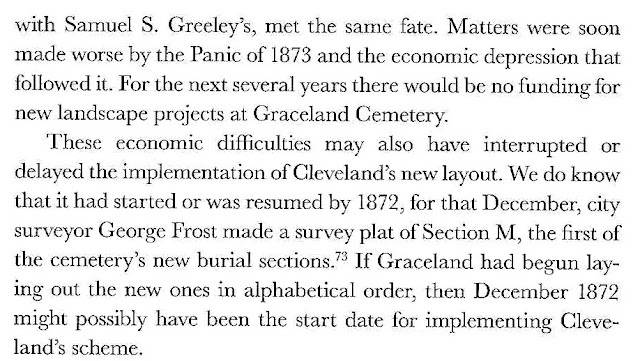 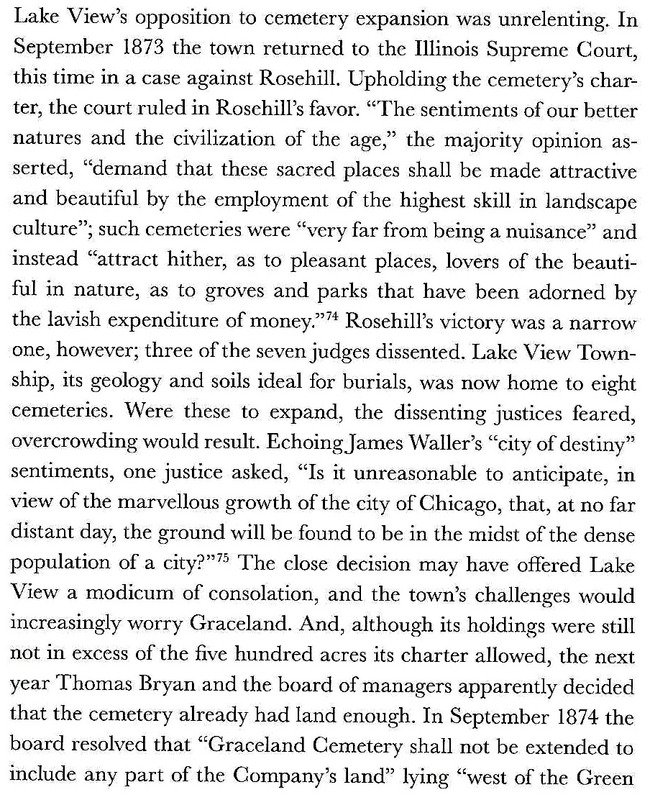 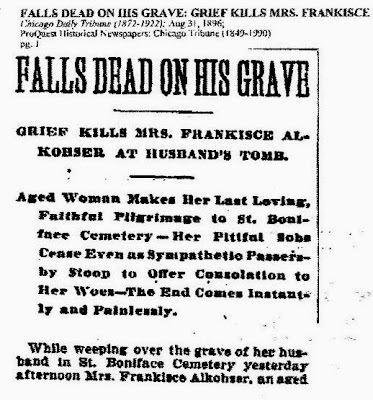 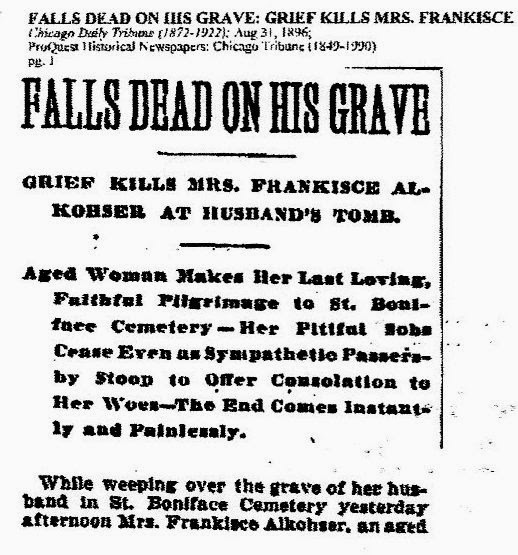 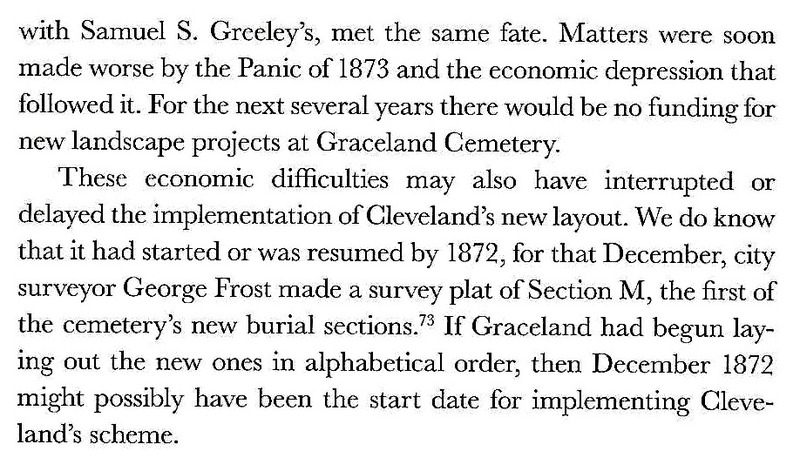 With the failure of Chicago Cemetery in the City of Chicago plan was then to move all future cemeteries to a higher and more drier elevation. 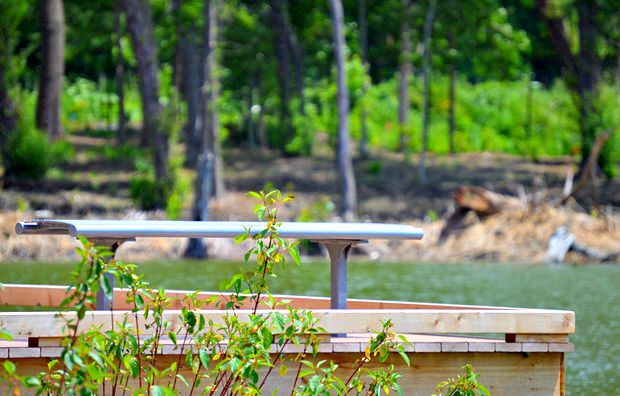 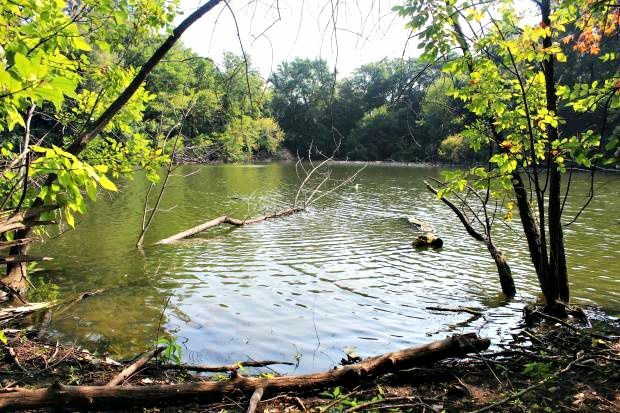 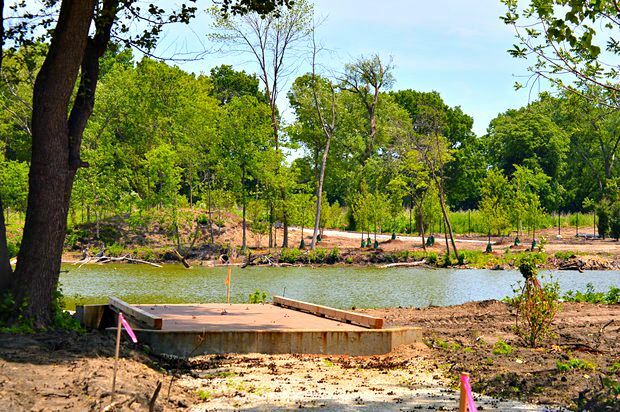 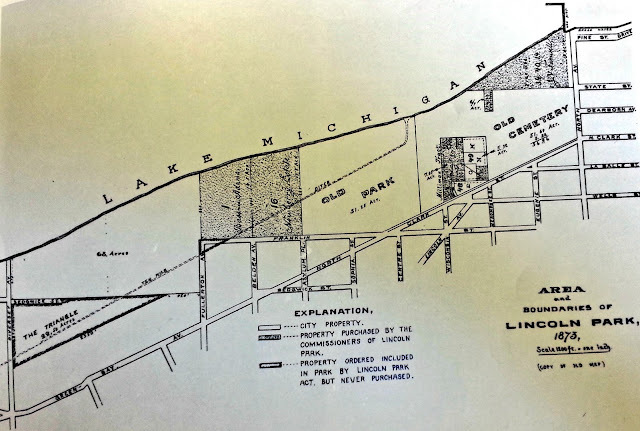 Drier elevation meant planned developments in the Township of Lake View. 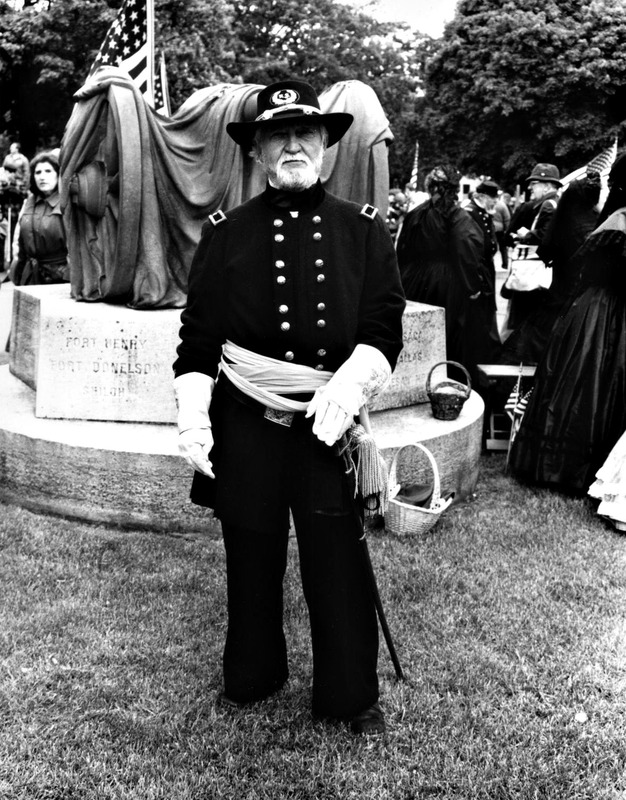 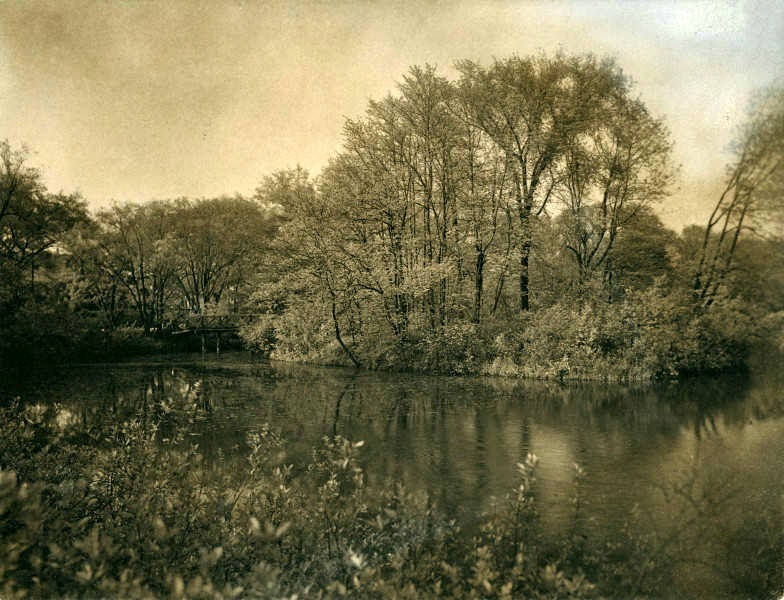 That cemetery was located on the sandy marshlands along Lake Michigan were call today Lincoln Park, the park. This post is closely related to my post called Sharing Lincoln Park and the book called 'Lincoln Park 1899' - a great read! 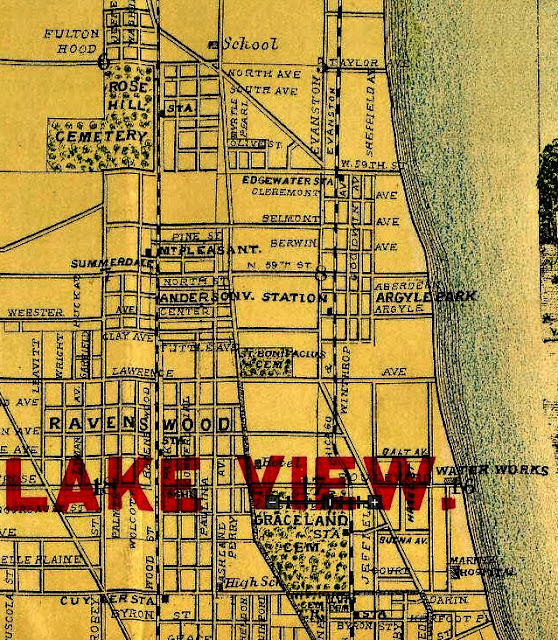 City of Lake View by the City of Chicago in 1889.
venues last quarter of the 19th century; where cool and gentle breezes from the lake-shore bluffs were the norm. 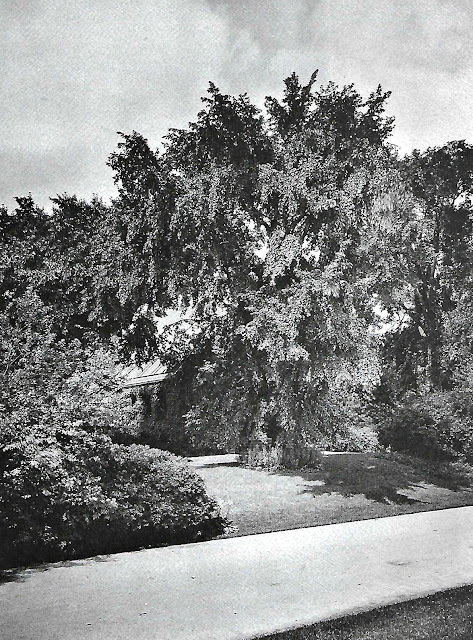 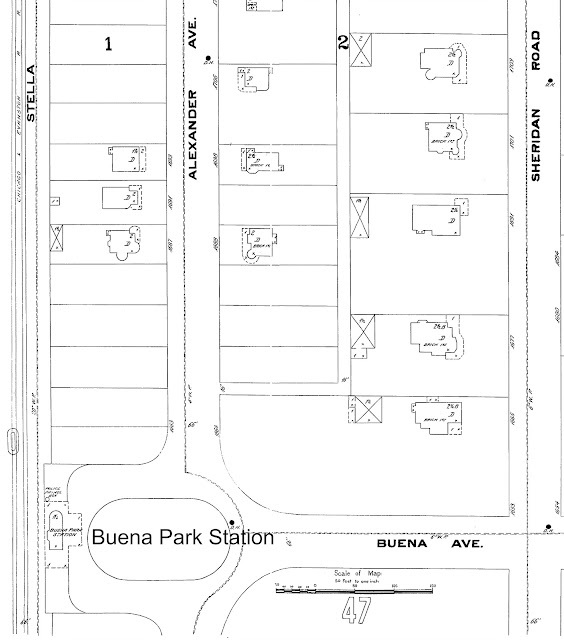 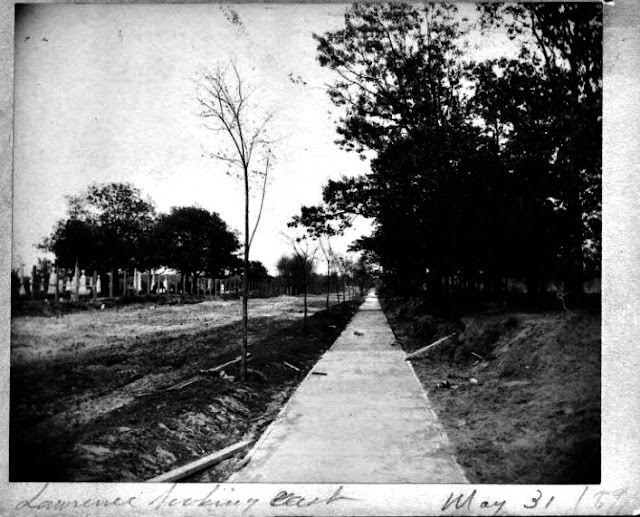 All most all property was purchased and farmed; subdivisions developed not only along Green Bay Road (Clark Street) but Little Fort Road (Lincoln Avenue) and Evanston Avenue (Broadway Avenue) - that lead to the construction of the Huntley House to be later called the Lake View Hotel on the then existing lakefront ... that at time, was the center of early real estate activity for the township in a subdivision called Pine Grove - that in turn would create the most popular neighborhoods in the City of Chicago. 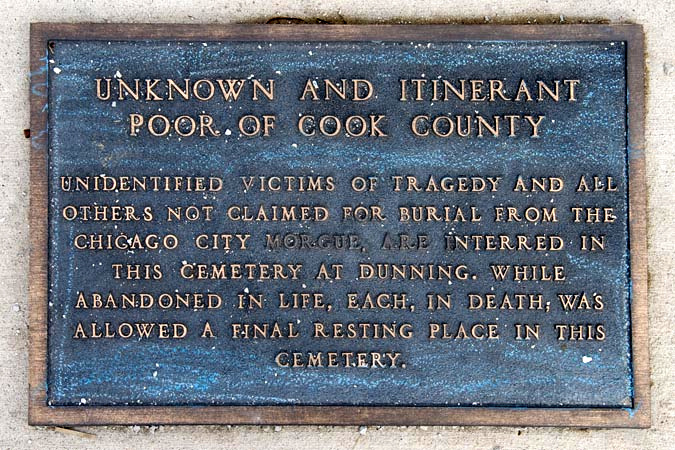 'Prior to 1835 this city had no stated place for the interment of the dead. 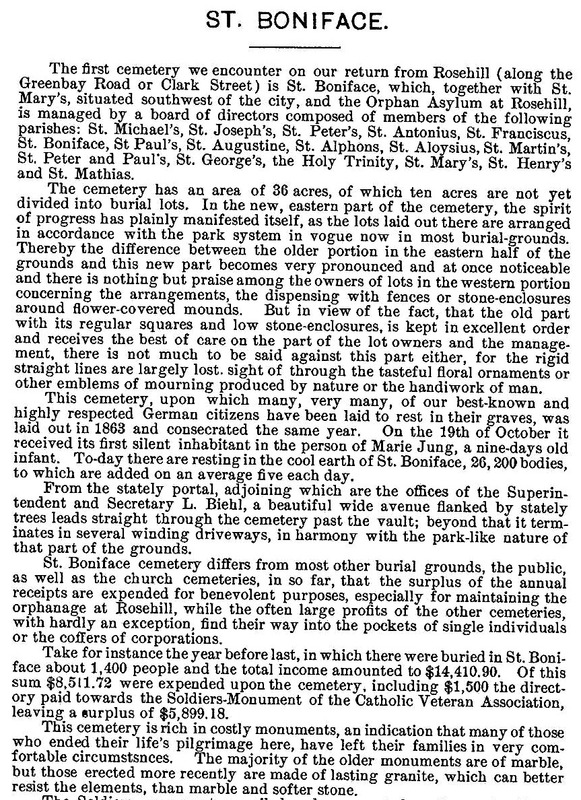 Up to that time the friends and relatives of the deceased buried them in some convenient spot near their homes Then as time passed the people living near the forks of the river had a common piece of ground where they buried their dead. 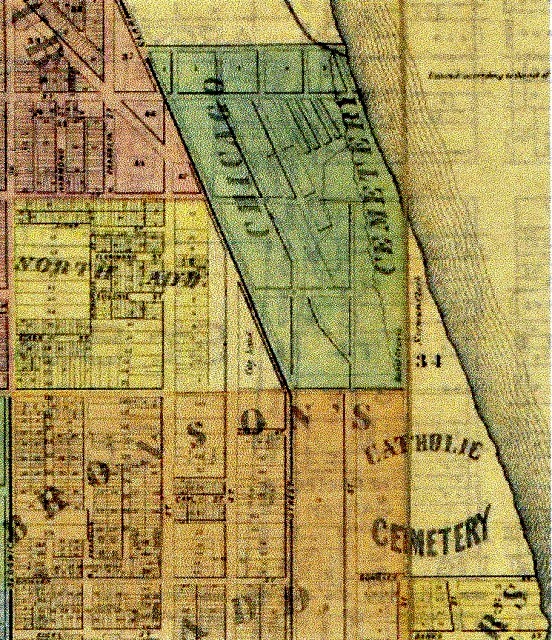 The bodies from old Fort Dearborn mostly found a resting place north of the main river and east of the old dwelling in which John Kinzie lived. 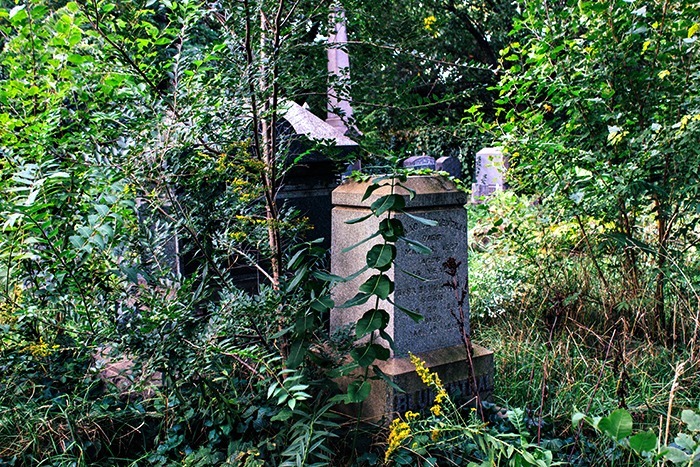 Here too the latter was buried in 1828 but in 1835 his bones were disinterred and removed to the North Side cemetery which was situated where today the north side pumping station is standing but even there they found no rest for in 1842 they were again taken up and transferred to the Lincoln Park Cemetery from where they were removed to their last resting place in Graceland In 1832. There was a small burying ground near the northwest corner of Wabash Avenue and Lake Street and there the soldiers who died of cholera in that year were interred. 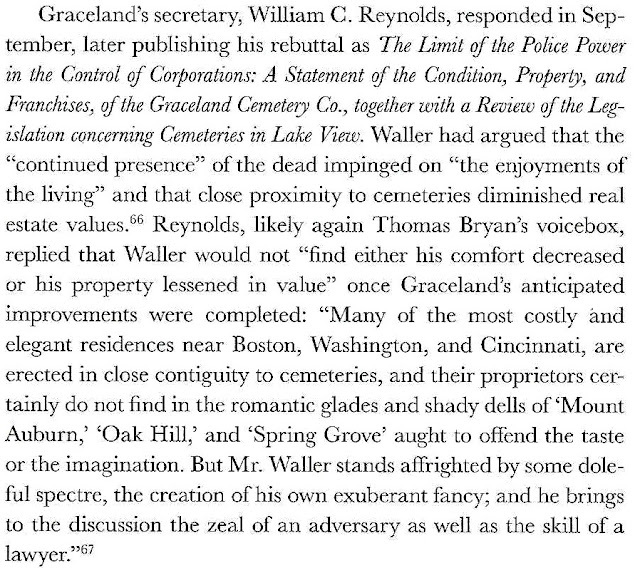 Quite a number of deceased persons were buried along the banks of both branches of the river and it frequently happened in later days that the workmen employed in excavating came across forgotten graves without being able to ascertain whose remains the moldering coffins contained. 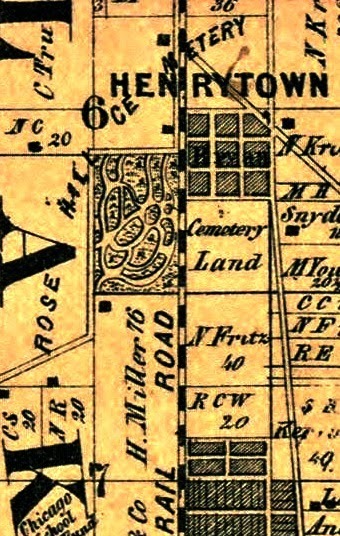 In the summer of 1835 the official surveyor of the town was commissioned to select and survey two pieces of ground that could be used for cemetery purposes one of the tracts situated in the south division of the city to contain sixteen acres the other which was to be established on the North Side to have an area of ten acres. 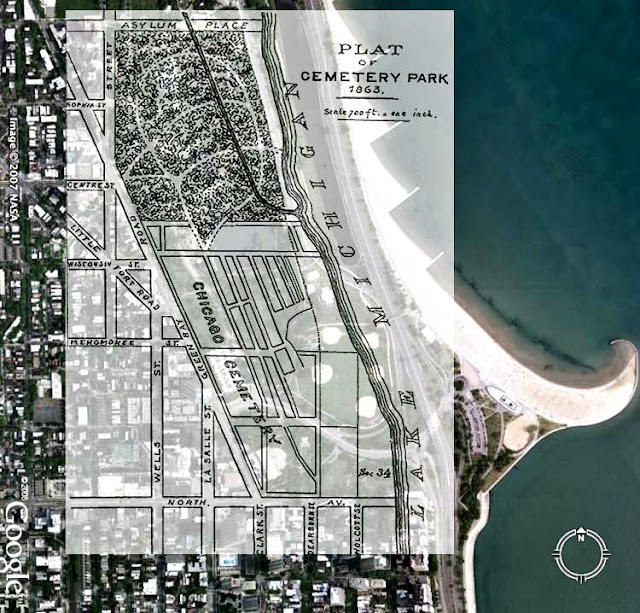 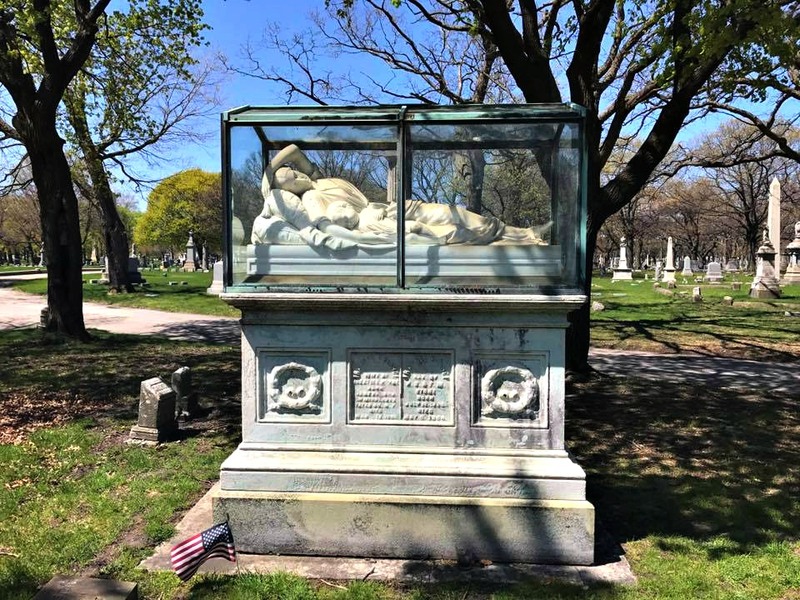 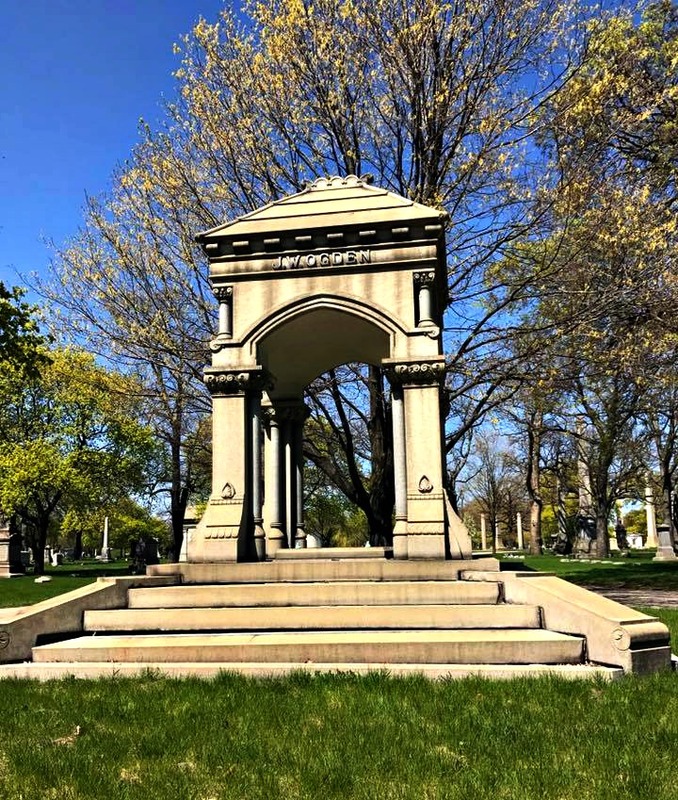 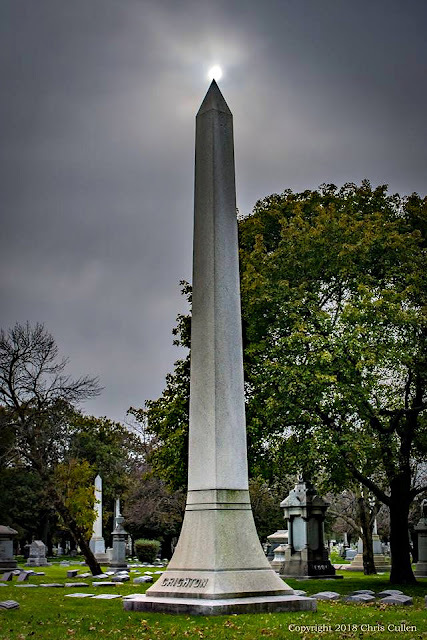 These were the first regular cemeteries of Chicago and they were located as follows on the south side near what is today Twenty third Street and the lake shore on the north side near Chicago Avenue and immediately west of the lake shore. 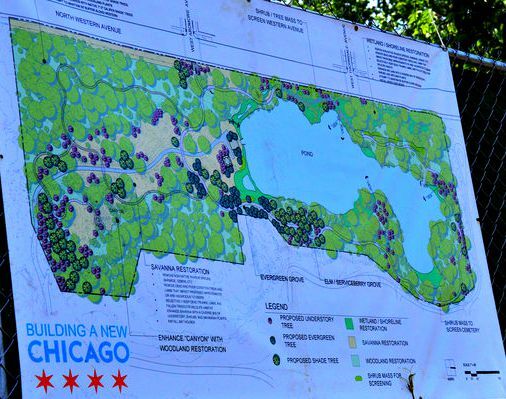 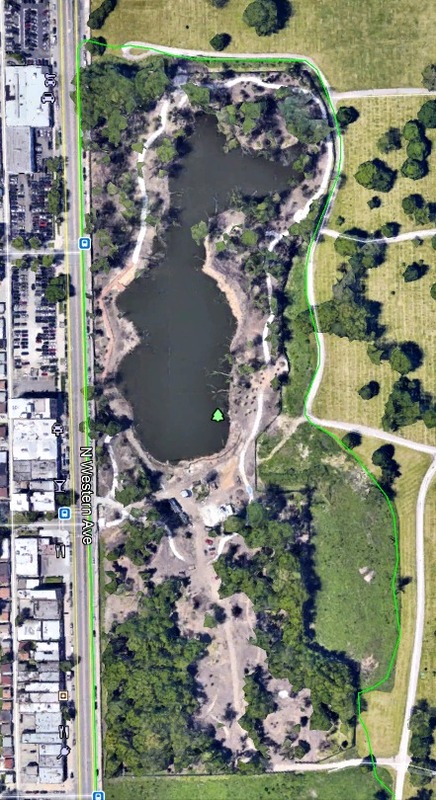 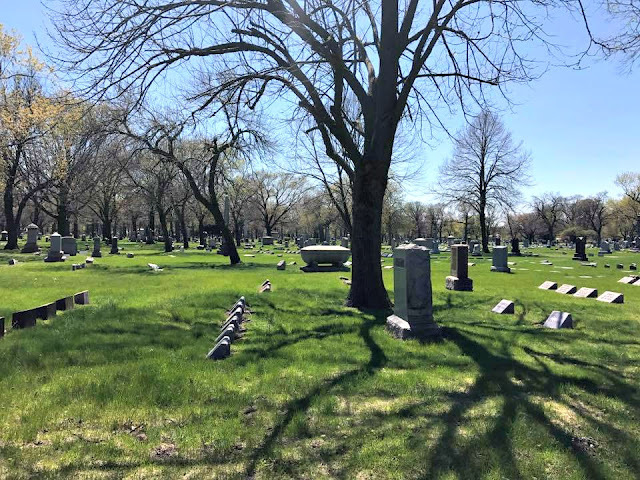 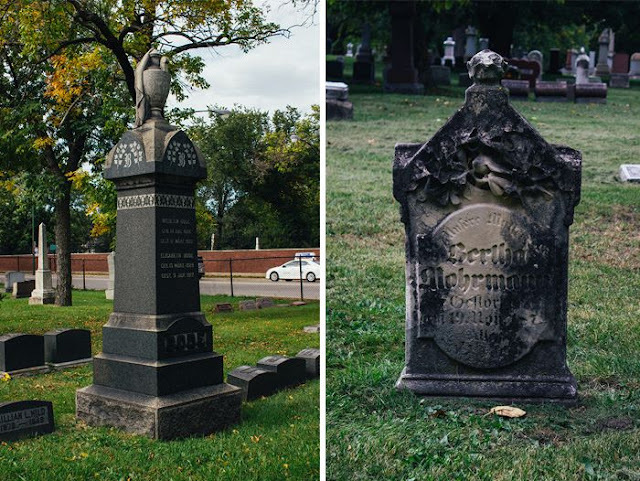 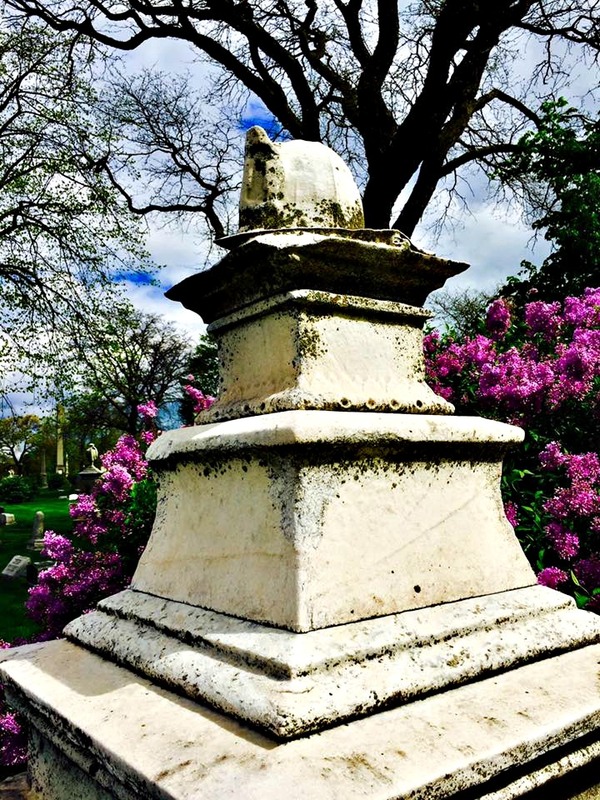 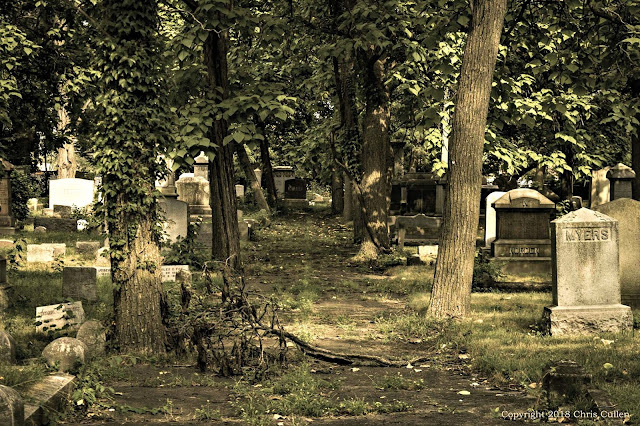 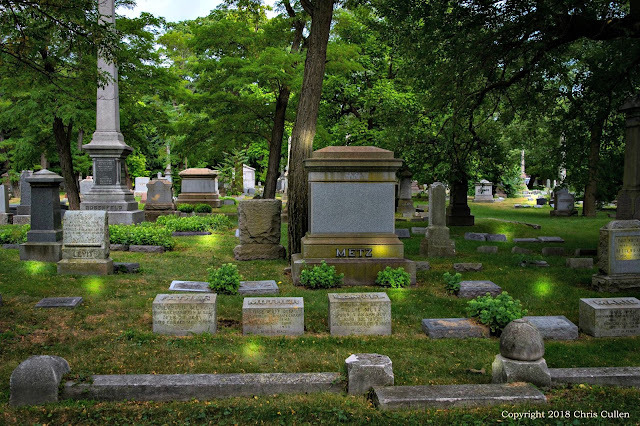 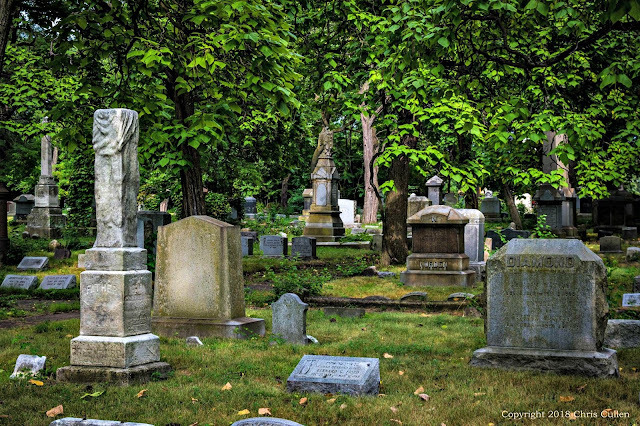 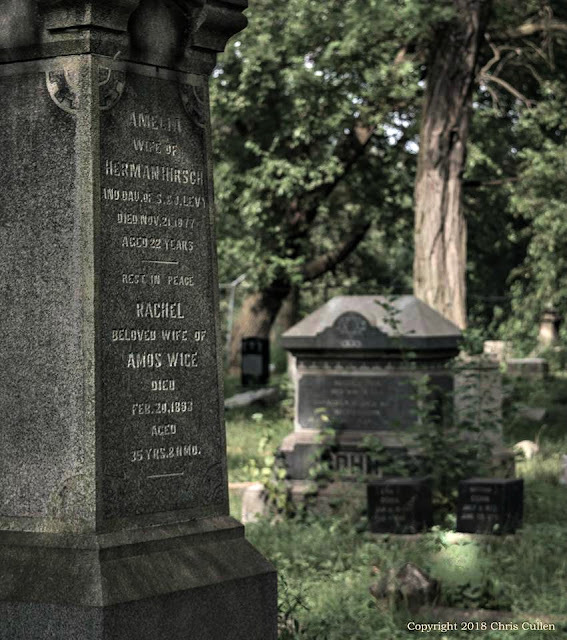 The cemeteries of the former township of Lake View would never have happen in the 19th century if it was not for a failure of the first north side cemetery within the City of Chicago that was simply called The Chicago City Cemetery. 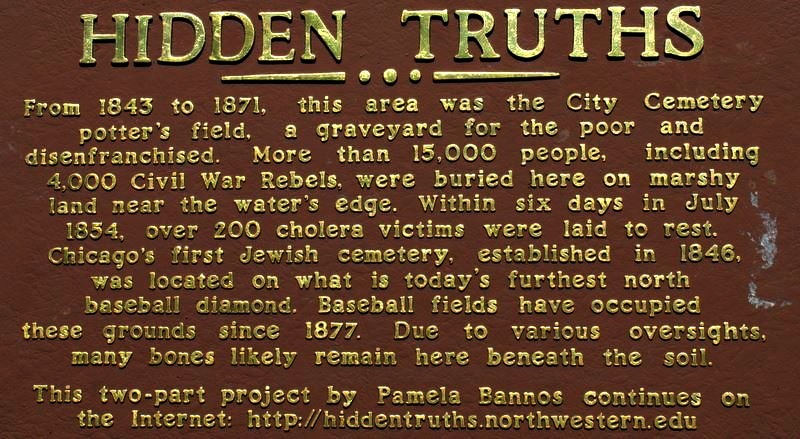 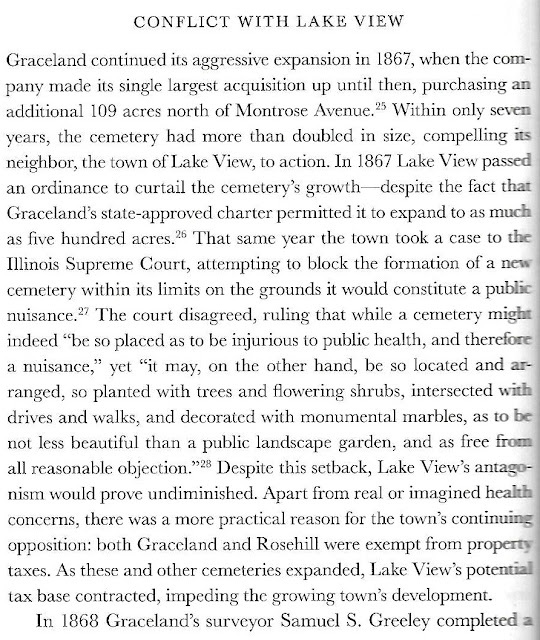 Constant and repetitive epidemics and the fear of the root cause of these epidemics would by 1866 outlaw interments in the Chicago Cemetery as well in the city limits. 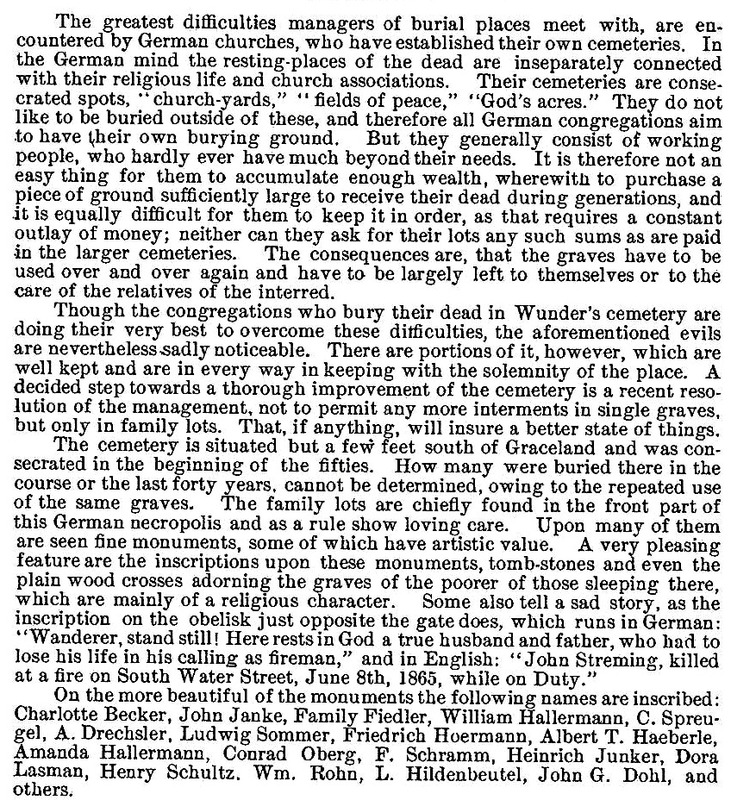 (of the graves) are dug deeper than four feet without coming to water, and many still less, particularly in what is called the public part of the City cemetery.” Doctor Rauch continues to stated that “The drainage into the lake from every portion of these cemeteries will be appreciated from their proximity to it, and from the topography of the ground, and the sandy nature of the soil, resting as it does upon a stratum of clay impervious to water, so that when it rains the water percolates through the sand and the decomposing mass of animal matter until it comes to the clay, whence it is carried directly into the lake”. 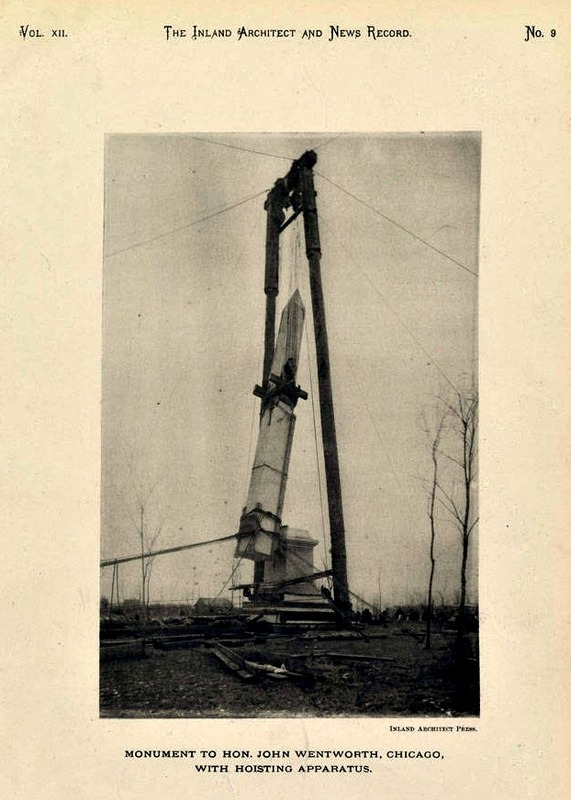 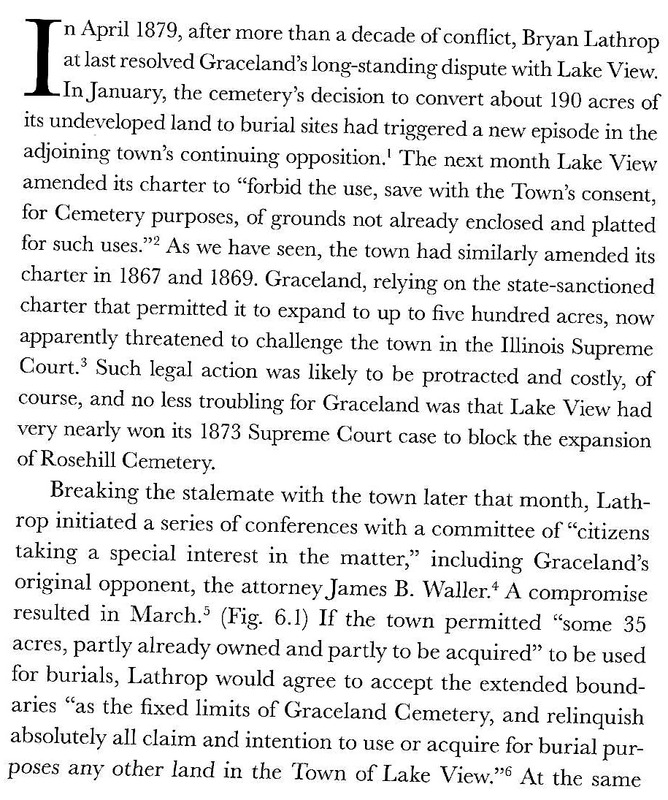 Doctor Rauch findings were finally published in 1866 beginning a movement of construction of cemeteries miles from lakefront and along a high elevated ridge along Green Bay Road (Clark Street) in the most rural area of Lake View Township. 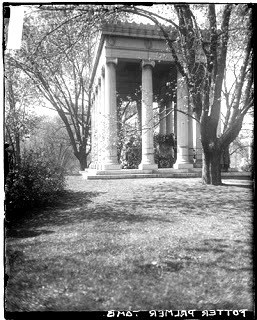 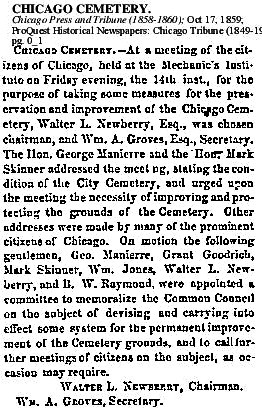 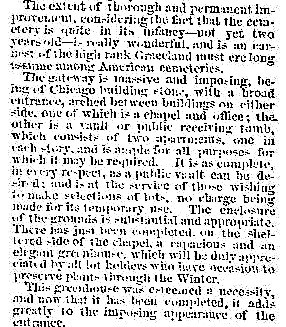 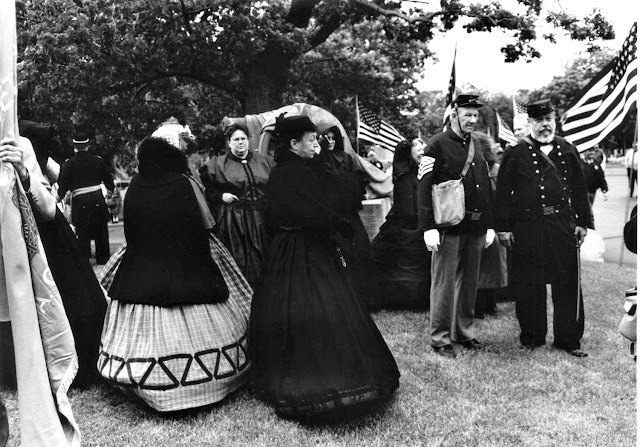 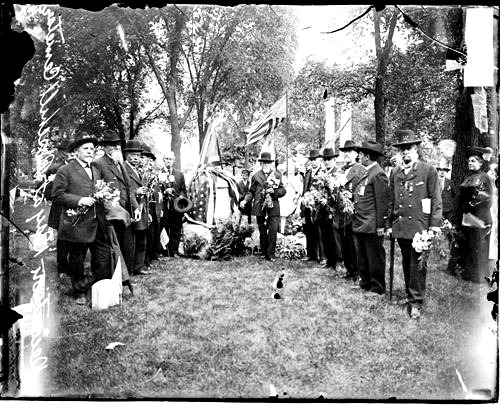 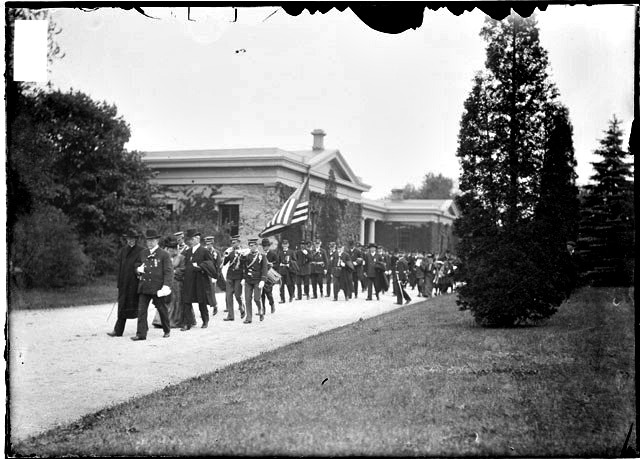 There was city-wide meeting about saving and improving the cemetery space in 1859 by Walter Newberry but by 1869 the old cemetery would be annexed into the existing park to the north called Lincoln Park that was formally established one month after President Lincoln's death in 1865 by the City of Chicago. 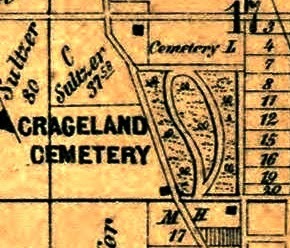 Burials ended in 1866.
map locator of the Couch Mausoleum. In the years 1850 to 1857 there was a township called Ridgeville. Ridgeville Township was subdivided mostly into Evanston and Lake View townships in 1857. 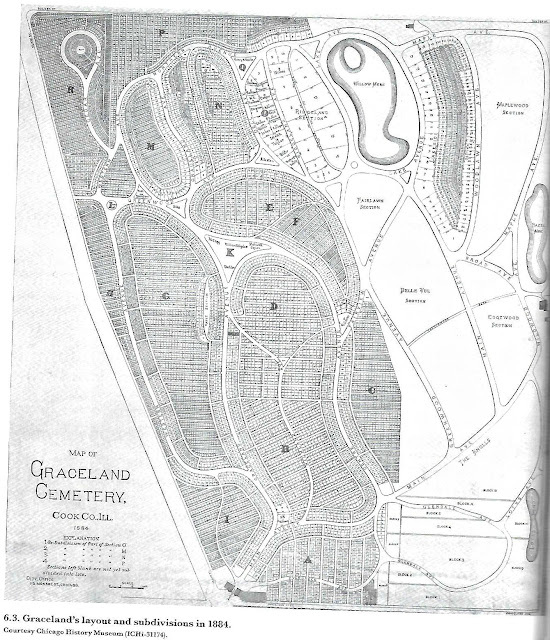 There was space for the dead that did not include a church graveyard or someone's backyard in the old township. 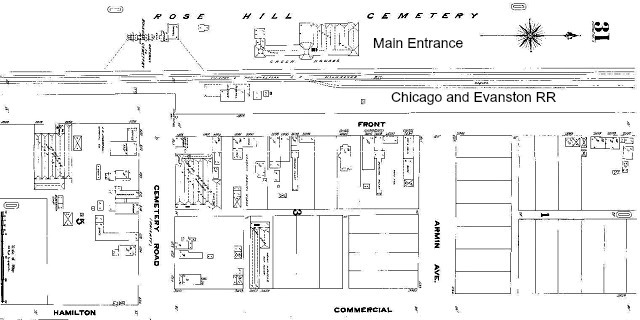 According to Chicago and Cook County Cemeteries this cemetery was "once located the northwest corner of Ridge and Greenleaf Avenues. 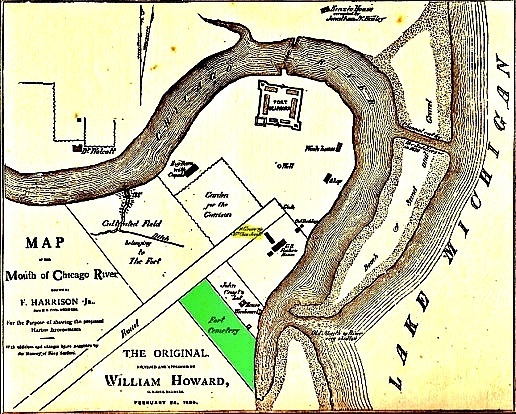 A Henry Clarke bought eighty acres of land from the Government on September 28, 1840. 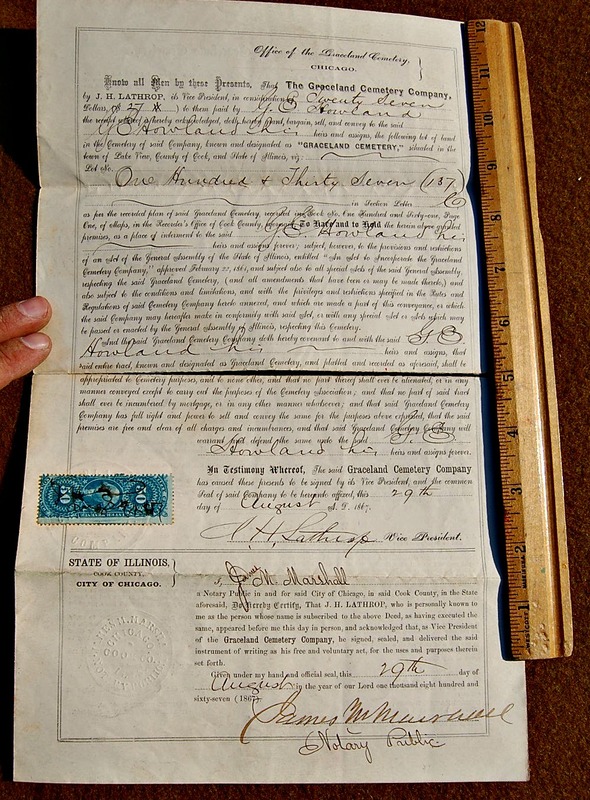 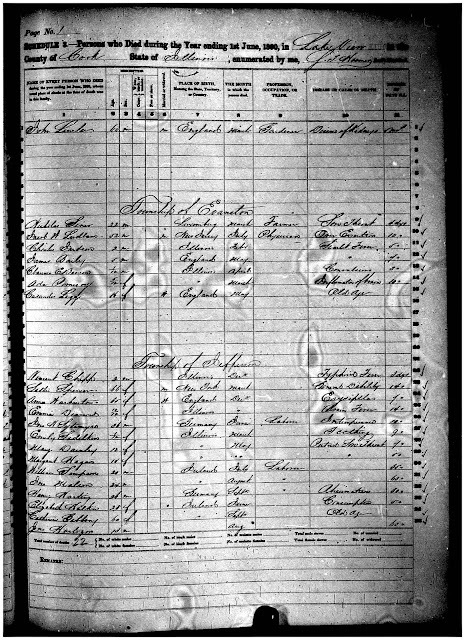 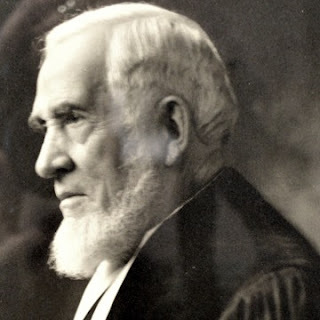 He and his wife, Lorinda were granted a land patent on March 10, 1843. 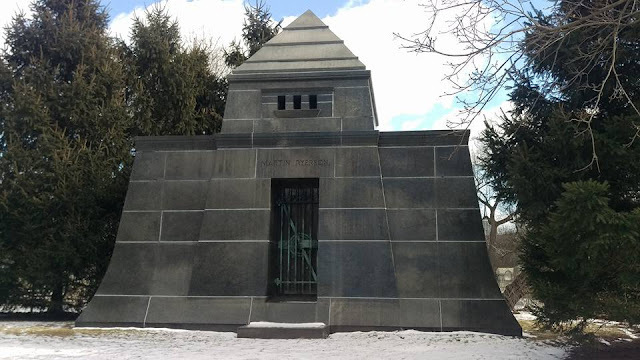 Henry Clark deeded approx. 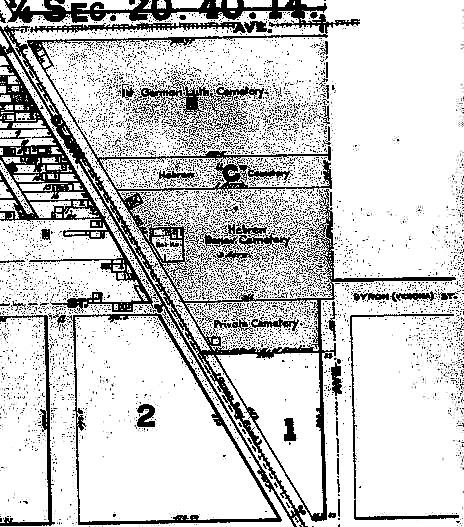 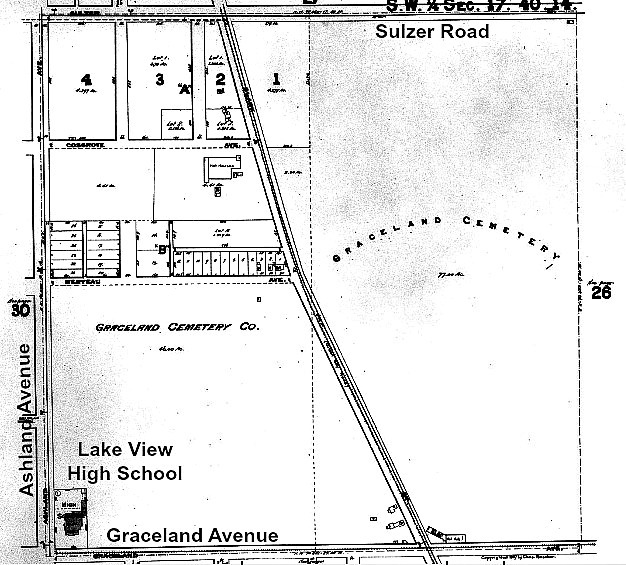 one-half acre of this land to the township trustees on December 2 1846, for use as a cemetery and school, described “for the quick and the dead.” The property is described on various documents as being of slightly different size. 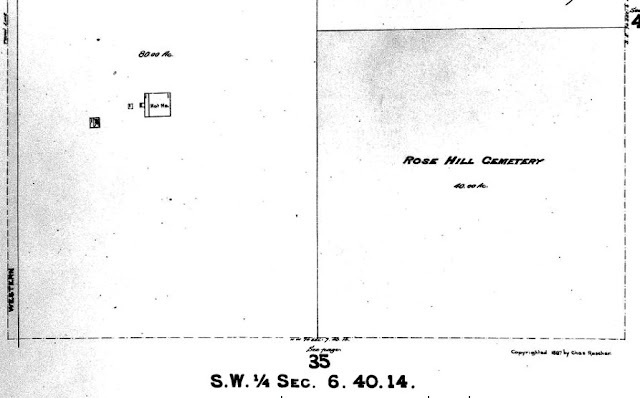 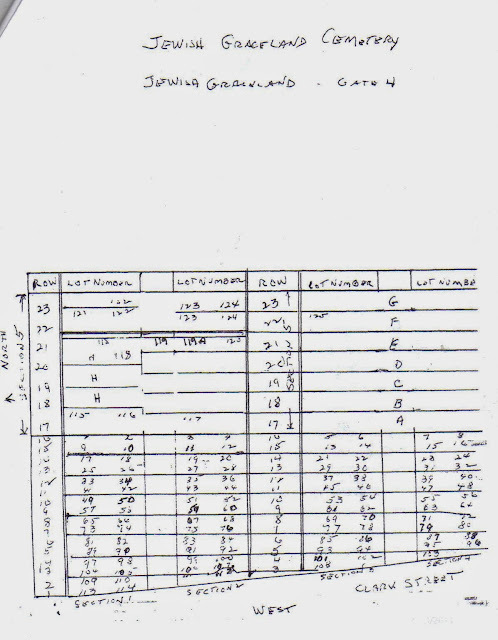 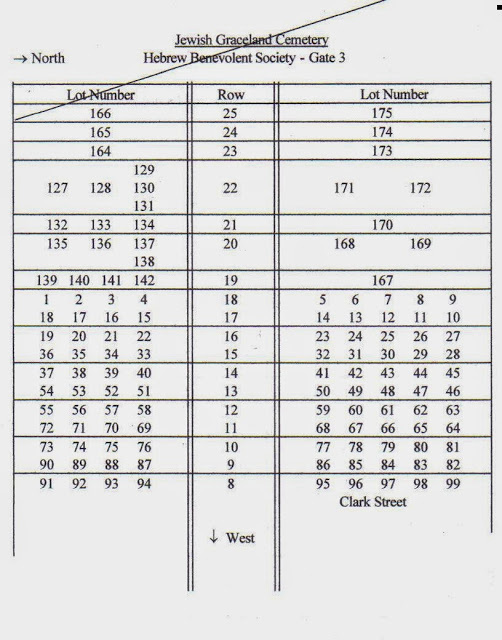 One document shows .55 acre, 22 rods (363′) by 4 rods (66′). 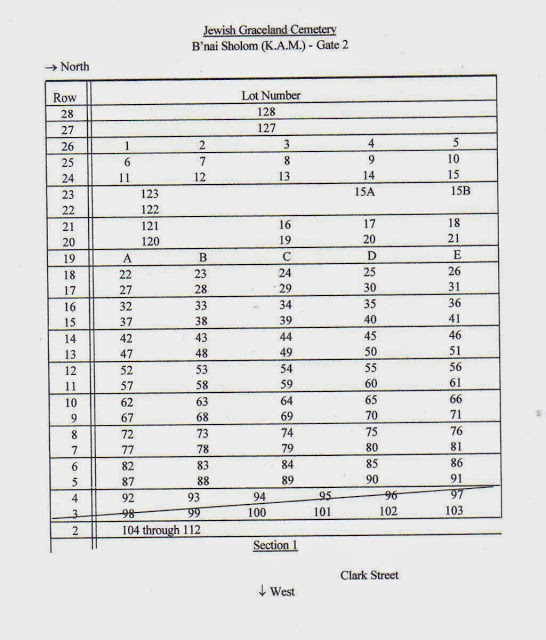 Another document described the property as being forty chains (264′) by 1 chain ‑ 25 links (82.5′). 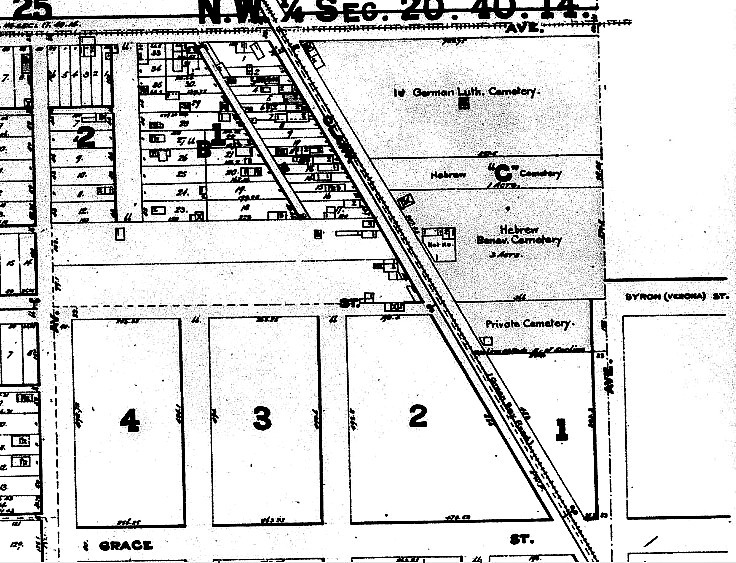 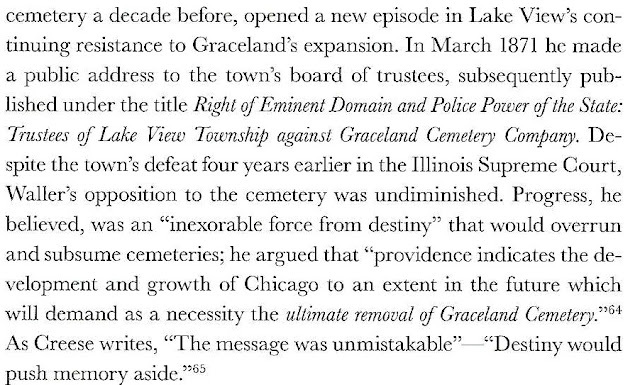 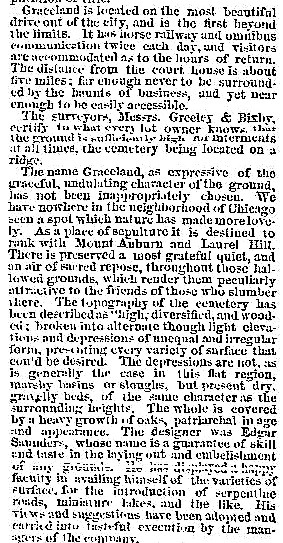 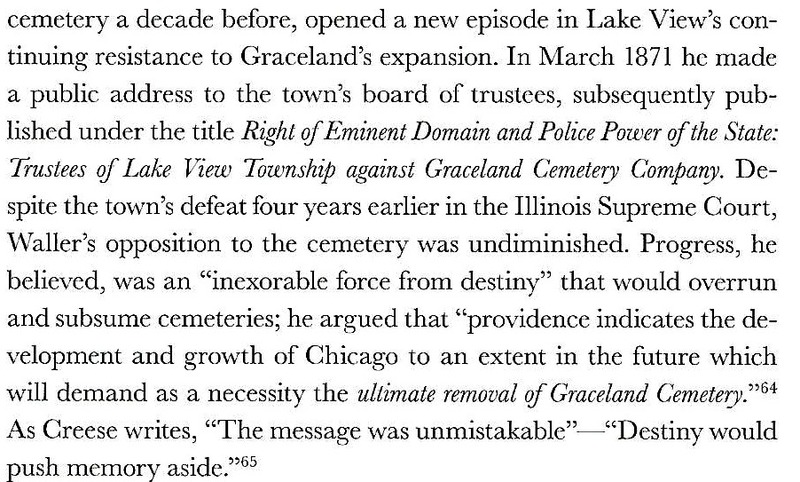 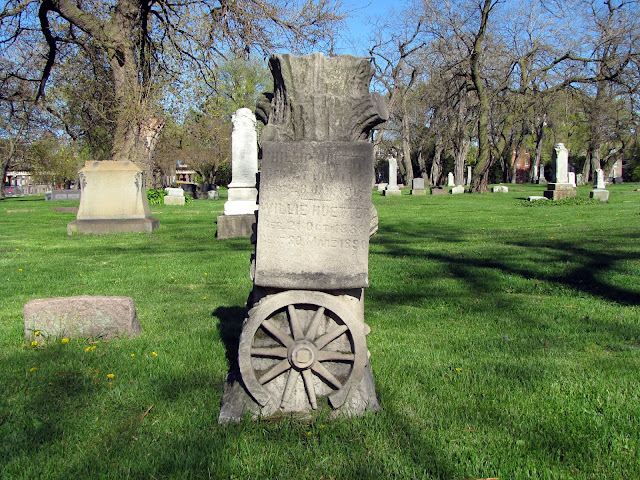 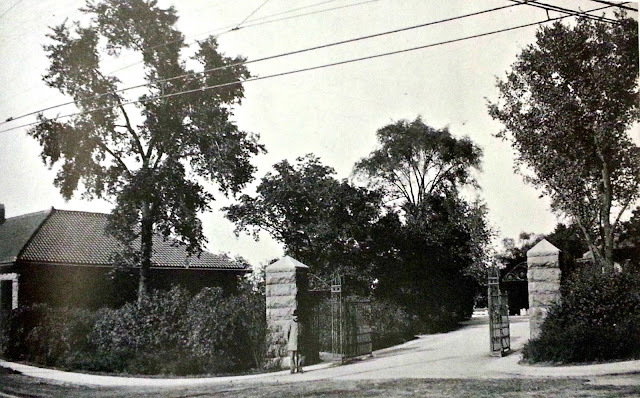 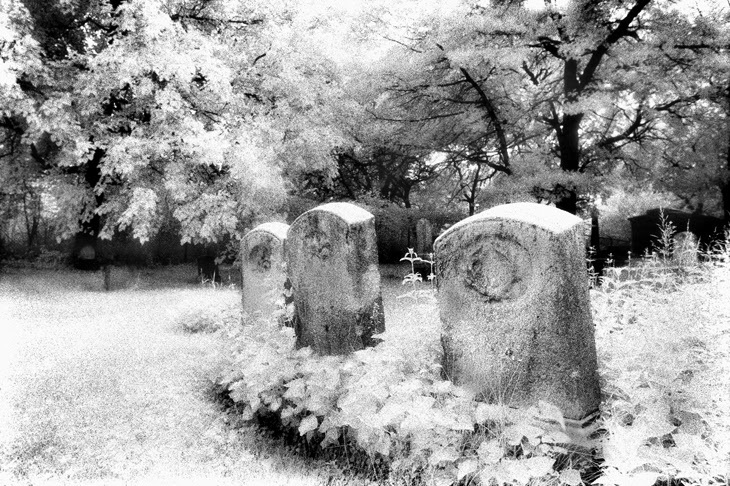 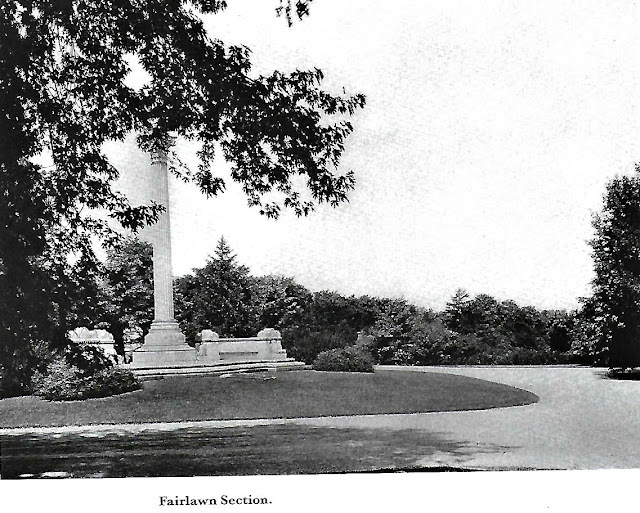 When the city of Evanston was platted about 1853, the cemetery lot fell outside the Evanston City limits. A log school house and meeting house, used for school, social events, and for Sunday worship. was called the Grosse Point School house, and was built by Samuel Reed about 1841 or 1842. 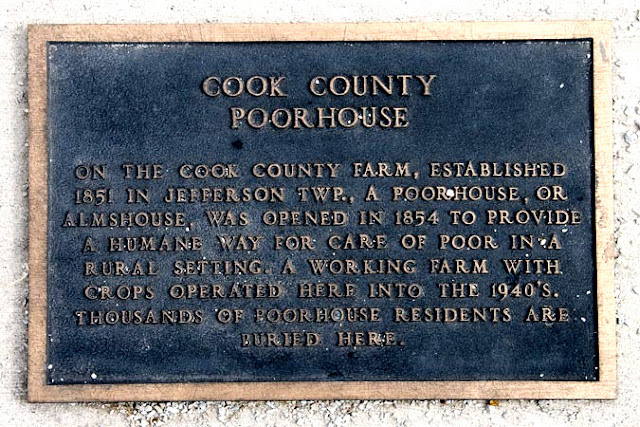 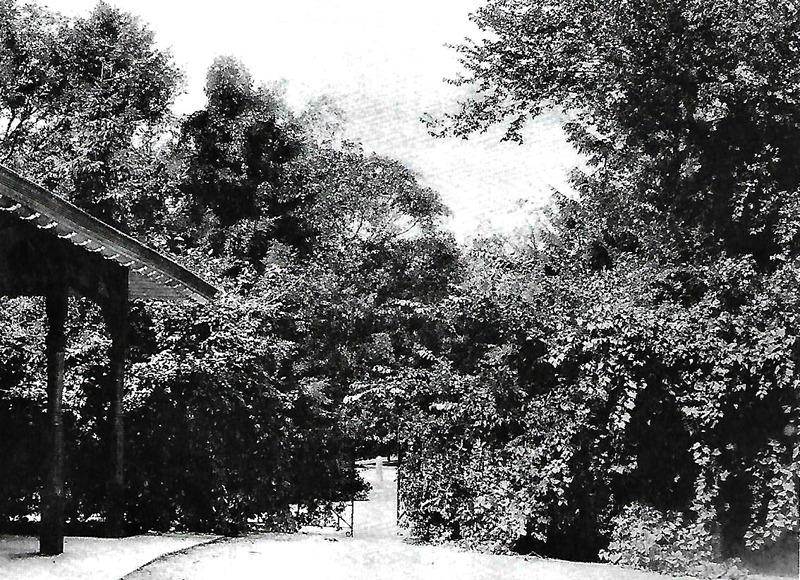 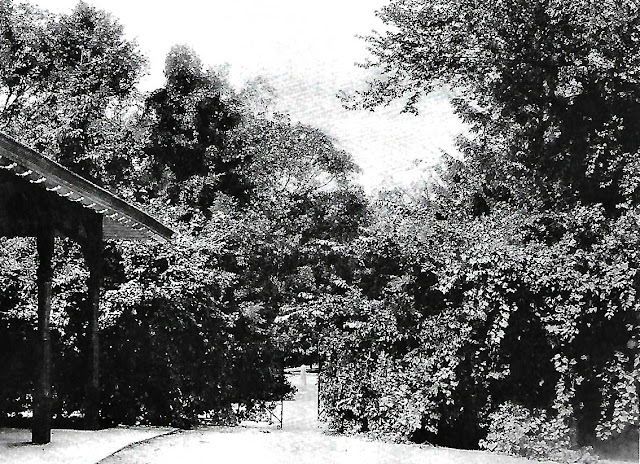 It was believed to be located on the southeast corner of the property. The cemetery was on the rear (west end) of the lot, between Greenleaf and Lee Street. 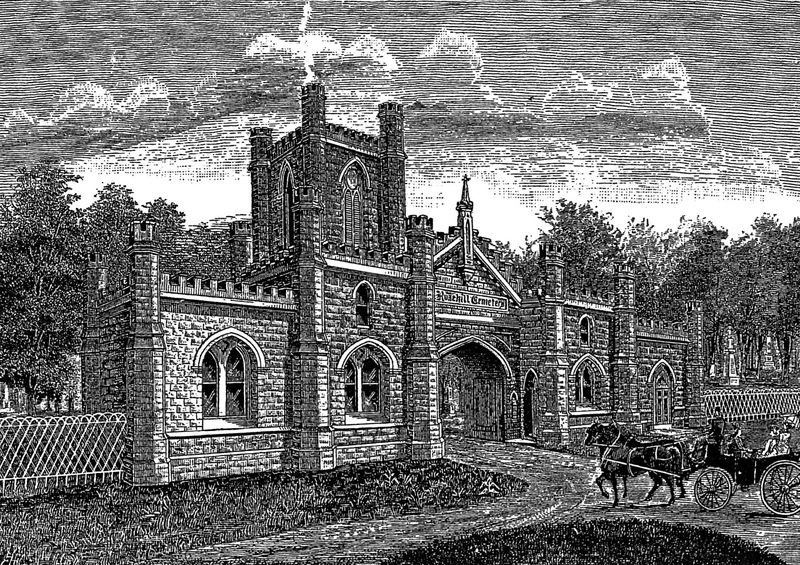 The First Methodist Episcopal Church began here, conducting services at the school house between 1846 and 1855. 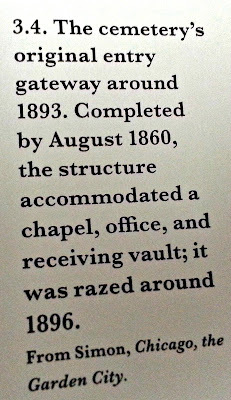 They shared the building with others including the Baptists and the Presbyterians. 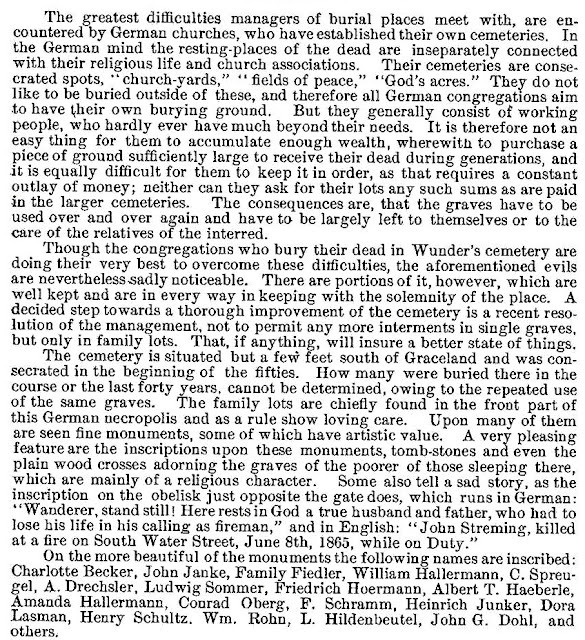 Historical accounts refer to parishioners visiting the cemetery after Sunday services to tend to the graves of their loved ones. 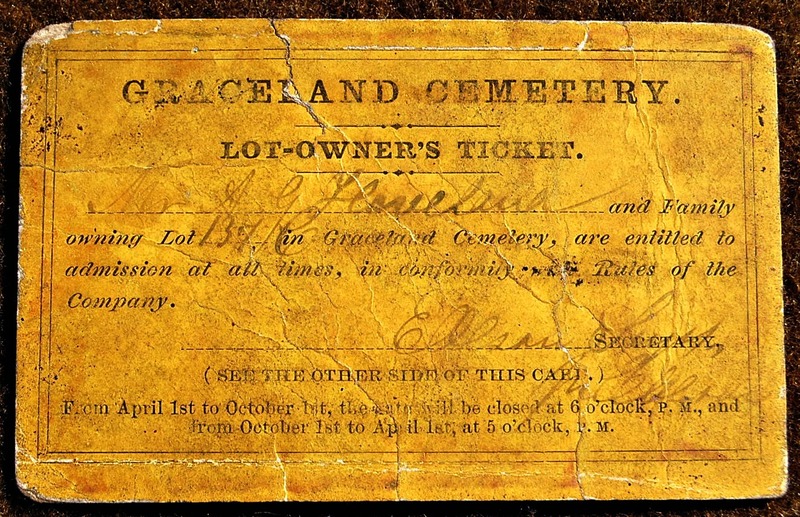 Cemetery lots were sold for two dollars each. Each lot would contain space for ten graves. By 1890 most bodies were removed to another cemetery not specified in historical accounts. 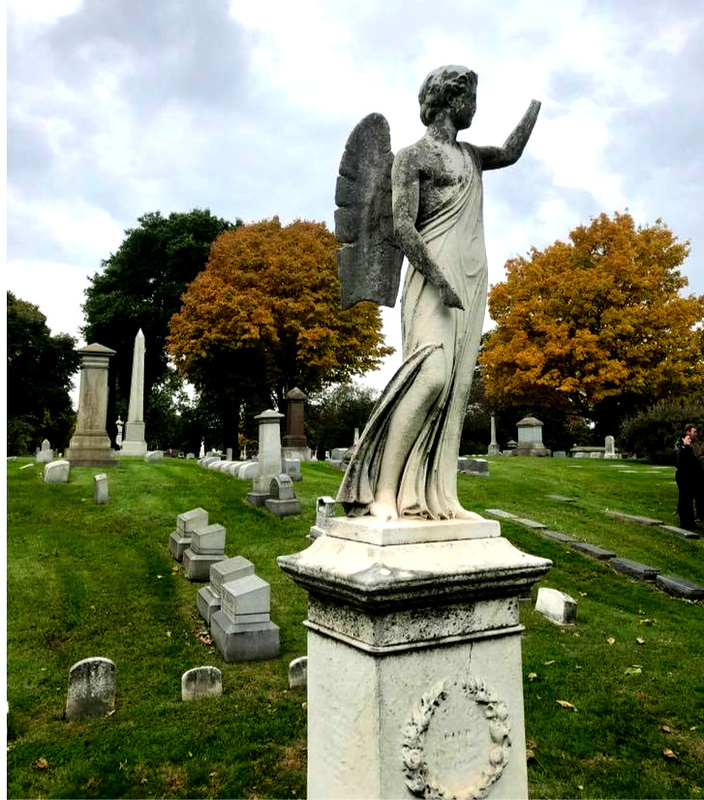 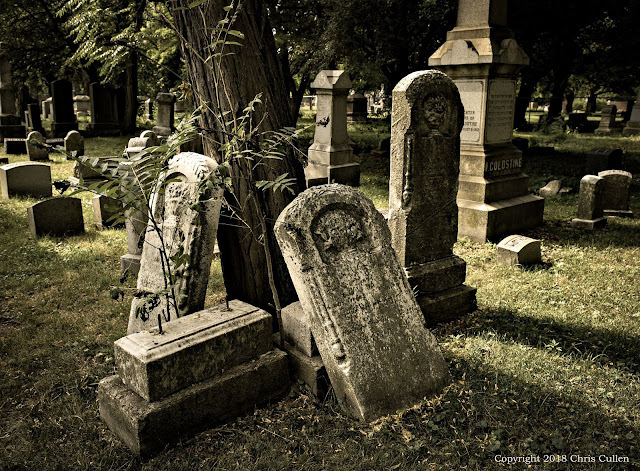 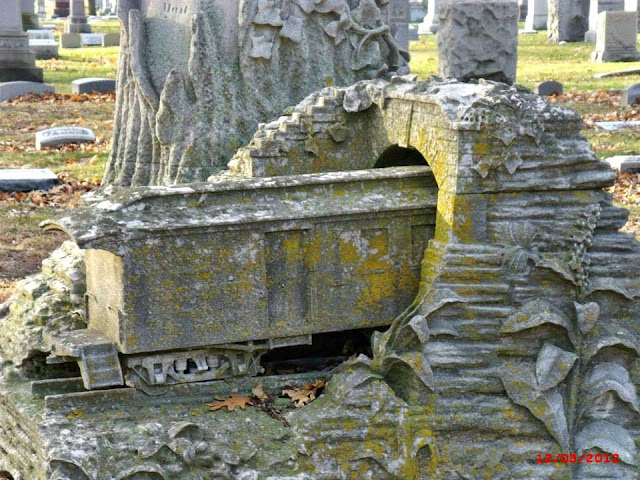 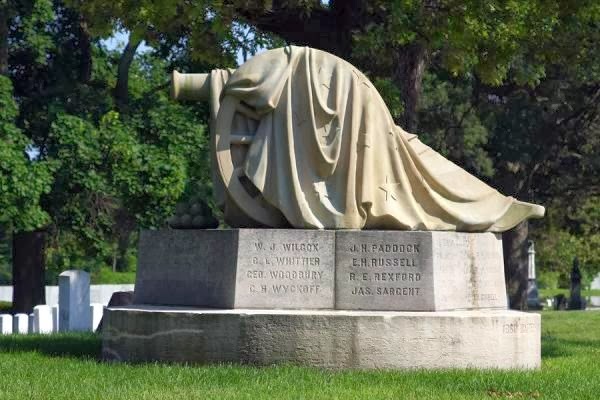 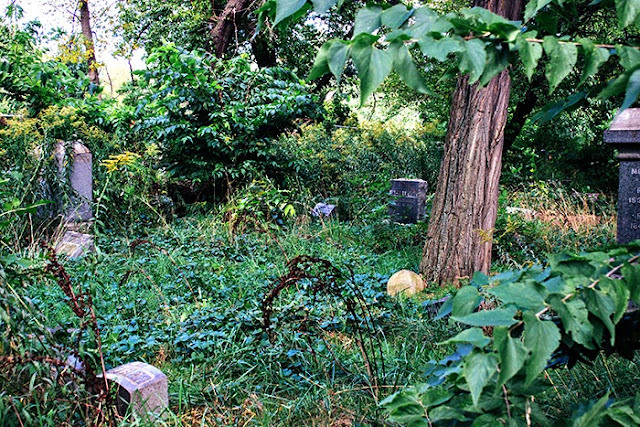 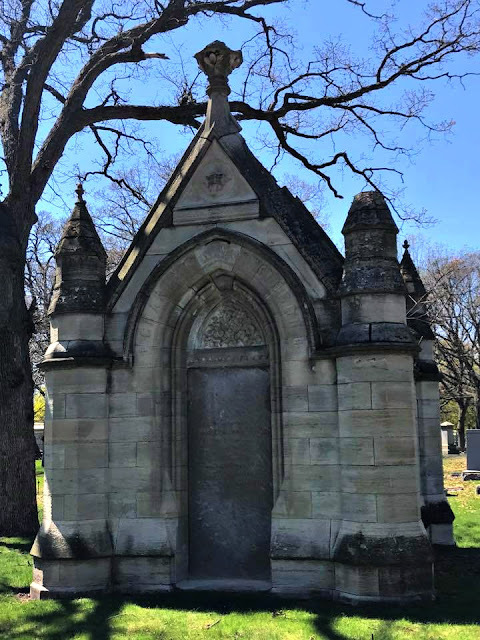 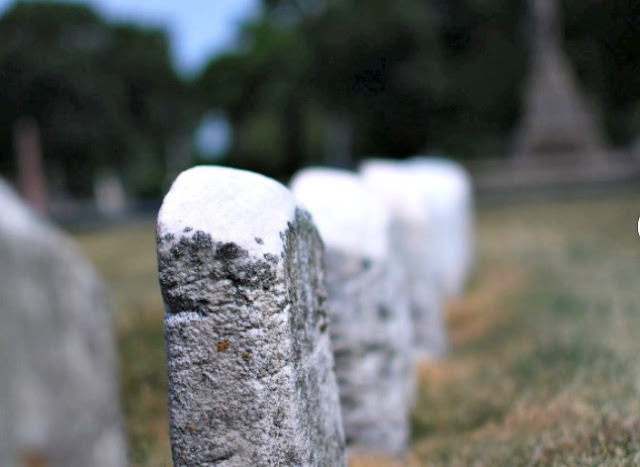 The cemetery had been in such poor condition that the City of Evanston prepared an ordinance declaring the cemetery a nuisance. 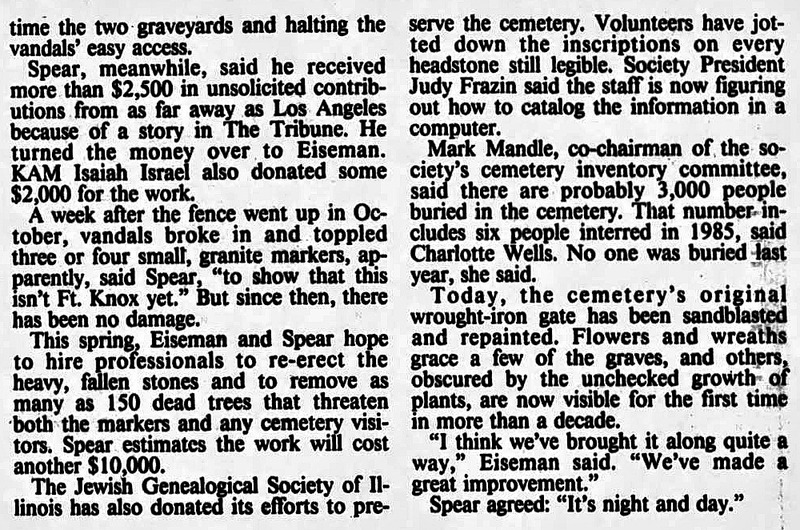 It was stated that the cemetery had been neglected for many years. 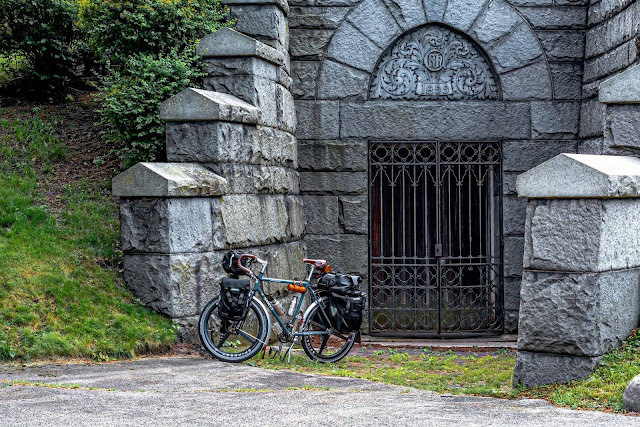 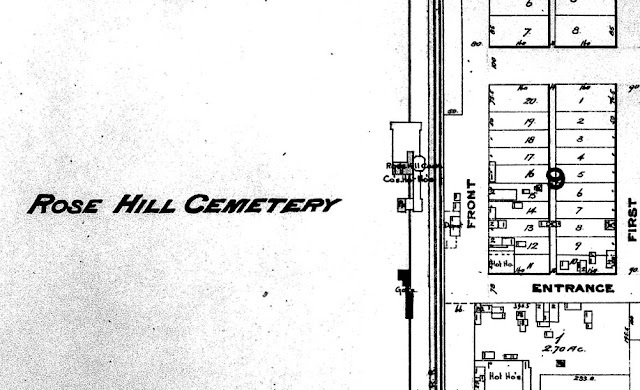 In 1900, workers found two skeletons from this cemetery while digging a sewer. 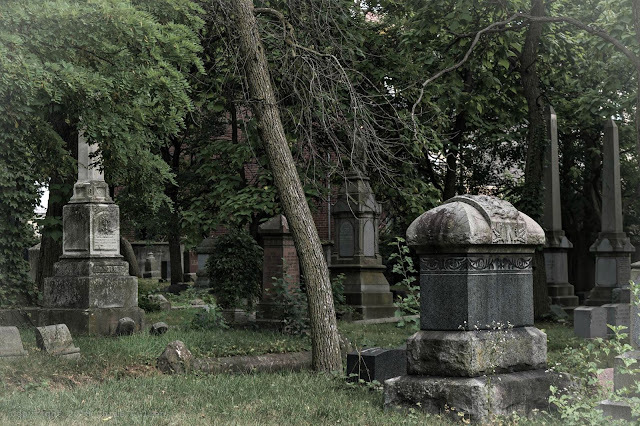 By this time the cemeteries on the north-side were firmly established within the City of Chicago. 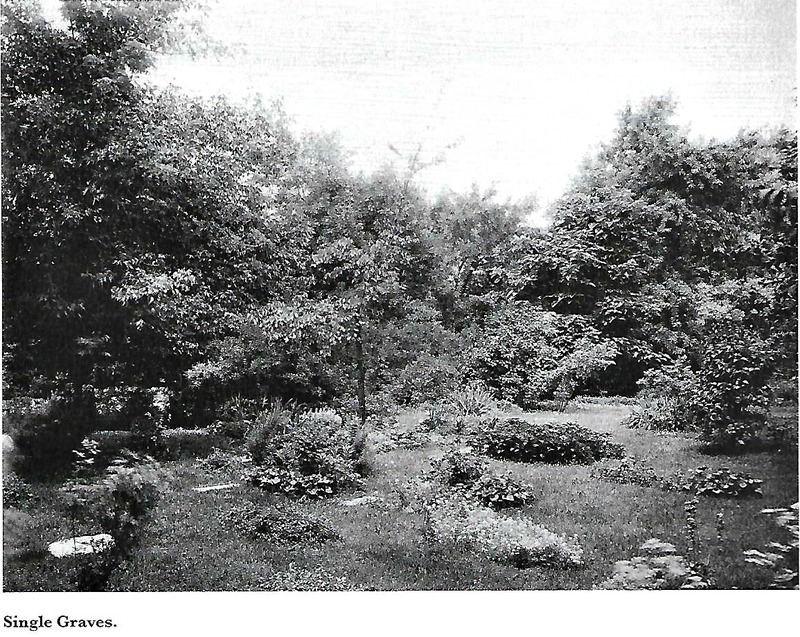 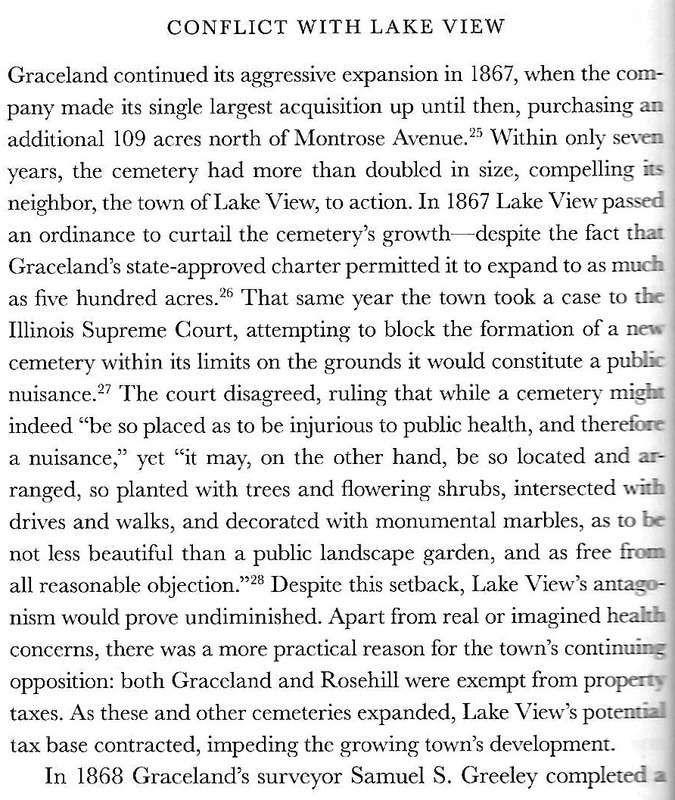 The Township/City of Lake View once had jurisdiction over a number of cemeteries between 1860 & 1889. 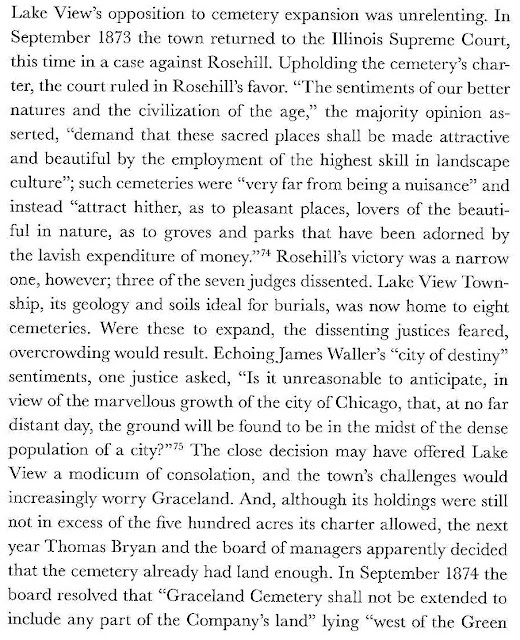 After the failure of ‘The Chicago Cemetery’ in the mid-19th century the high elevation in the old township was an ideal location to place a growing population of the departed – outside City of Chicago limits. 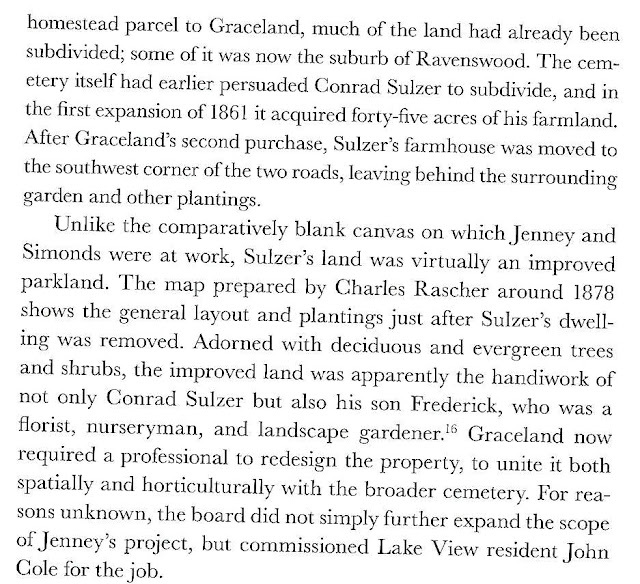 According to my readings most of the township/city of Lake View remained rural north of Irving Park during this time period with spots of urban development. 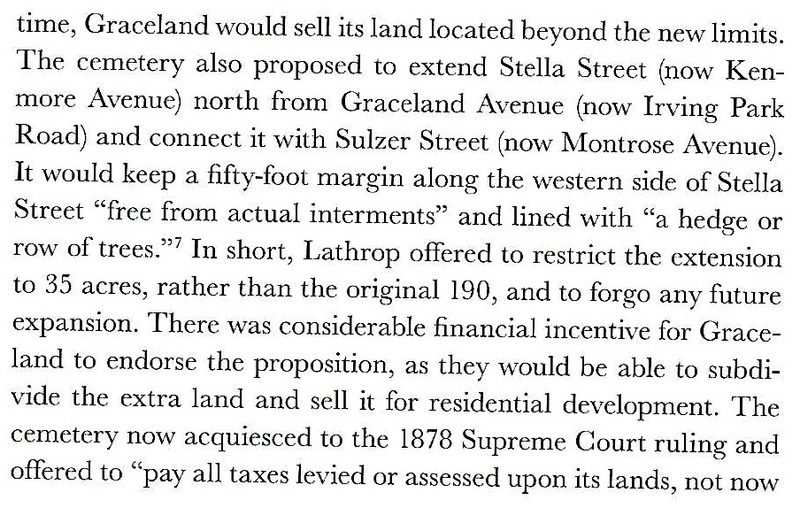 There was not an urbanization issue to contend with by the annexation of 1889 but will there bean issue by the mid-21st century in Chicago. 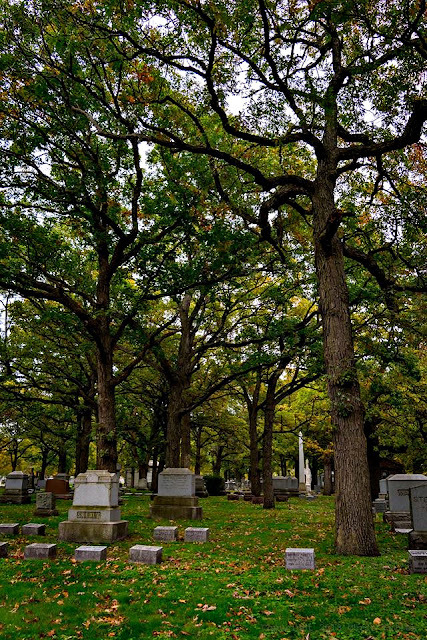 The City Council of Austin, Texas currently has this issue before them - pitting modern urbanization with the centuries old earth-print called cemeteries. 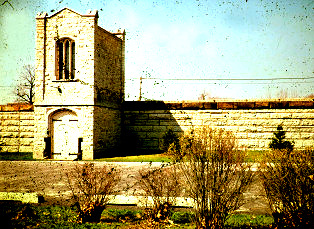 The newer Mt. 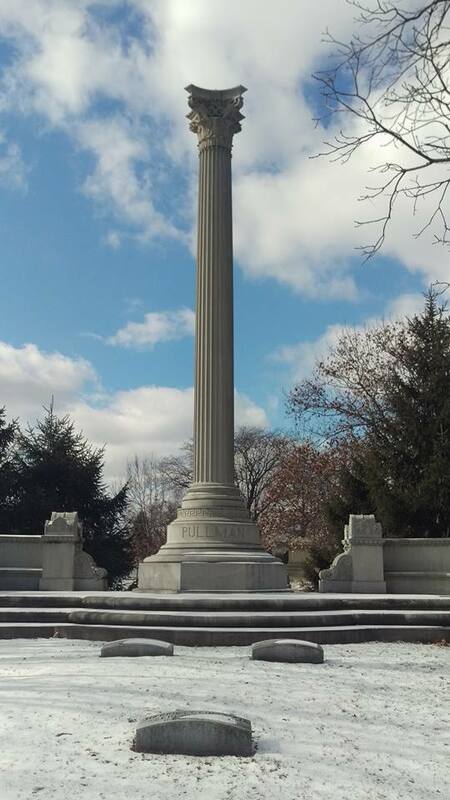 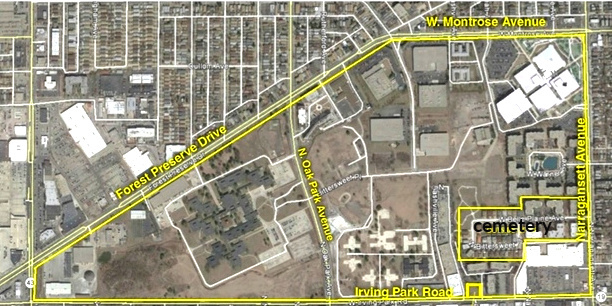 Mayriv is located within Zion Gardens (Cemetery) located at 6758 W Addison Street. 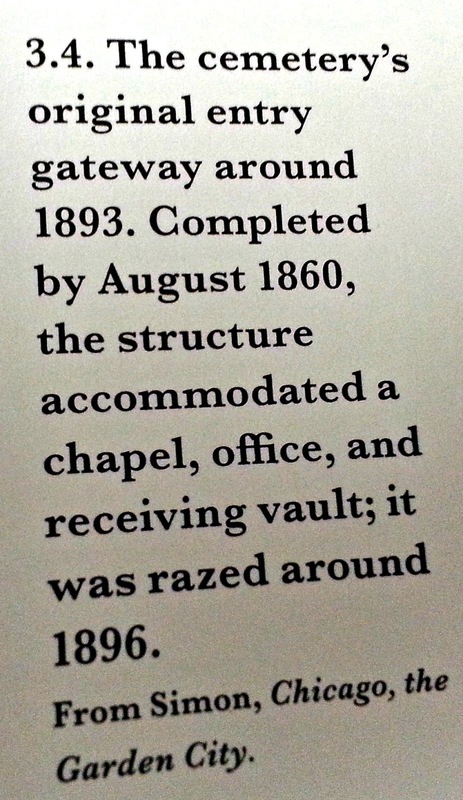 ‘In 1864, the remarkable East Gatehouse was built to house the cemetery administration building. 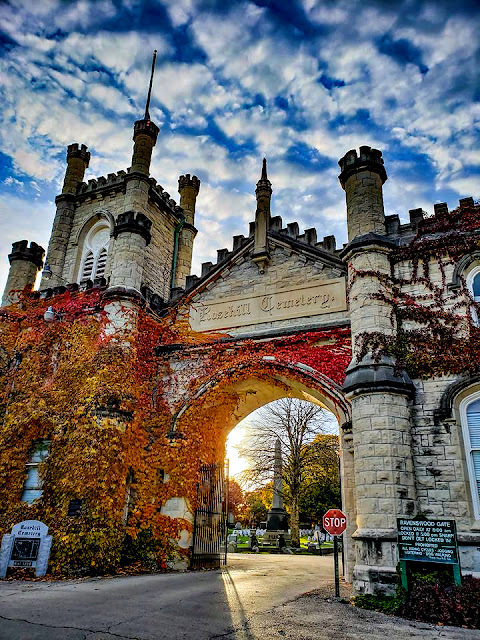 The architect was William W. Boyington; the style was “castellated Gothic.” The East Gatehouse was placed on the National Register of Historic Places in 1974. 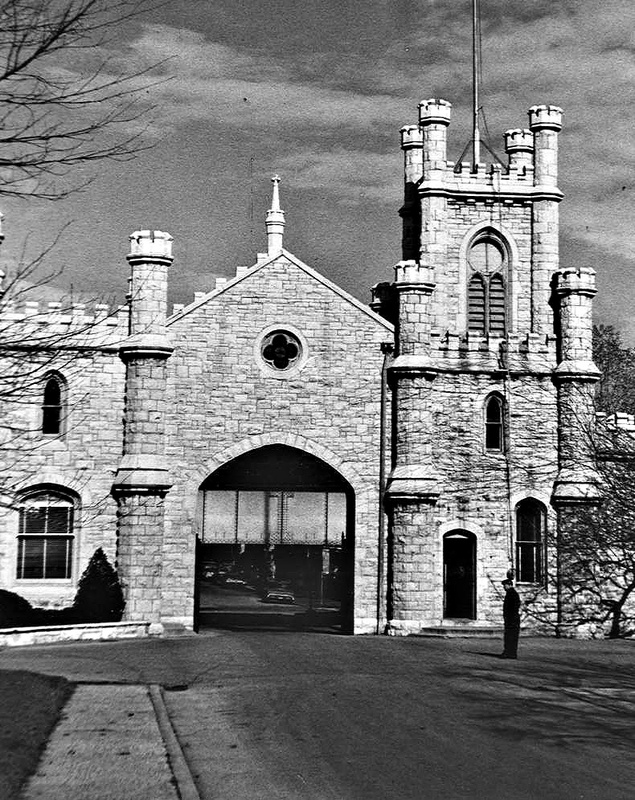 The National Register Report noted: “Examples of castellated Gothic are rare in the Midwest and this stone structure by Boyington, in being an exceedingly well designed example of the style, ranks among those few that still exist.” Castellated Gothic is a style of architecture easily recognized by Chicagoans familiar with another landmark - the old Water Tower and Pumping Station at Michigan and Chicago Avenues. 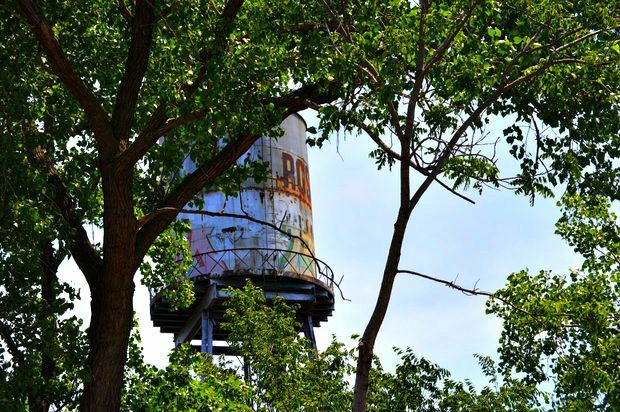 Designed by Boyington five years after Rosehill’s gatehouse, the Water Tower was the only building to survive the Chicago Fire in 1871. 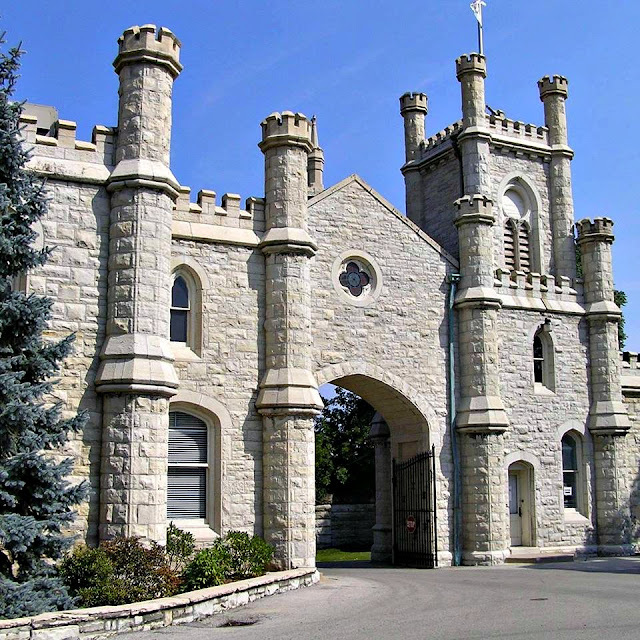 Castellation refers to the parapet design with alienating indentations and raised stonework reminiscent of a medieval castle. 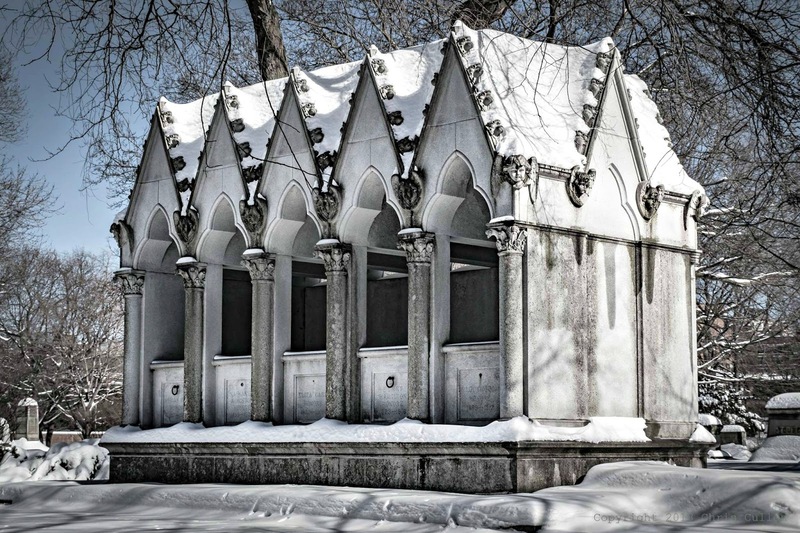 This Victorian Gothic style was a revival of medieval English architecture and was used for its picturesque effect. 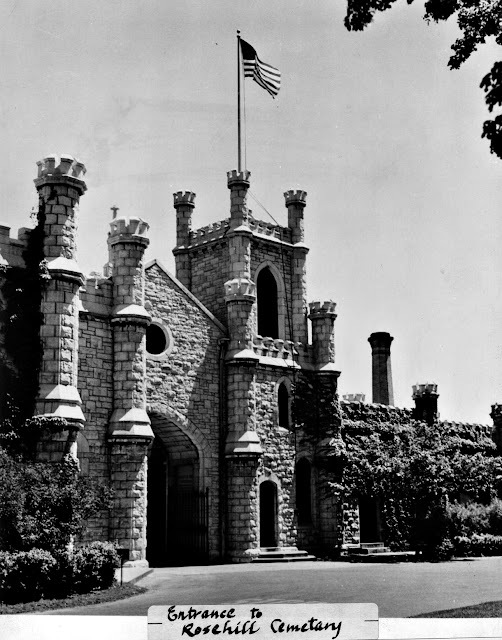 The building material chosen for the gatehouse was a buff colored limestone that came from the Joliet area. This same stone masonry construction can be seen in some early Chicago churches and in the foundations of some of the older homes in Edgewater. 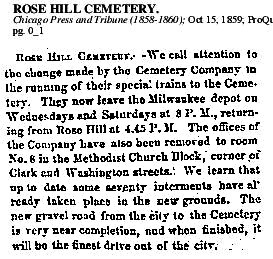 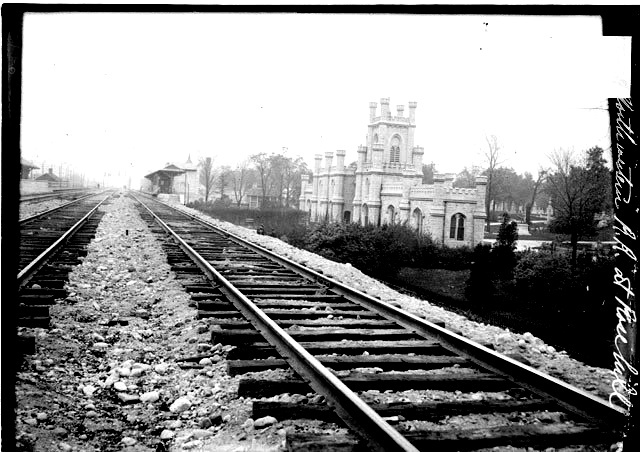 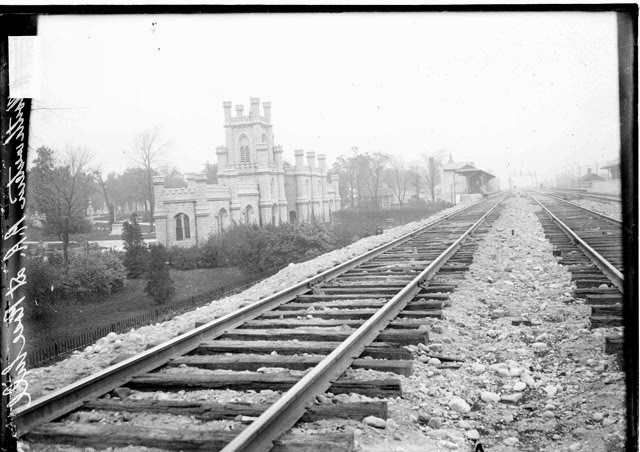 Adjacent to the cemetery’s East Gate, and built of the same stone, once stood Rosehill’s Chicago & Northwestern Railway Station. 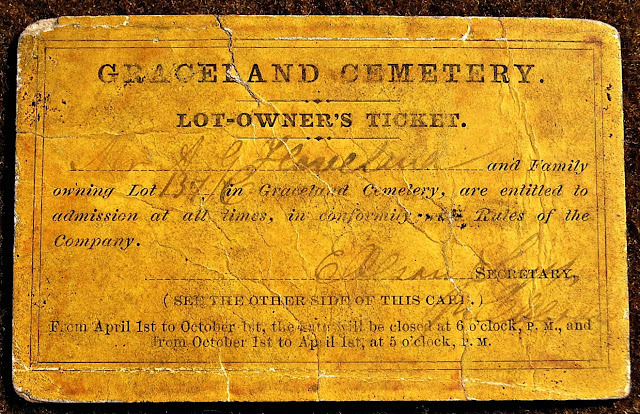 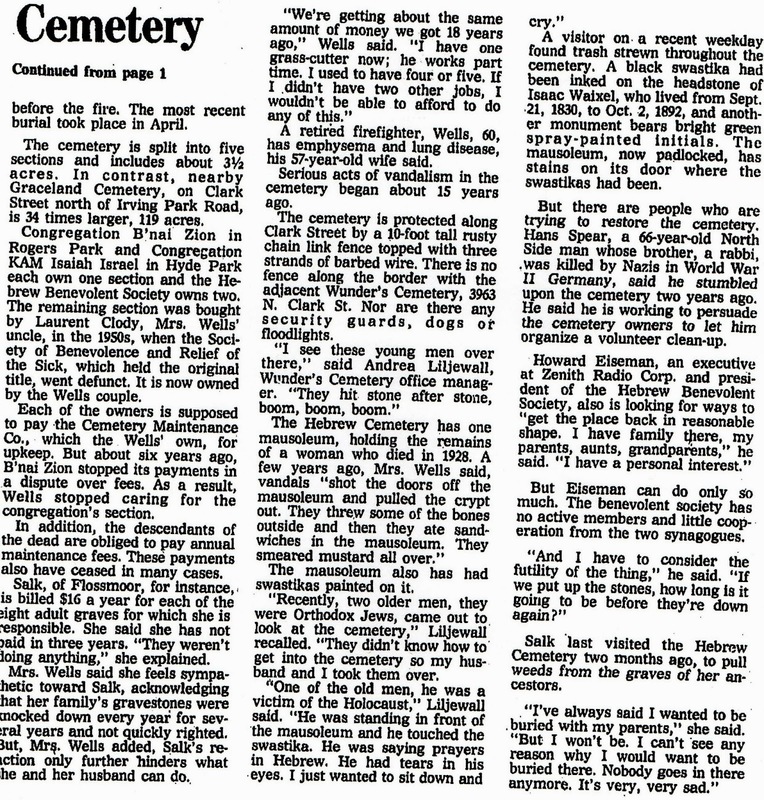 It was very important in the days before autos allowed easy access to outlying cemeteries, when periodic cemetery visits were still part of the social pattern. 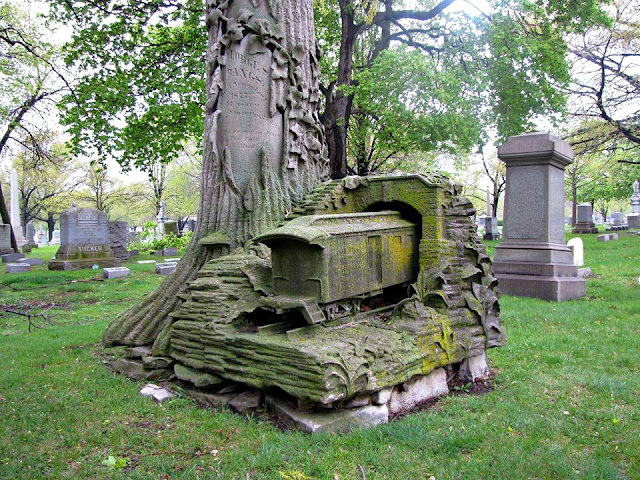 Bodies of the rich were transported from the city on special funeral trains; bodies of the middle, working and indigent classes rode on the baggage cars of regular trains. 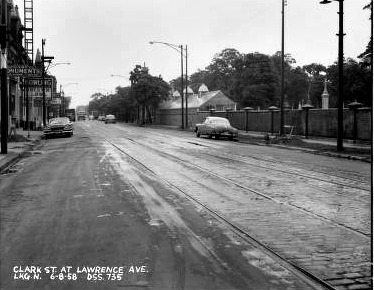 The stop was demolished 25 years ago. 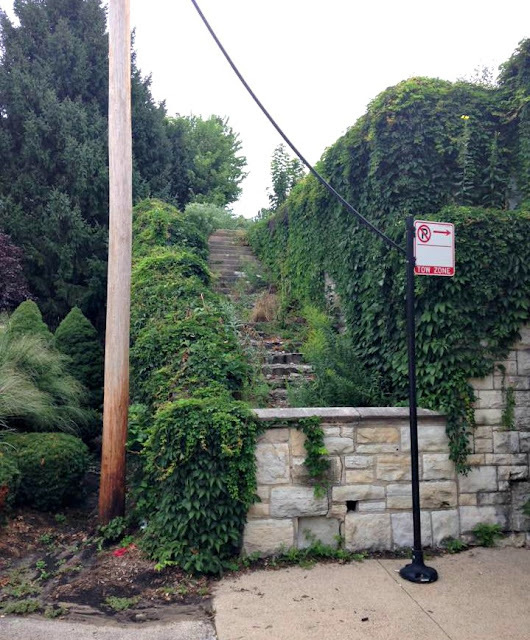 All that remains is a stairway and the elevator once used to lower coffins from track-side to ground level. 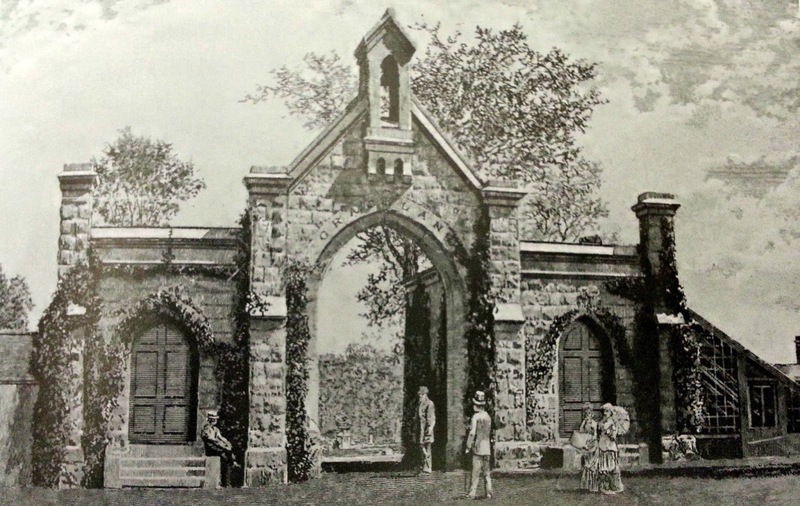 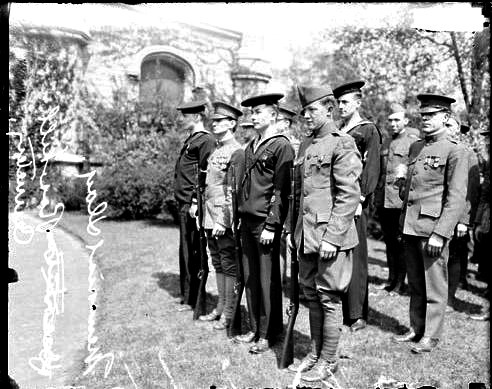 'The Officers and Board of Managers of Rosehill sought to increase Rosehill’s reputation in the years immediately following its creation. 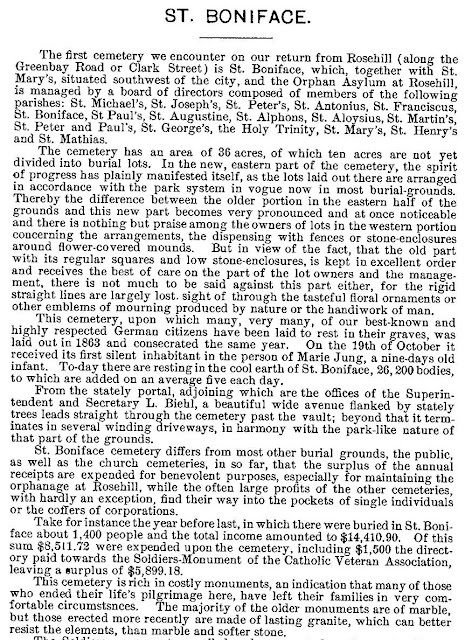 Between 1859 and 1860 they published several booklets with information on the cemetery, its dedication, and, most importantly, its lot holders. 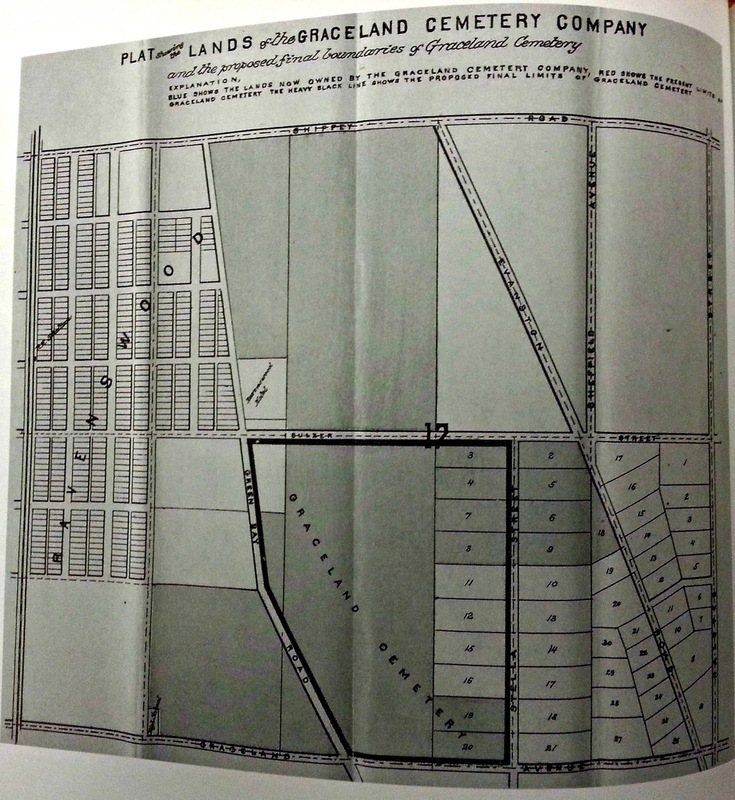 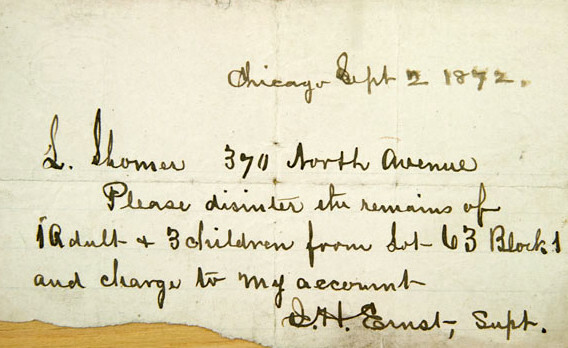 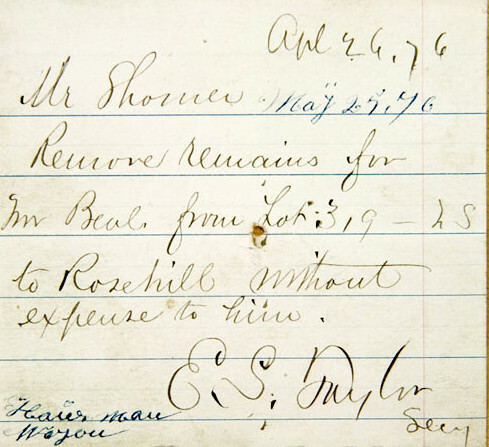 These early lists of lot holders feature names of prominent nineteenth century Chicagoans and were published in an effort to pressure their peers into purchasing lots at Rosehill. 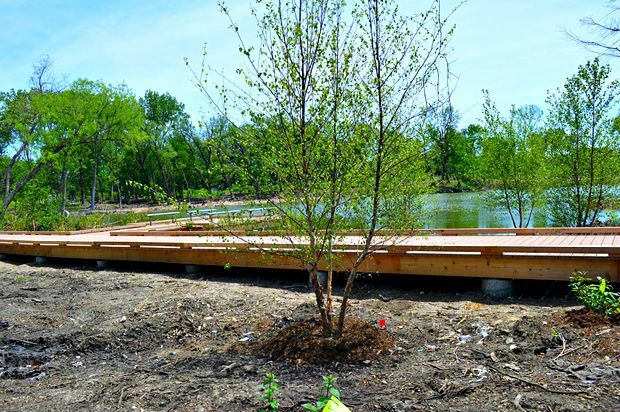 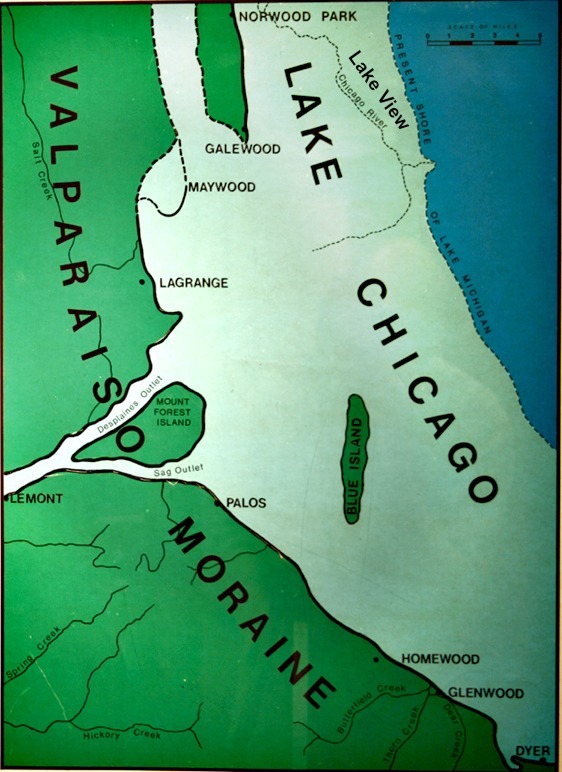 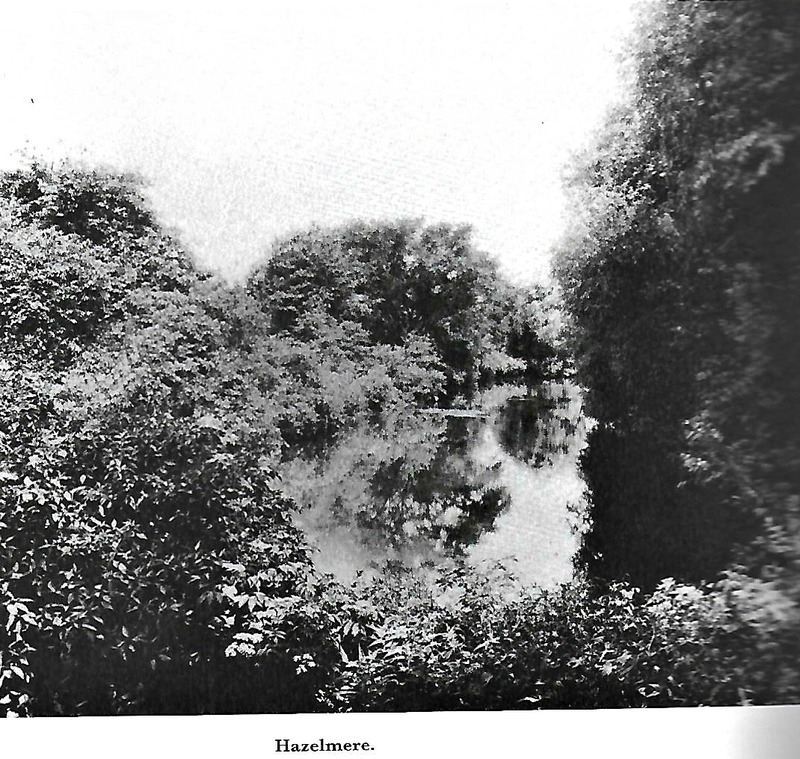 According to Chicago and Cook County Cemeteries the area was between a mix of low sand hills and marshland. 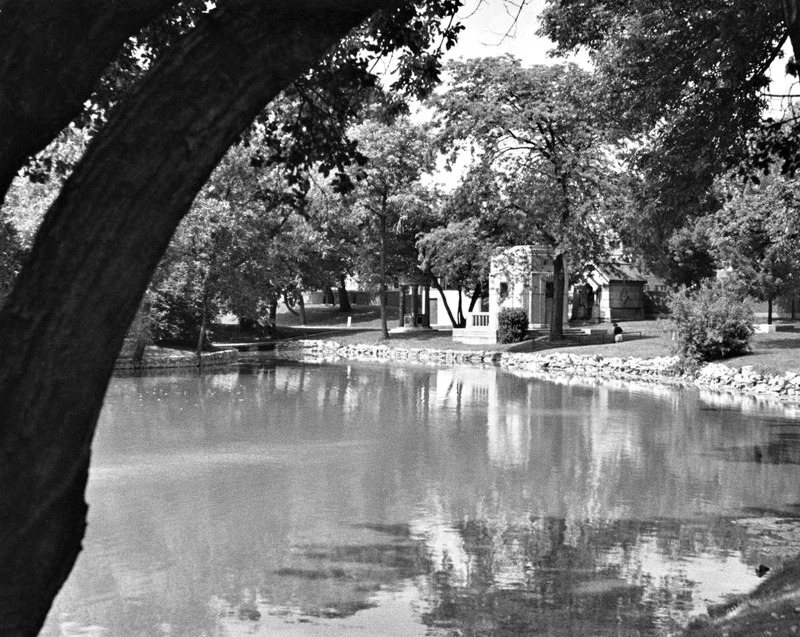 A creek ran through the area, fed by an underground spring. 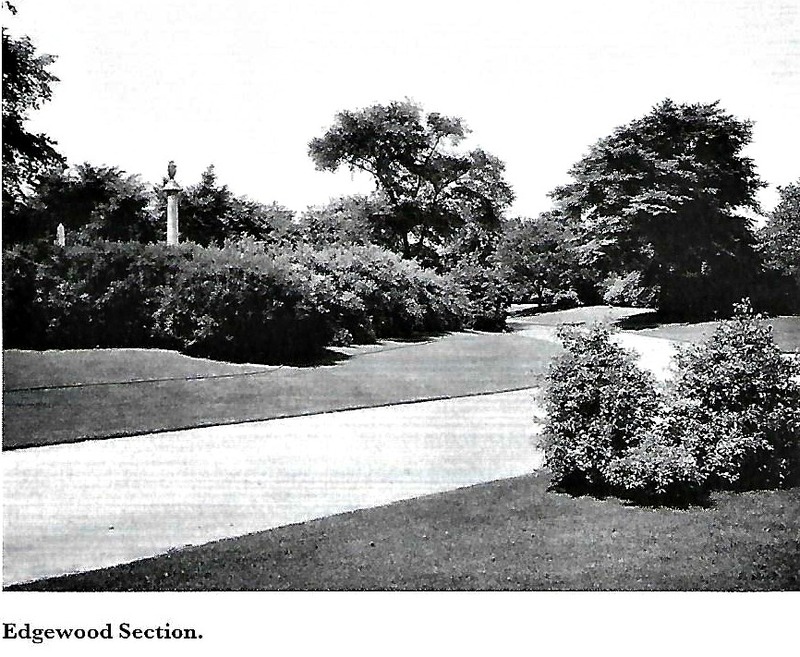 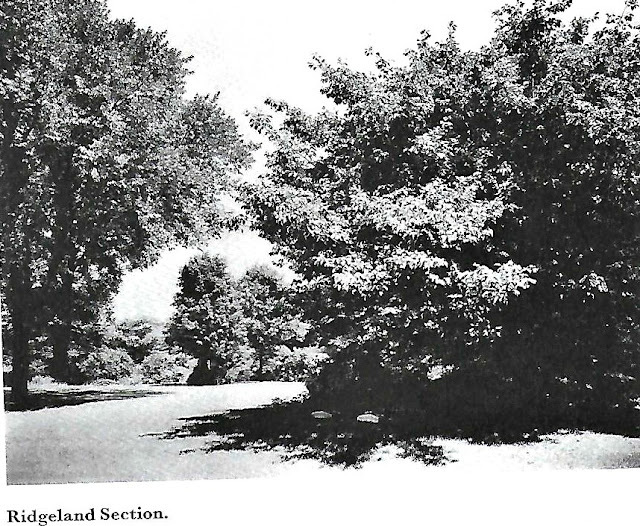 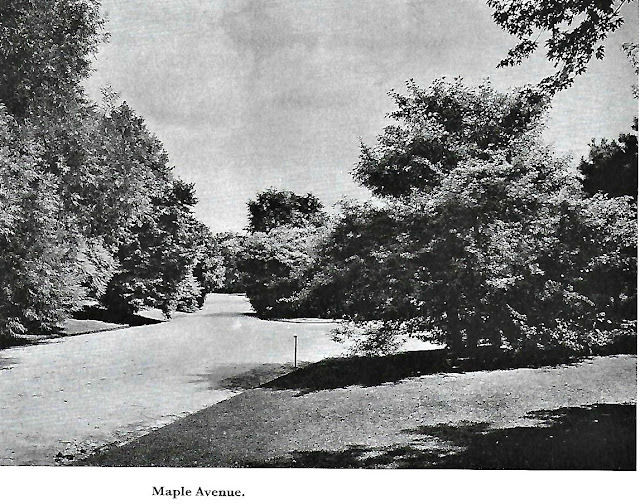 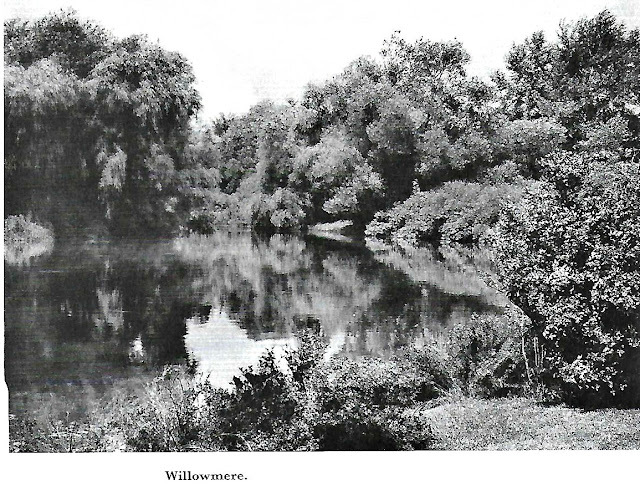 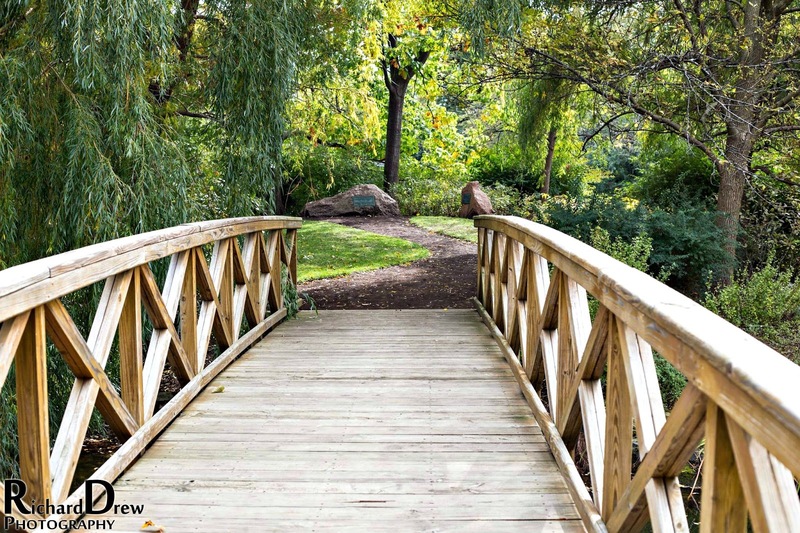 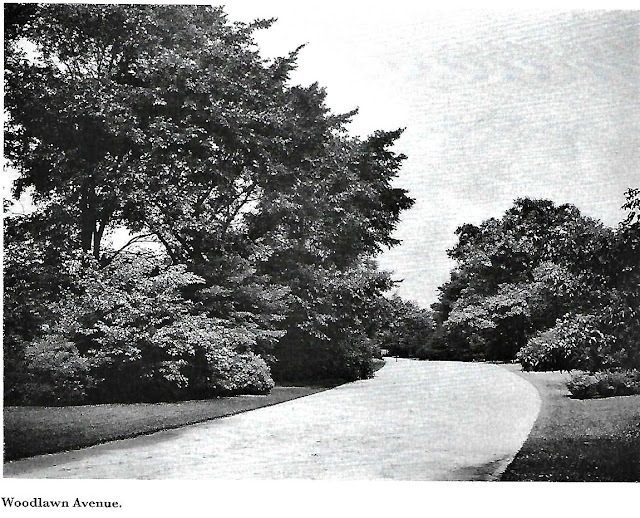 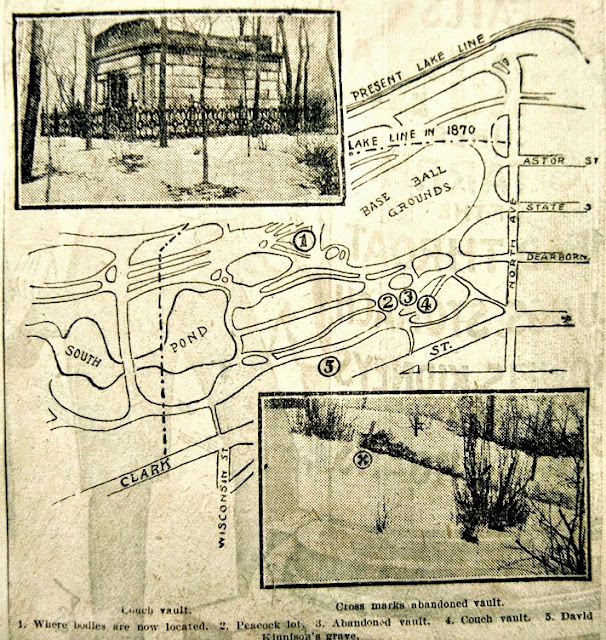 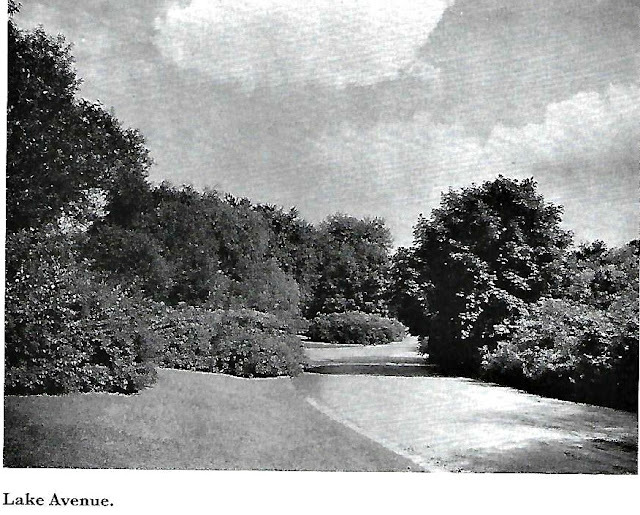 The meandering river-like roadway cemetery was planned as a landscaped memorial park set far away from urban Chicago. 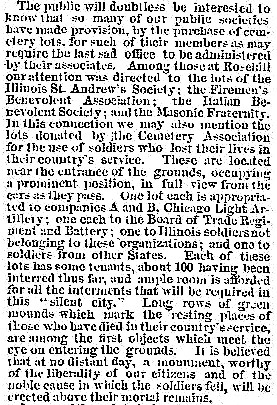 St. Andrew's and St George's societies Batteries A and B and Bridge's Battery are among the benevolent and patriotic organizations here represented. 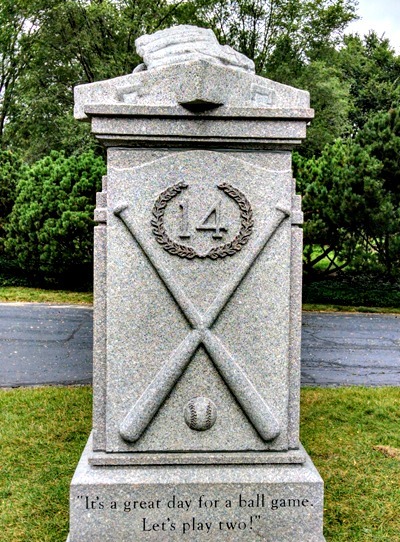 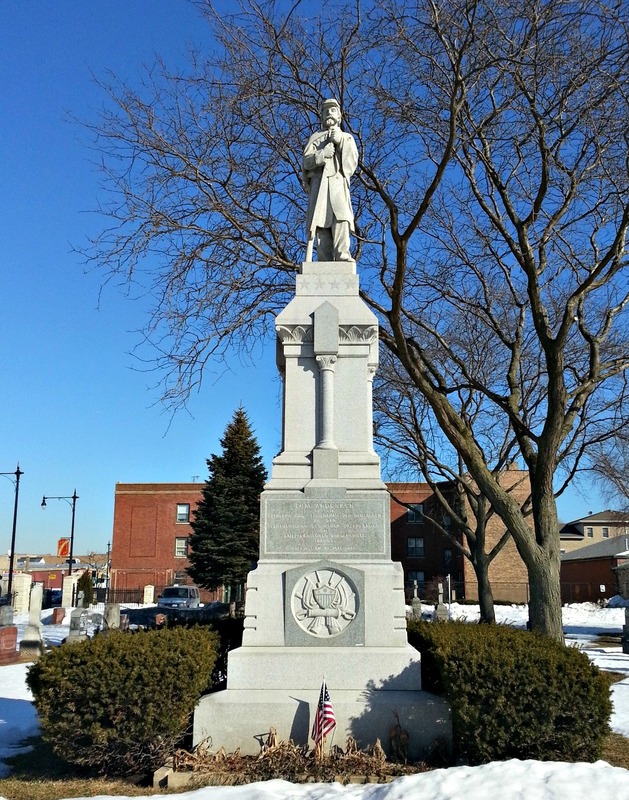 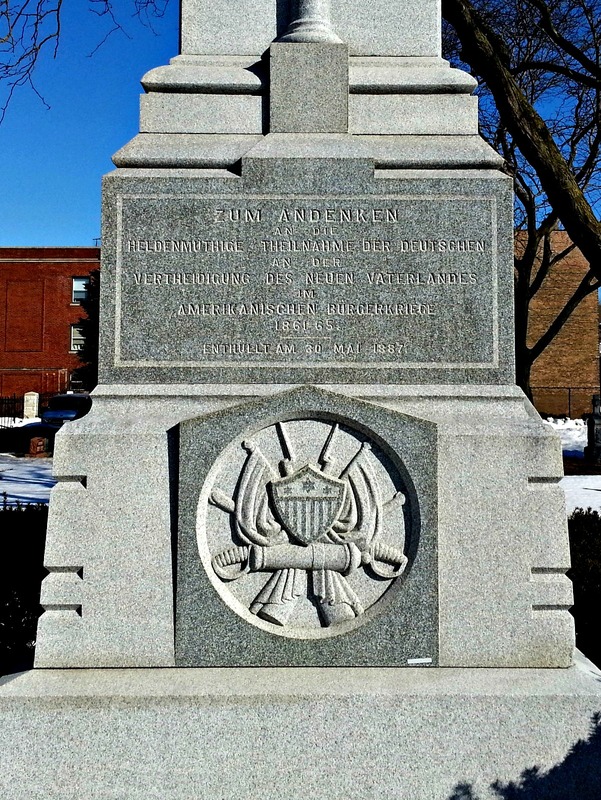 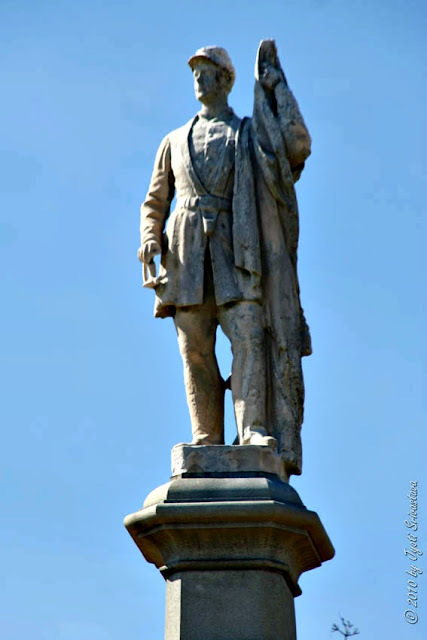 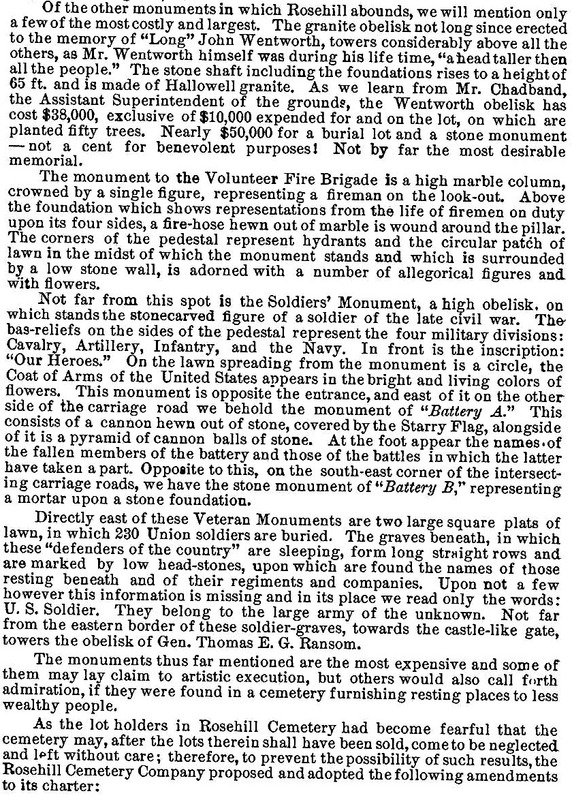 The Firemen's Monument was erected at a cost of $15,000 and the beautiful Military Monument erected at the joint expense of the county and the Board of Trade is an imposing ornament. 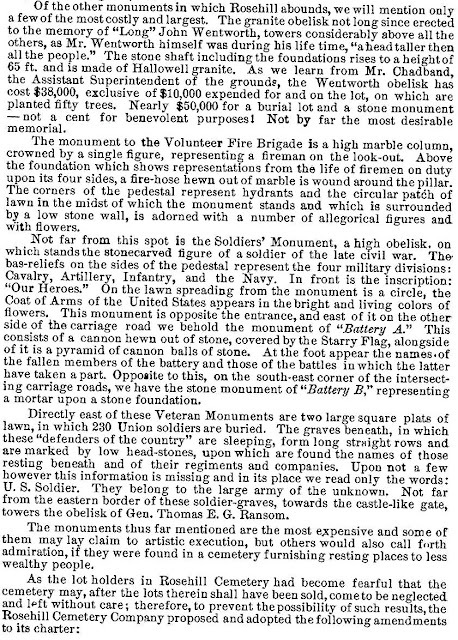 There are also fine monuments erected to the memory of the soldiers by the different batteries and by H.O. 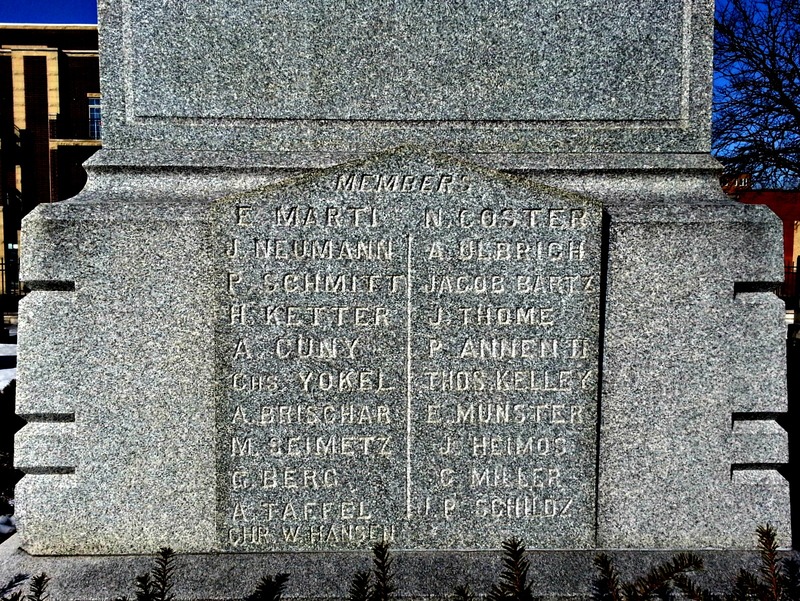 Stone also others to the memory of General Ransom and P.F.W. Peck which are particularly worthy of mention. 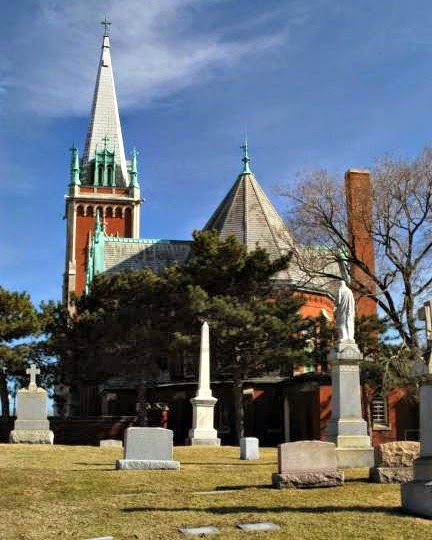 The main entrance to Rosehill Cemetery consists of an elegantly constructed stone edifice of castellated style which contains a chapel for the use of those desiring divine services. 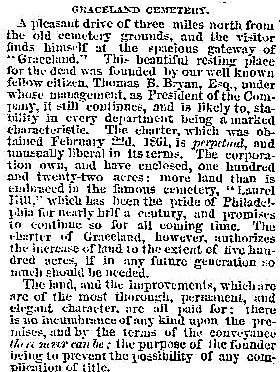 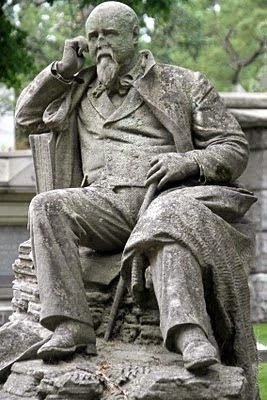 On the 9th of February 1859 a legislative act was approved to incorporate the Rosehill Cemetery Company its members include William B Ogden. 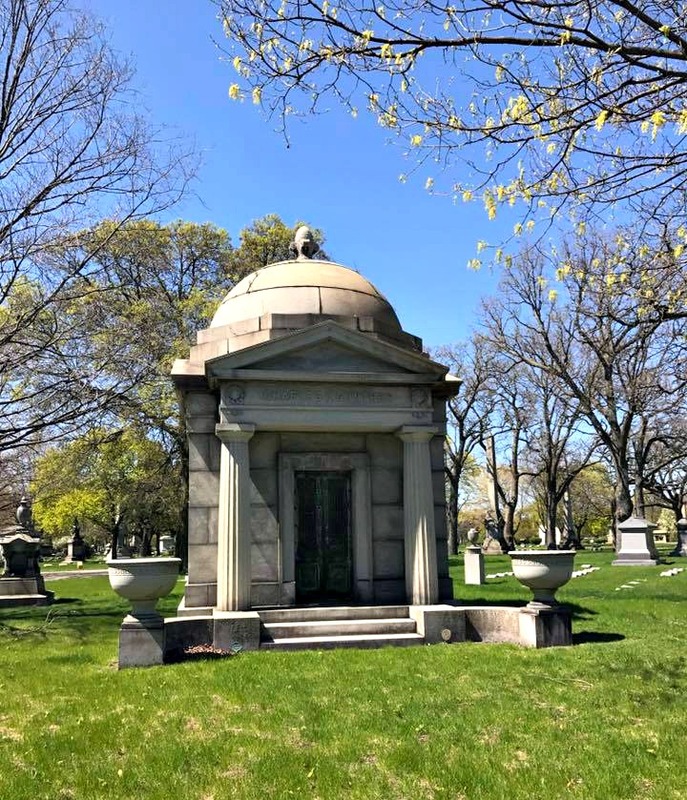 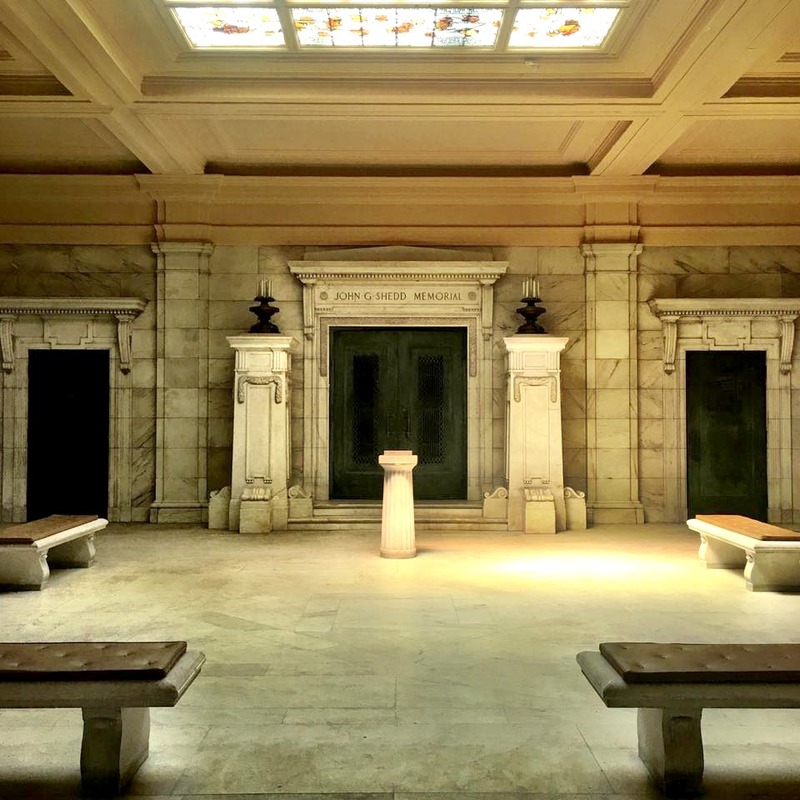 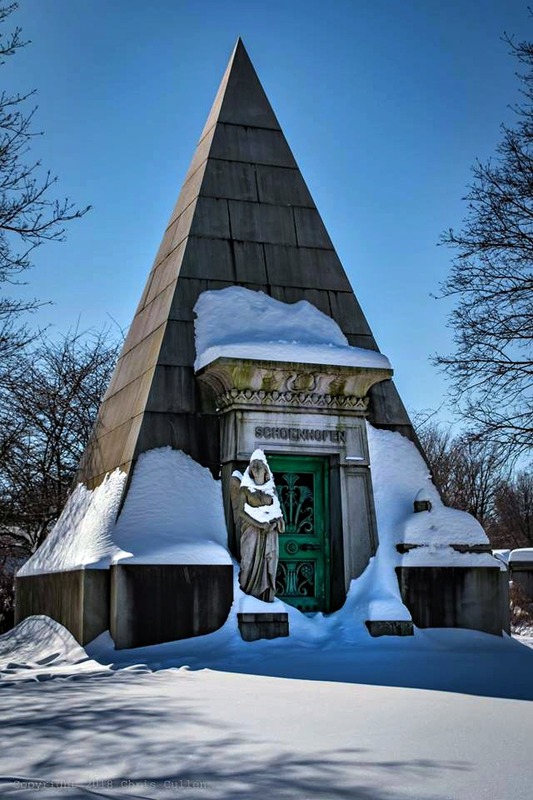 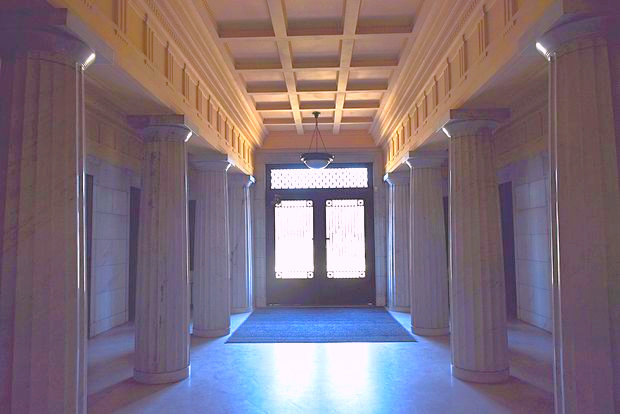 One of the most unusual buildings in a Chicago area cemetery is one that consists of just an elevator. It is a beautiful structure with stained glass windows and could easily be thought of as a small chapel. 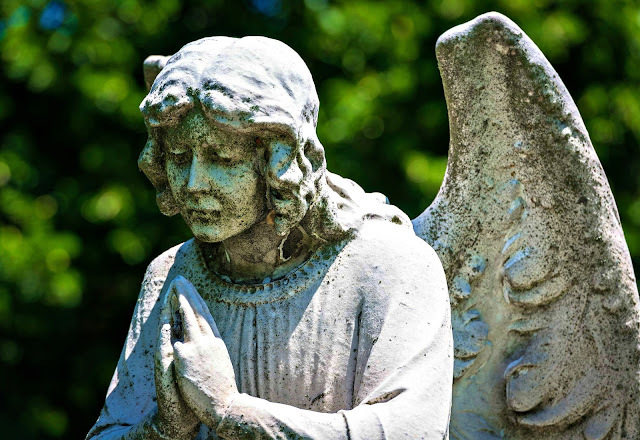 Read more from link. 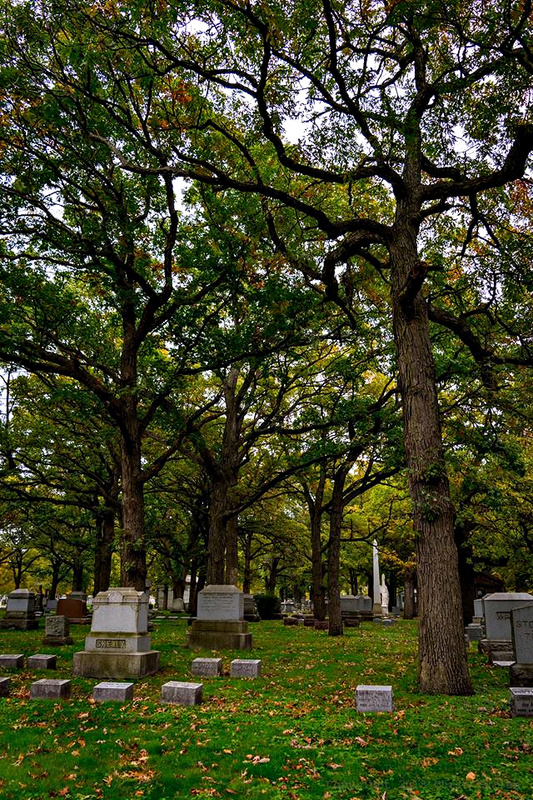 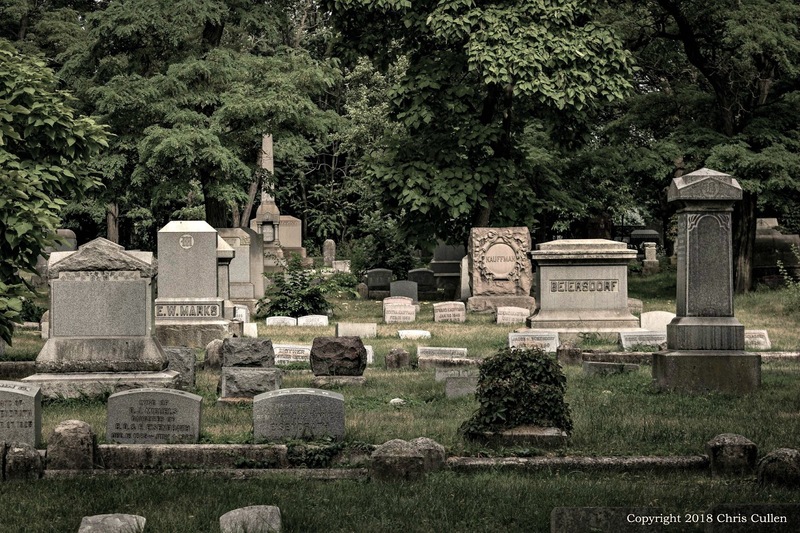 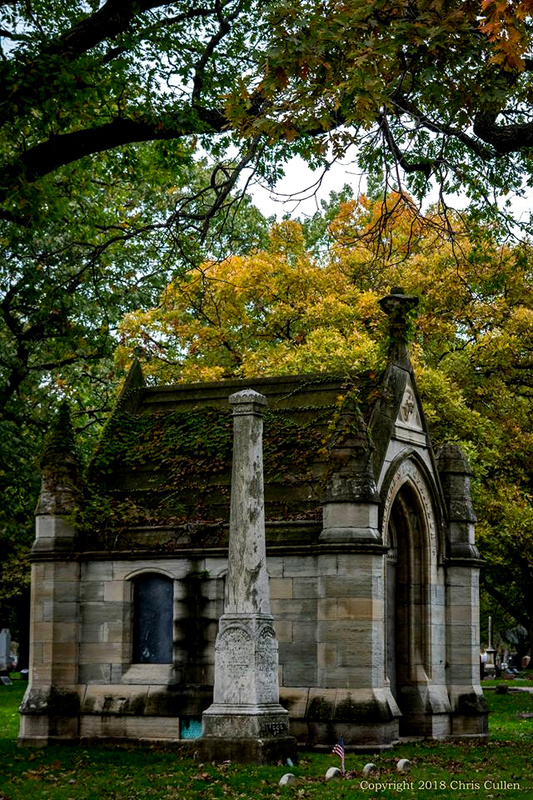 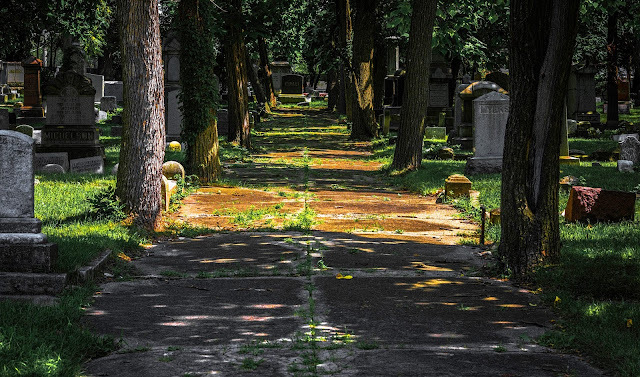 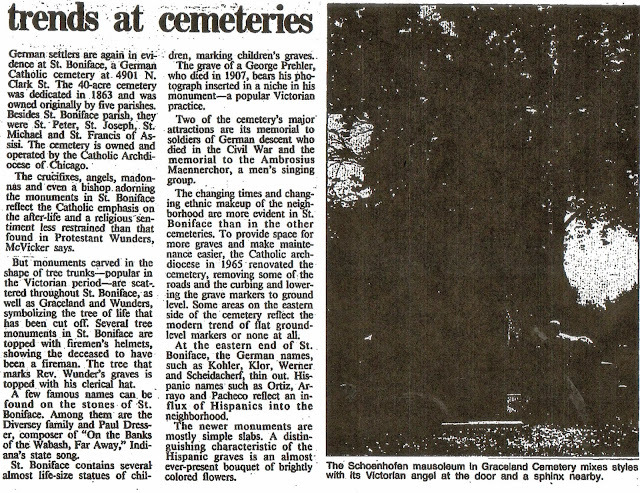 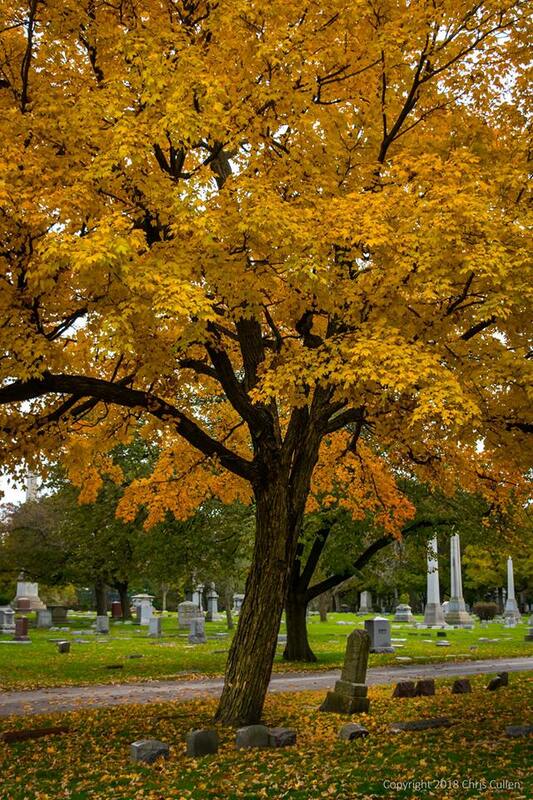 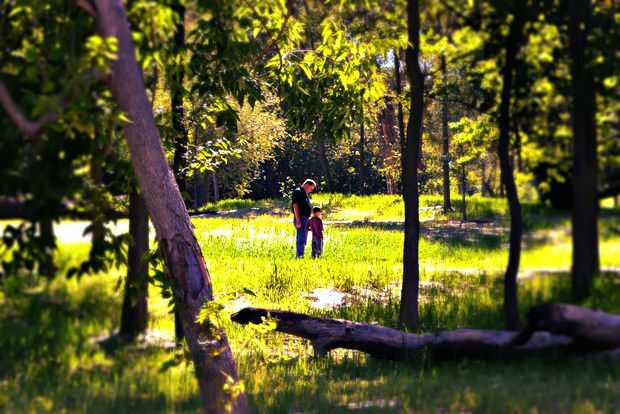 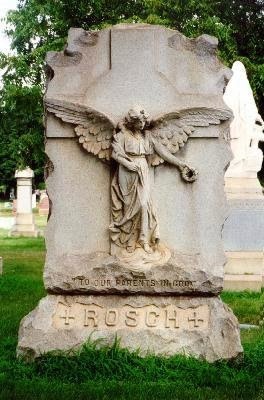 'One of the largest and most beautiful of the cemeteries surrounding our city is Rosehill. 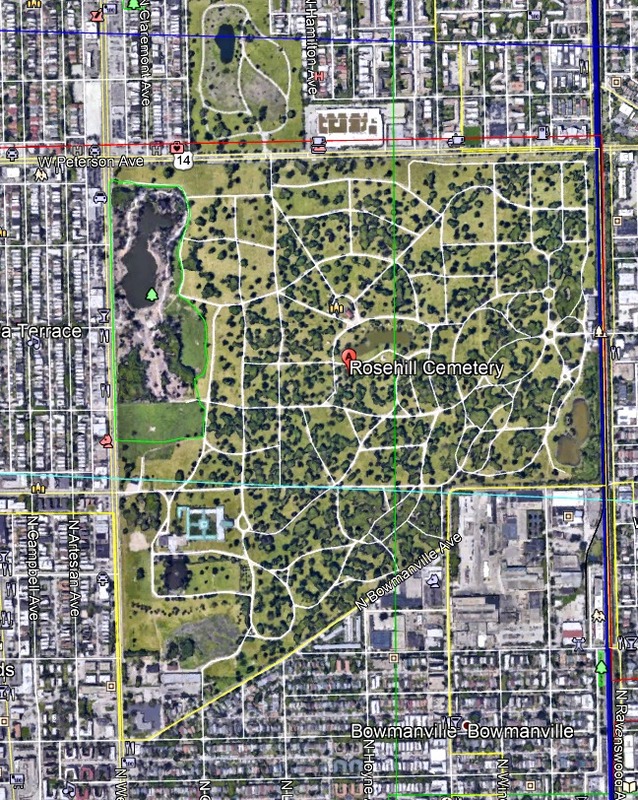 It contains within its enclosure 300 acres of ground but may be enlarged at any time when it becomes necessary to 500 acres. 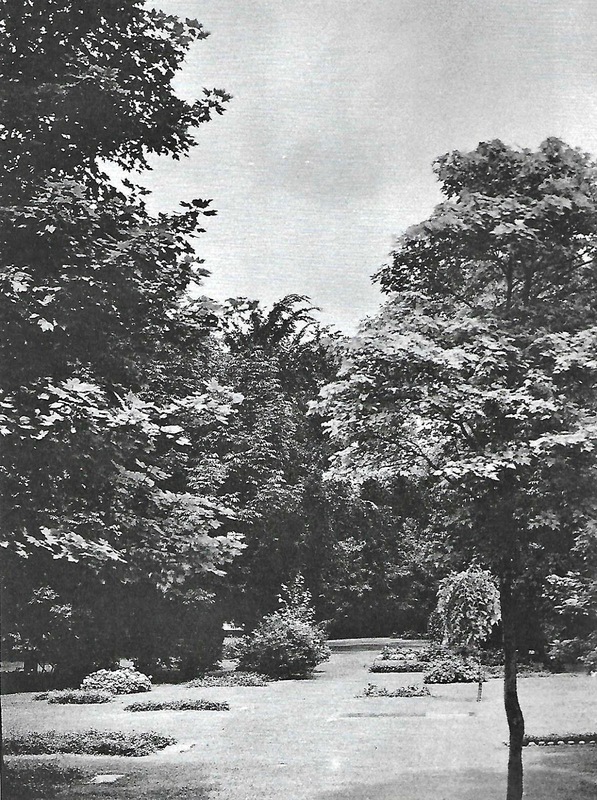 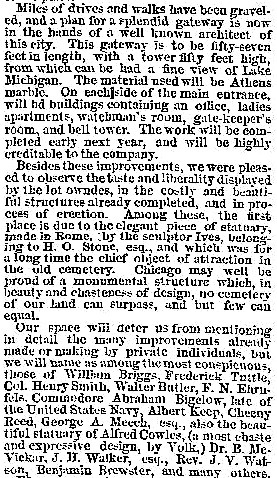 The grounds were dedicated on July 28th 1859 which was an occasion of no small significance. 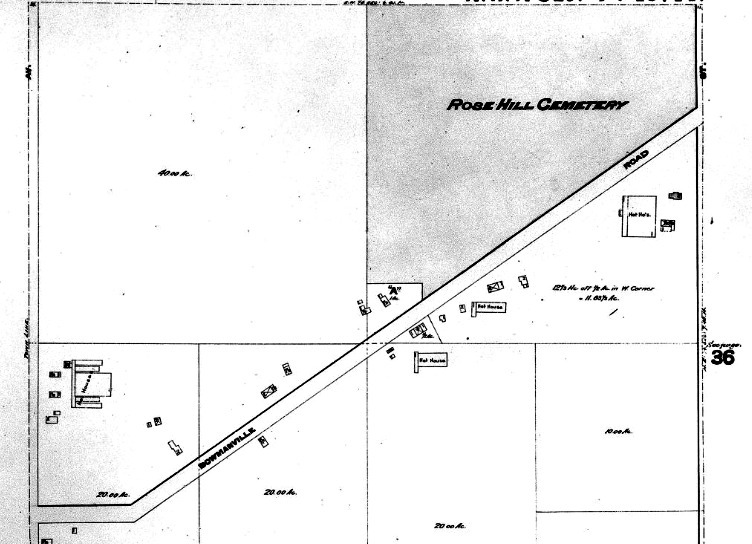 Rosehill is situated 6 miles north of the [Chicago] Court House and is reached either by the Green Bay Road [Clark Street] or the Chicago and North Western Railroad. 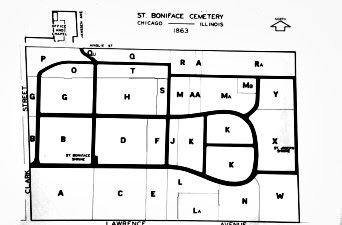 At the time when this cemetery was laid out many of the 100,000 inhabitants our city had then considered the distance from it much too great but yet even the people who had originally laid out the old city grave yard now Lincoln Park were found fault with for locating it too far out of the city. 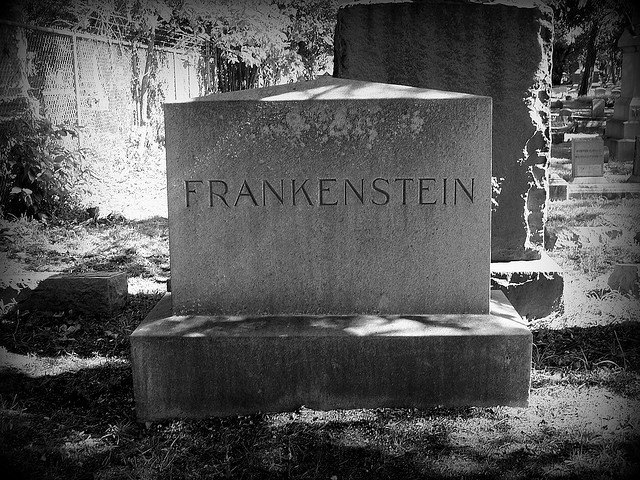 Yet it took very few years before the growing city put its monster arms around it and it became necessary to dig out the remains of those laid to rest there but a short time before and to transfer them to cemeteries further distant the dead had to give way to the living. 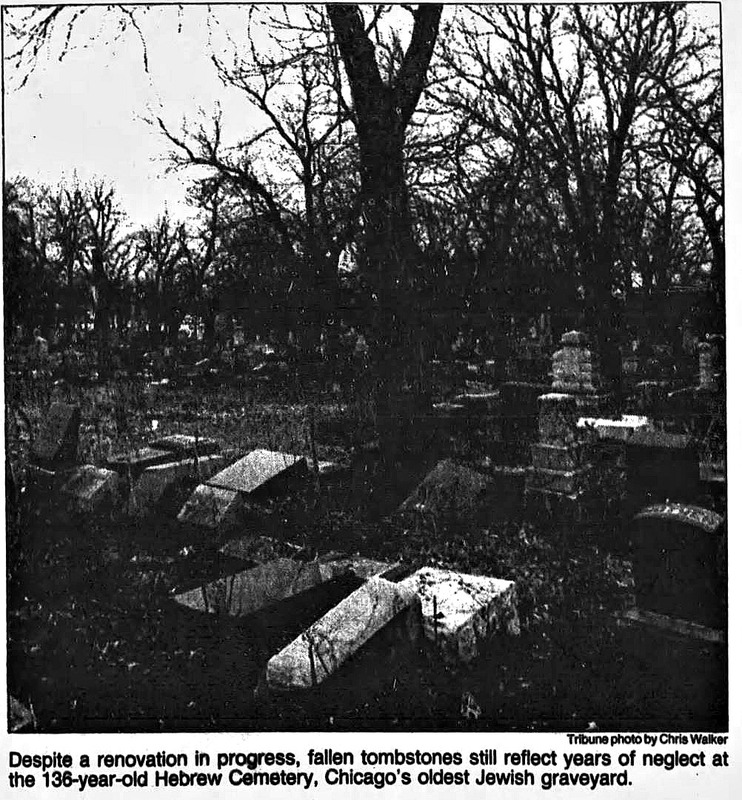 And today again circumstances are taking the same turn once more for Rosehill, St Bonifacius [Boniface], Graceland, the German Lutheran cemetery and two Jewish burial grounds yet further south are now all within the city limits and are surrounded on all sides by human dwellings which in some locations in the neighborhood of Graceland are very rapidly growing in number. 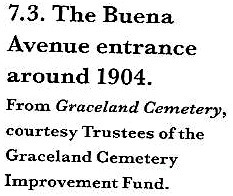 And how long will it be before the cemeteries mentioned at least the ones nearest the heart of the city will have to give way to the living their necessities and improvements? 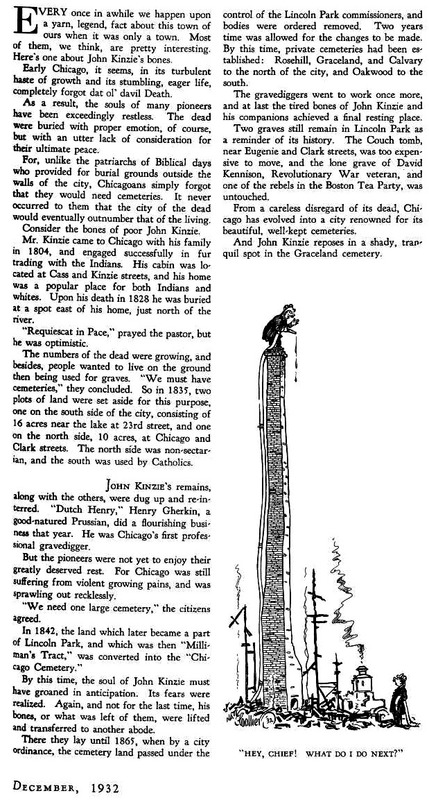 Nothing will be able to withstand the growth of this still young giant not even death. 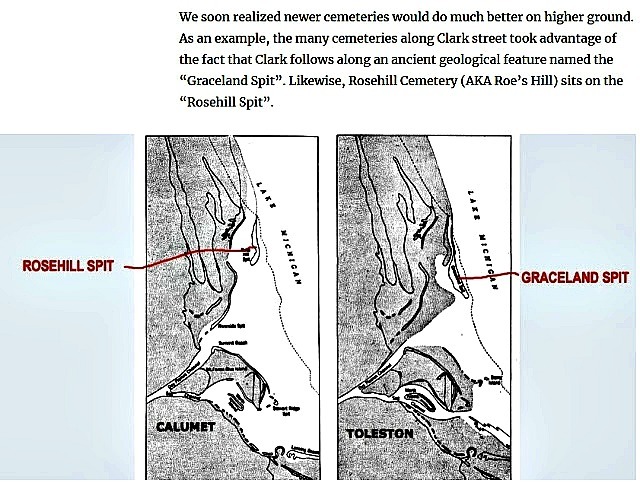 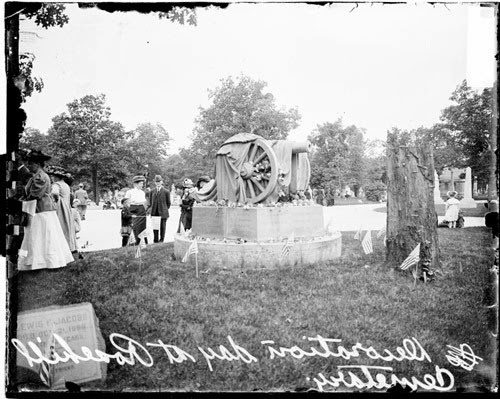 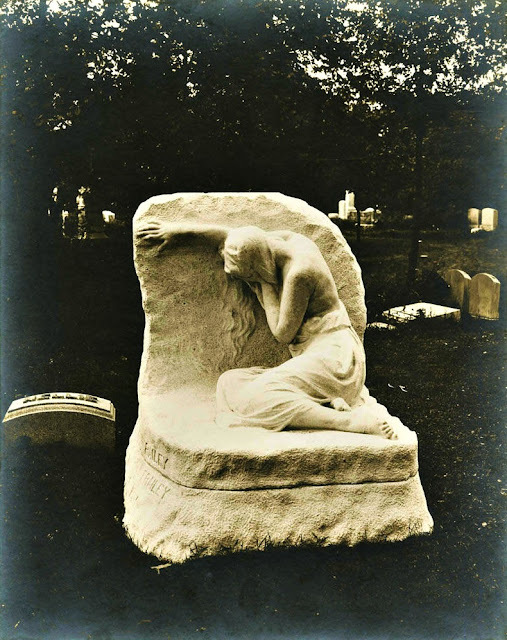 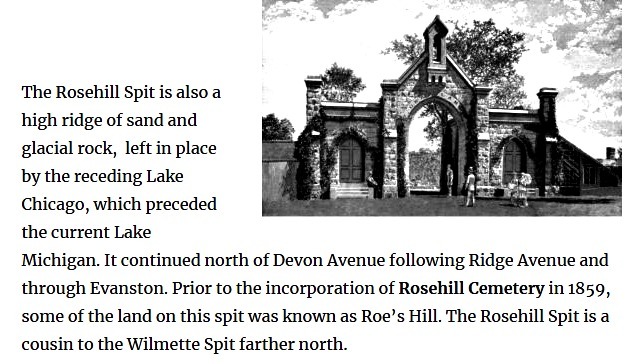 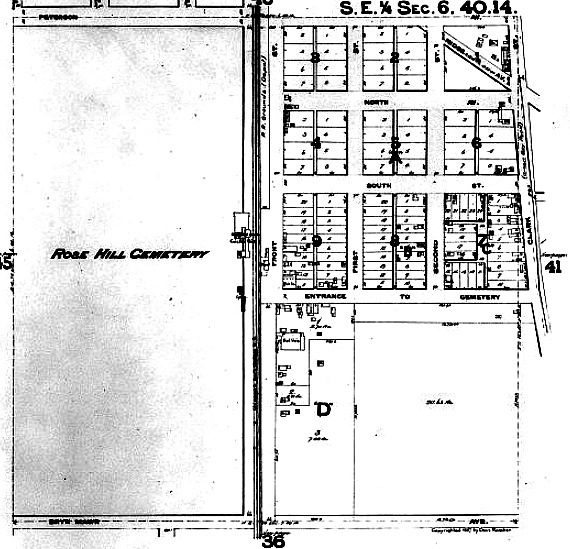 Rosehill was selected as the general city burial grounds by a committee appointed at the time by the [Chicago] City Council chiefly on account of its high and consequently dry location the same being 30 to 40 feet above the level of Lake Michigan an advantage of great importance in a cemetery. 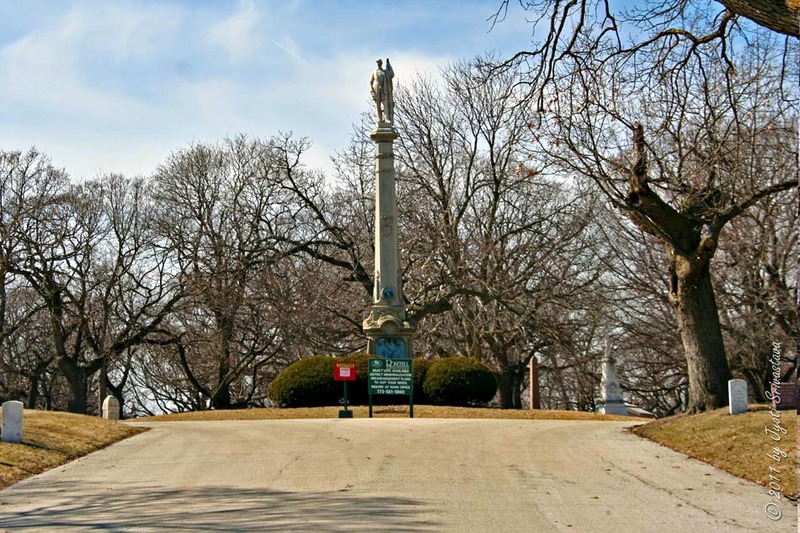 better-known public monuments at Rosehill. 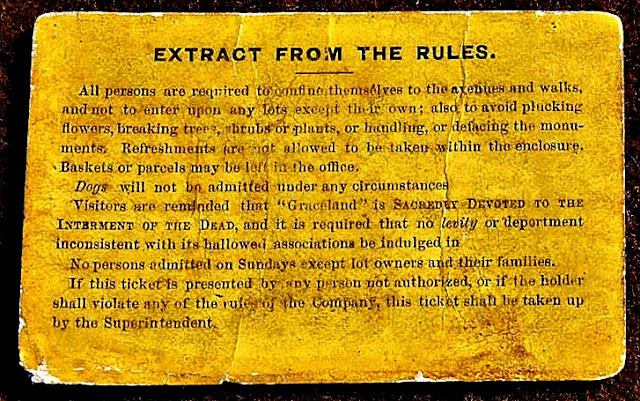 'The original Corporate Charter of the Mt. 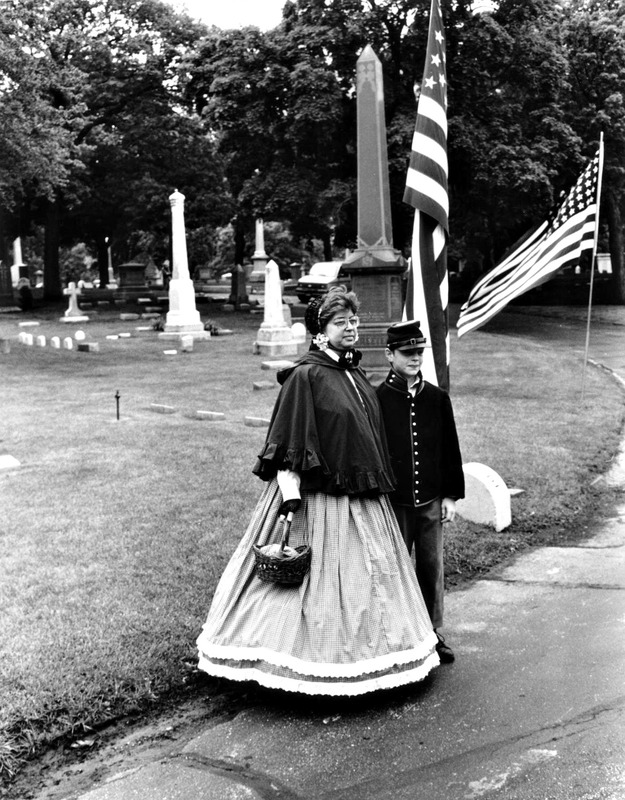 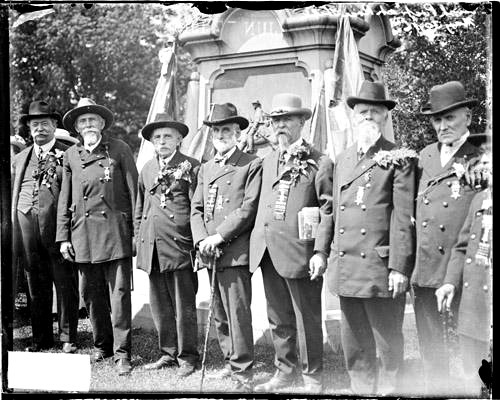 Sinai Cemetery Association, under the existing law, would have expired in the year 1889, twenty years after its issuance, and in the year 1888 the Cemetery Association re-incorporated under the name of New Mount Sinai Cemetery Association and received a Perpetual Charter, under which it now operates. 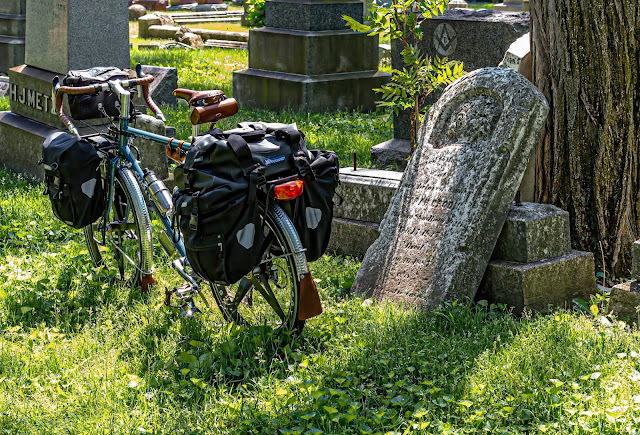 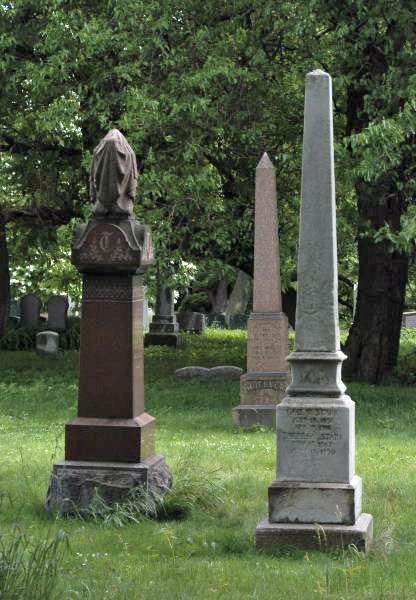 The Records of the New Mount Sinai Cemetery Association indicate that the first burials in the Cemetery were made in the year 1853.' - from their website. 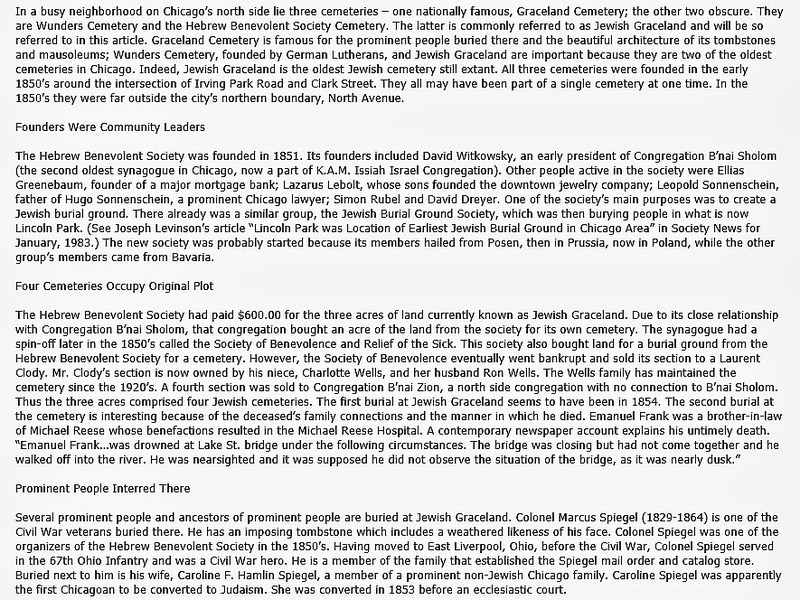 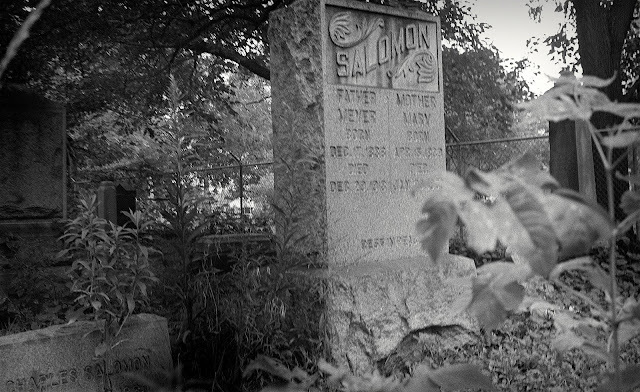 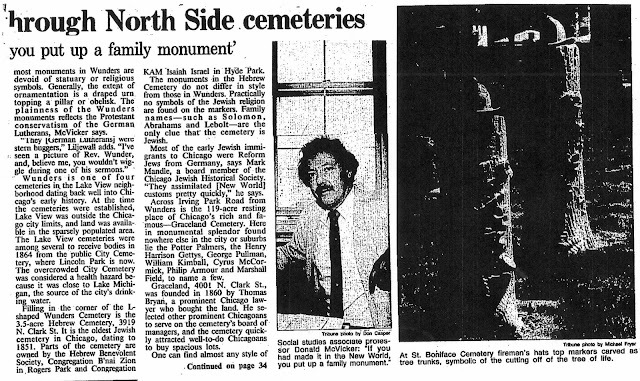 According to the 'Guide to Jewish Cemeteries in Chicago' "The cemetery has an estimated 25,000 to 30,000 of the Jewish faith. A large number of burials are on the southern side of the cemetery." 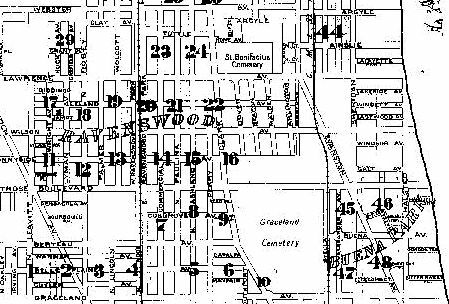 thirty-five acres to the east and in 1867 one hundred and nine acres north. 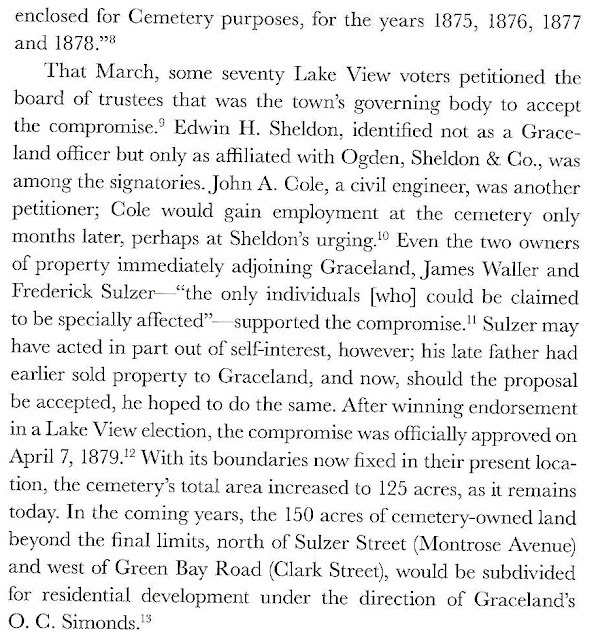 Thus by the latter year they had purchased two hundred and seventy five acres of land.The final limits of Cemetery were thereby fixed. 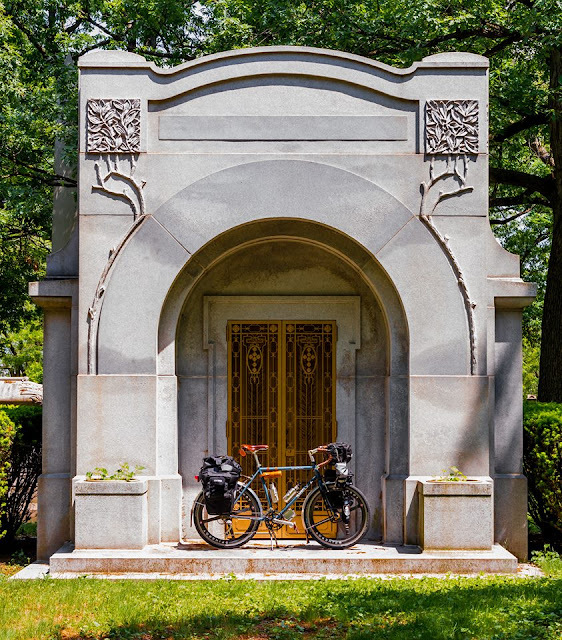 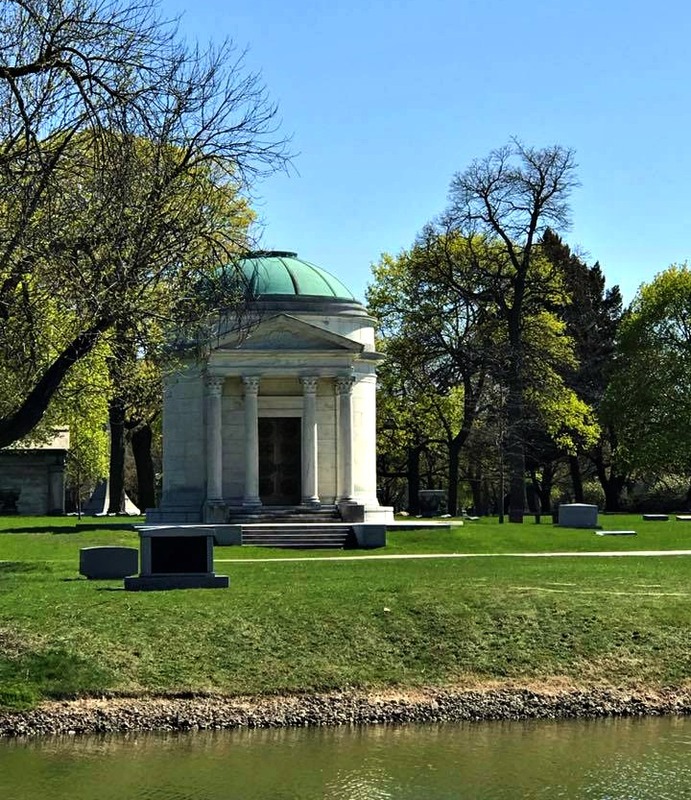 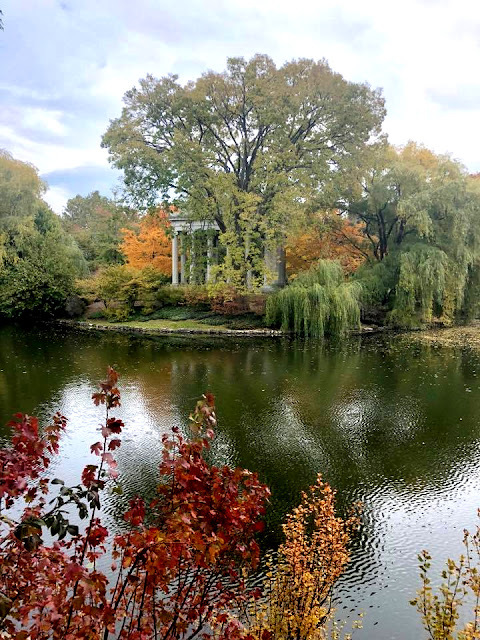 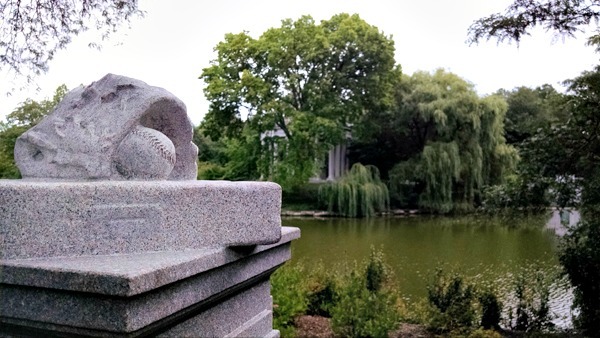 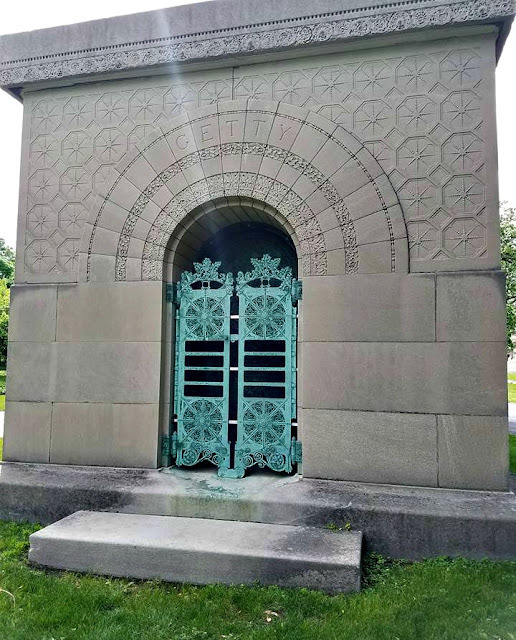 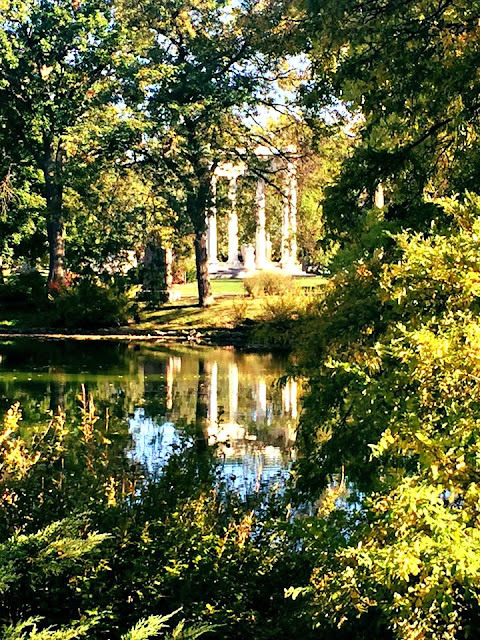 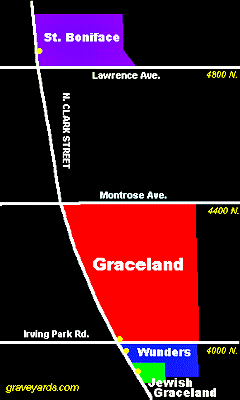 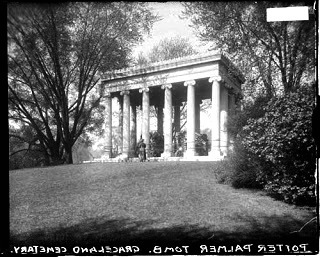 Graceland Cemetery is situated near the lake shore northeast of Belle Plaine station and about two miles north of Lincoln Park. 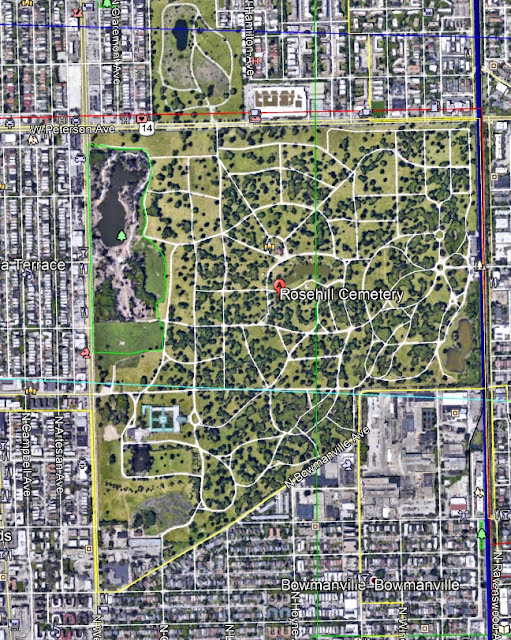 It is reached by horsecars or by the broad drive along the lakeshore and through the park. 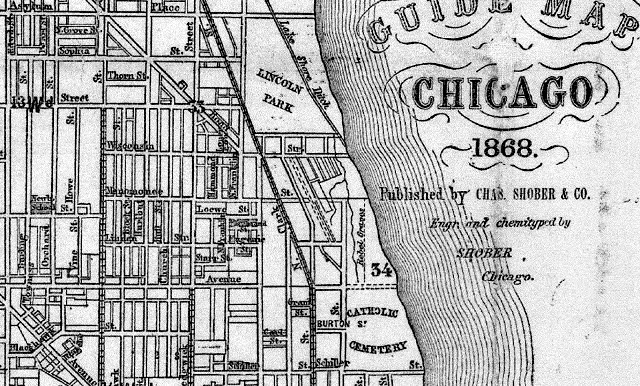 Before long also it is anticipated that trains will be running directly to it over the Chicago & Evanston line. 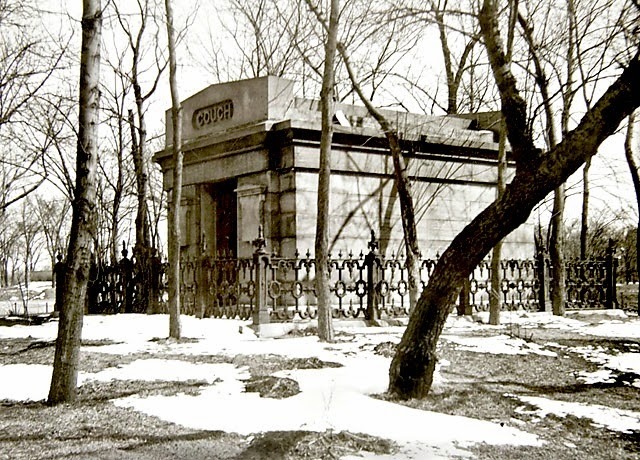 A station house has already been constructed by the company which is really an architectural ornament containing besides public accommodations the neat office of the cemetery. 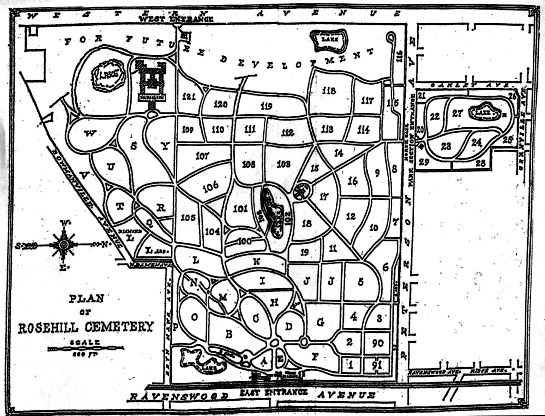 The spacious grounds which are formed by a series of ridges have a complete system of drainage the main sewer having been constructed to Lake Michigan at a cost of $10,000 Living springs supply the artificial gems of water and by means of a steam pump water is carried through a network of iron pipes to all parts of the ground. 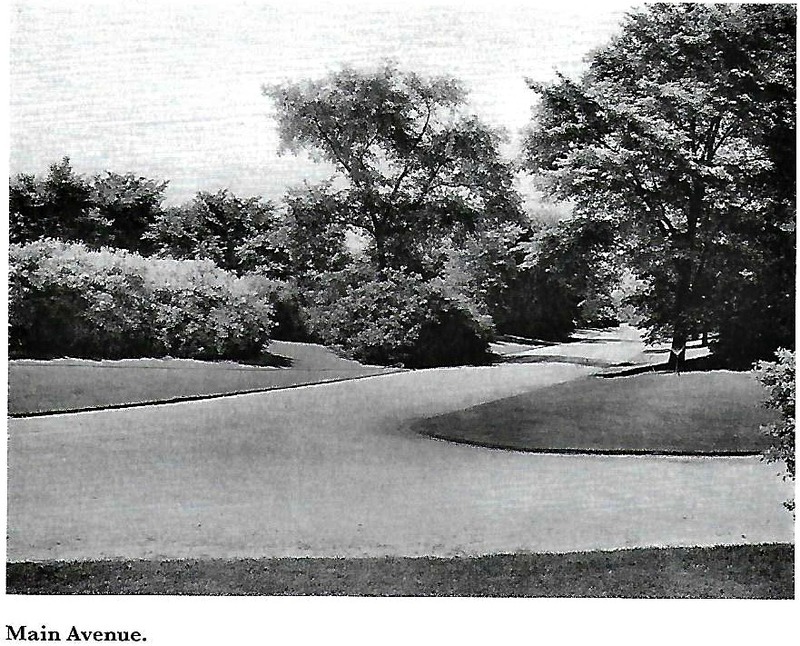 Thus it is that even during the most parching the wide and beautiful lawns are always cool and green. The air of freedom and the unobstructed view of the magnificent grounds are to be preserved far as possible by excluding all lot enclosures or boundaries by restricting the height of the monuments to a few inches and by limiting the of large monuments. 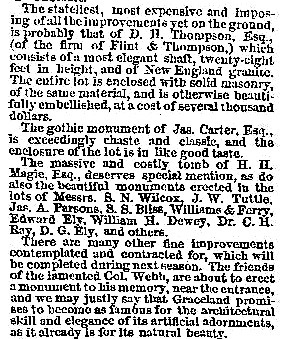 Conspicuous among the architectural beauties of the place may be mentioned the and yet simple monument of W.M. Hoyt, just completed the gothic mausoleum of H.H. 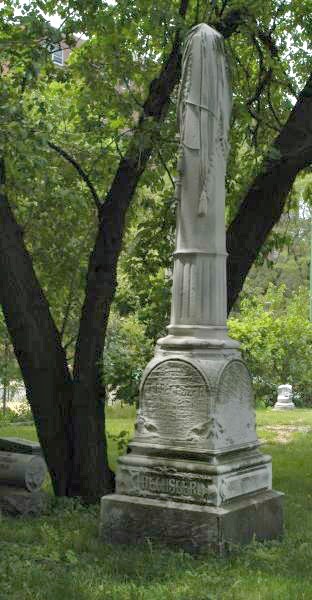 Taylor, fine obelisk of Washington Smith, the stately column of T.M. Avery, the Corinthian column its statue of I.B. 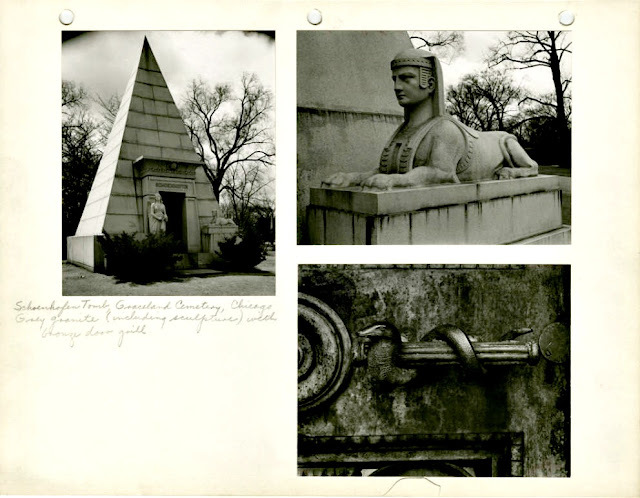 Shipman, the tasteful monuments E.H. Haddock, CB Blair, William Blair, Whitbeck, WD Fuller, and the massive tomb William J Wilson. 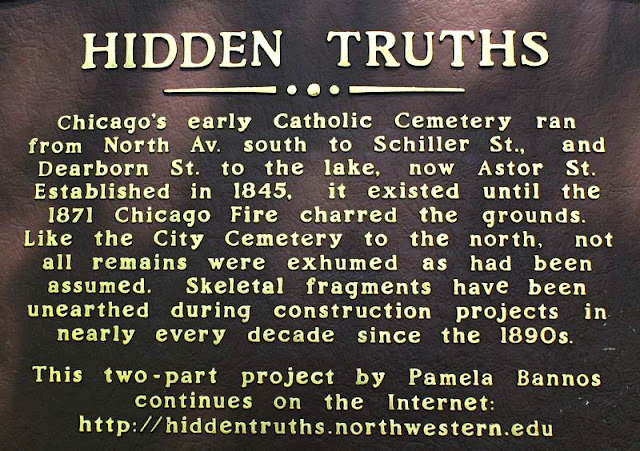 Many of Chicago's historical are here recorded William B Ogden, George Manierre, Mahlon D Ogden, Jonathan Burr, John H Kinzie, Norman B Judd, Justin Butterfield, Alexander Fullerton, Walter L Newberry, WF Coolbaugh, Eli B Williams, and John Calhoun. 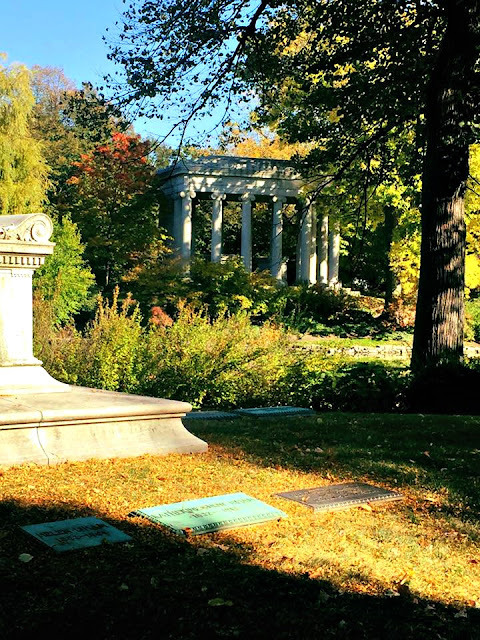 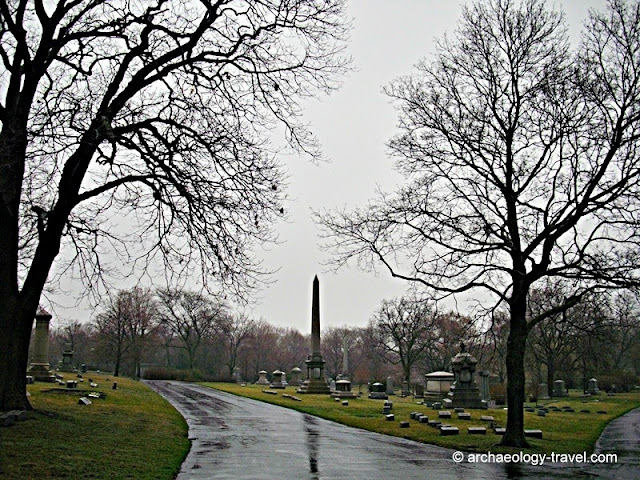 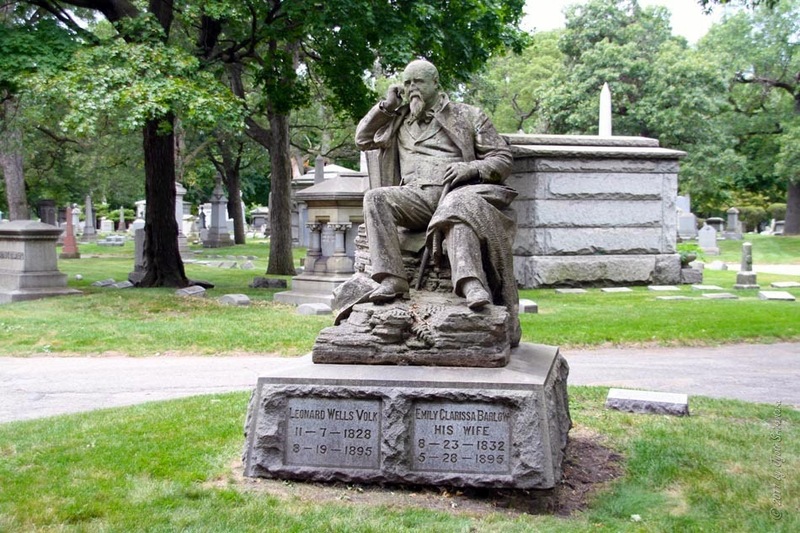 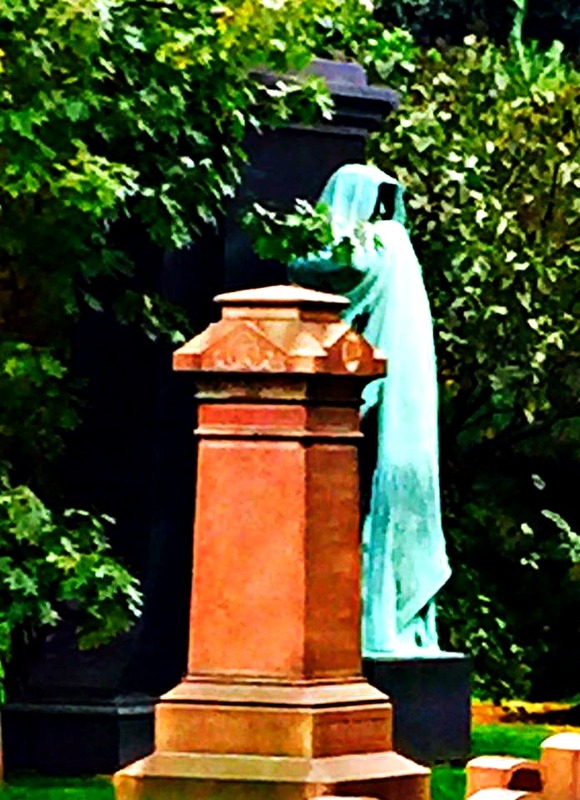 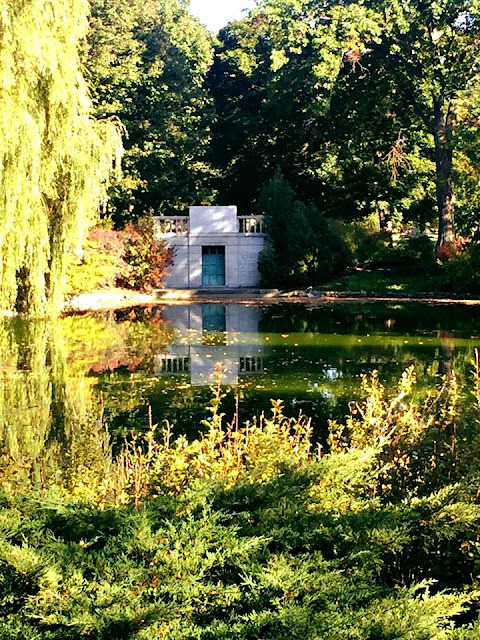 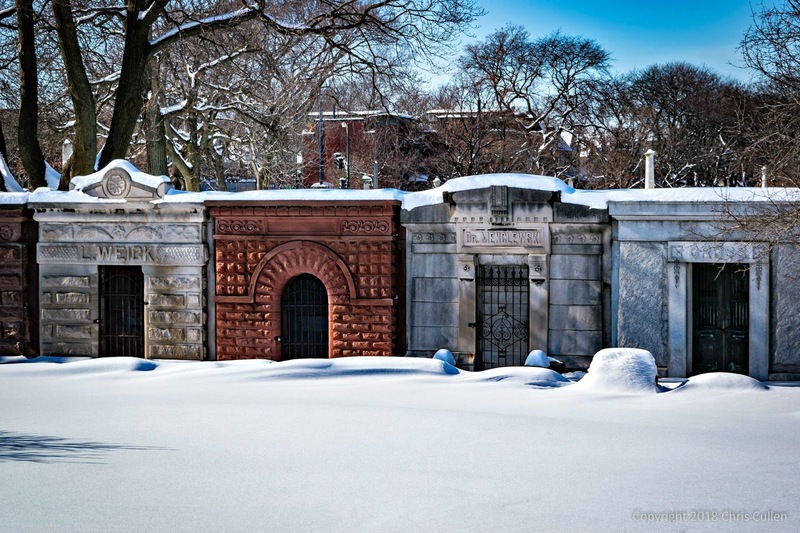 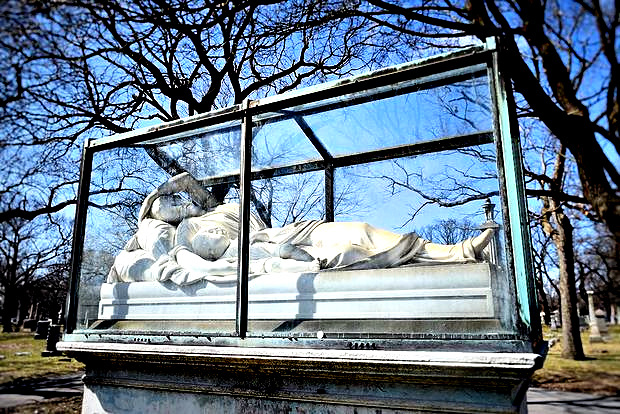 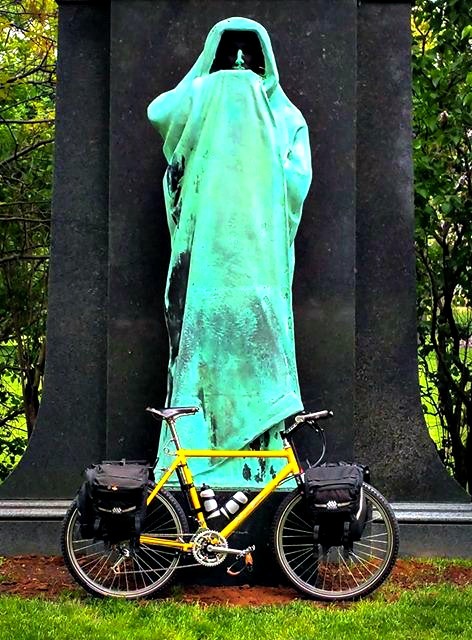 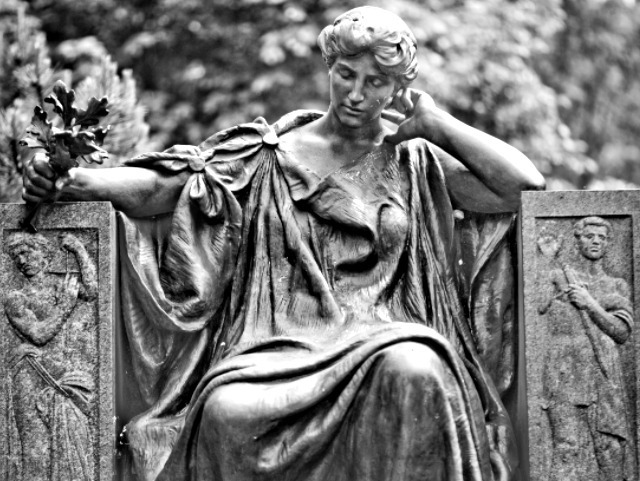 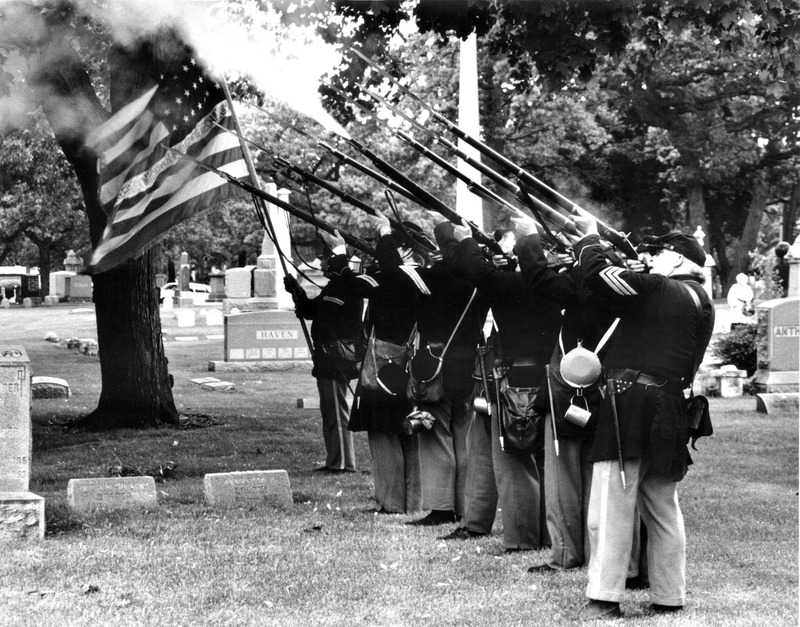 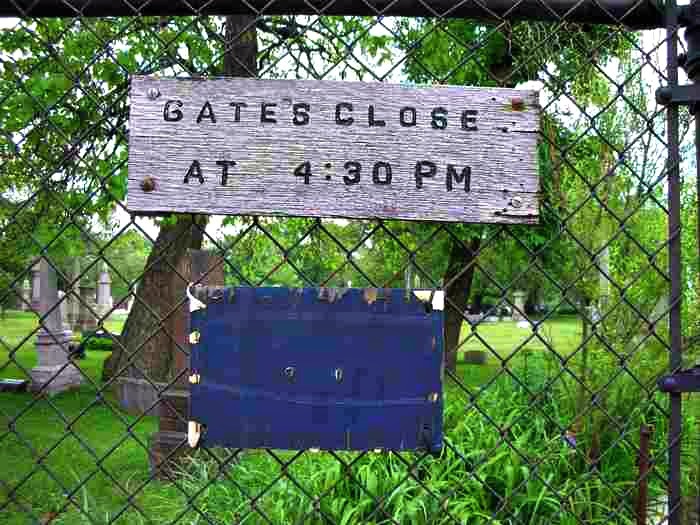 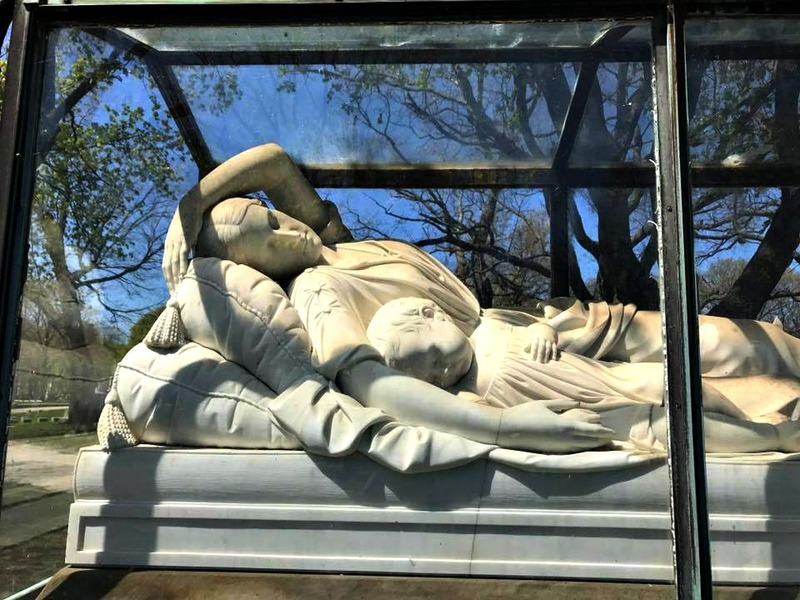 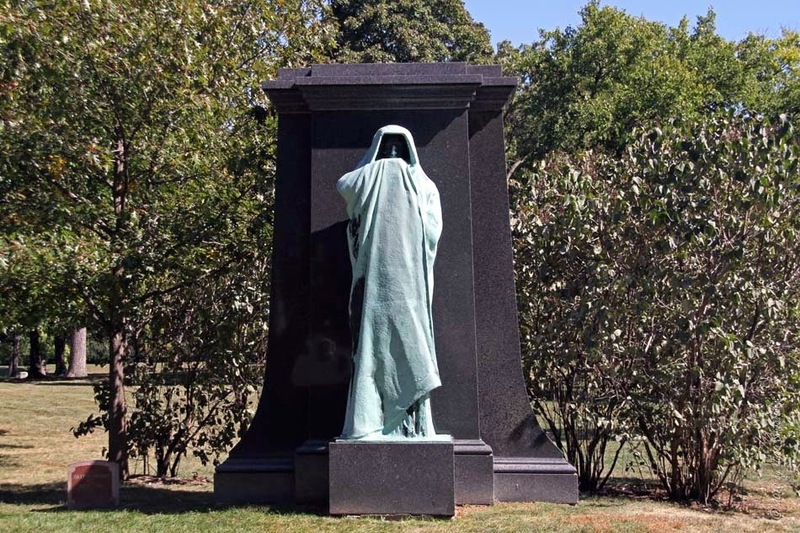 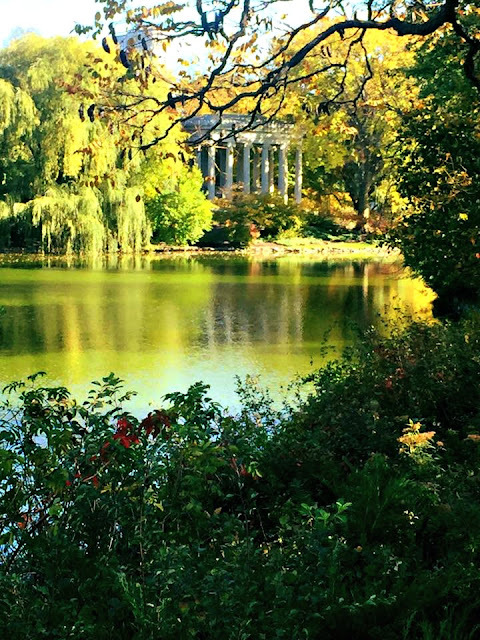 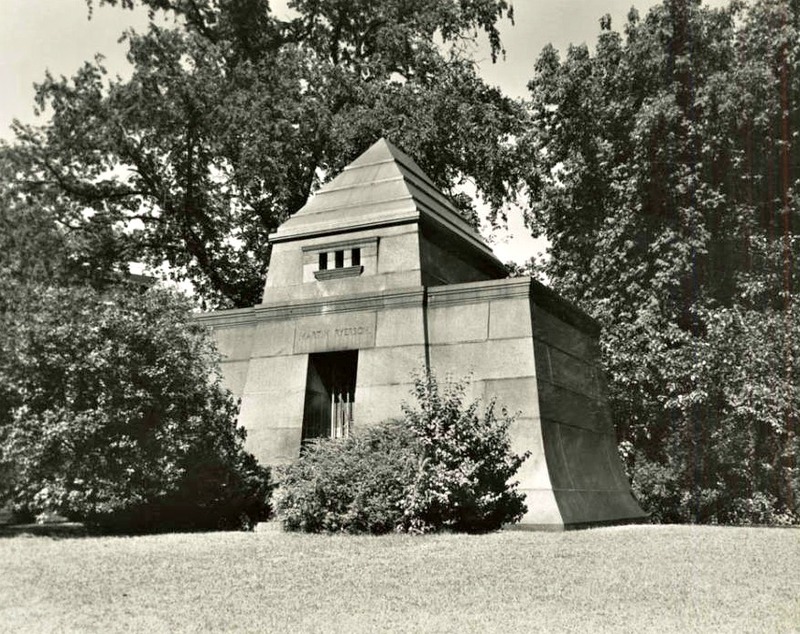 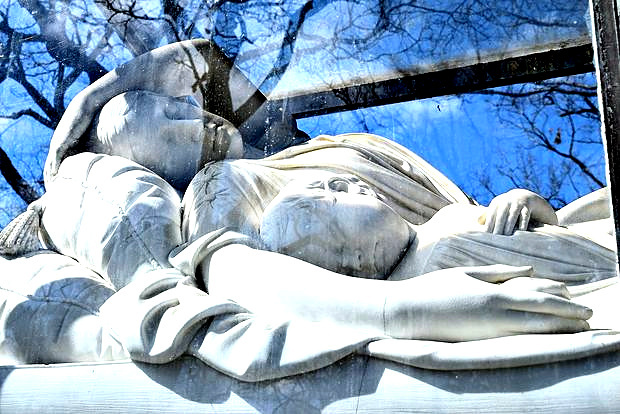 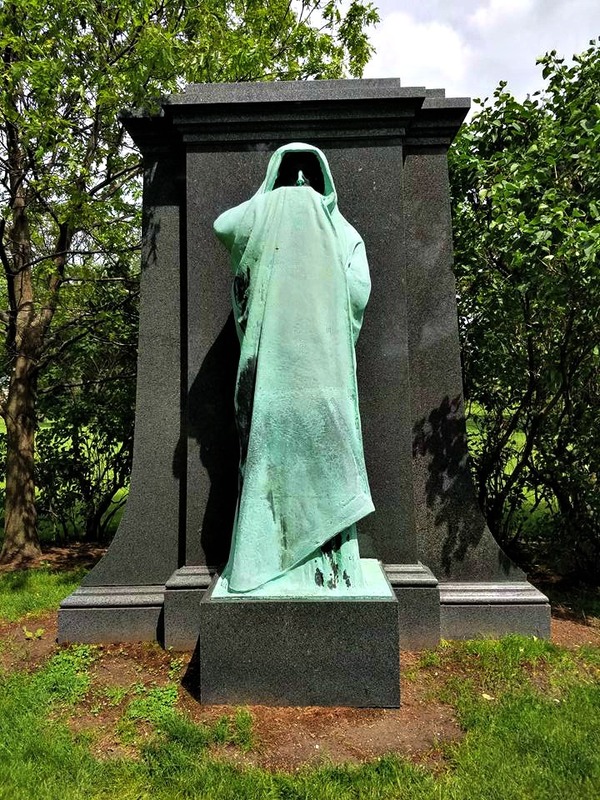 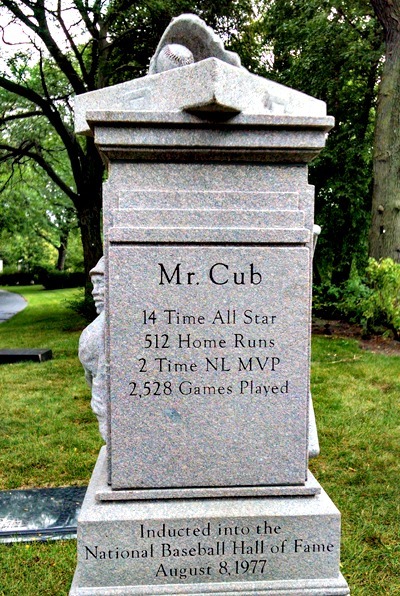 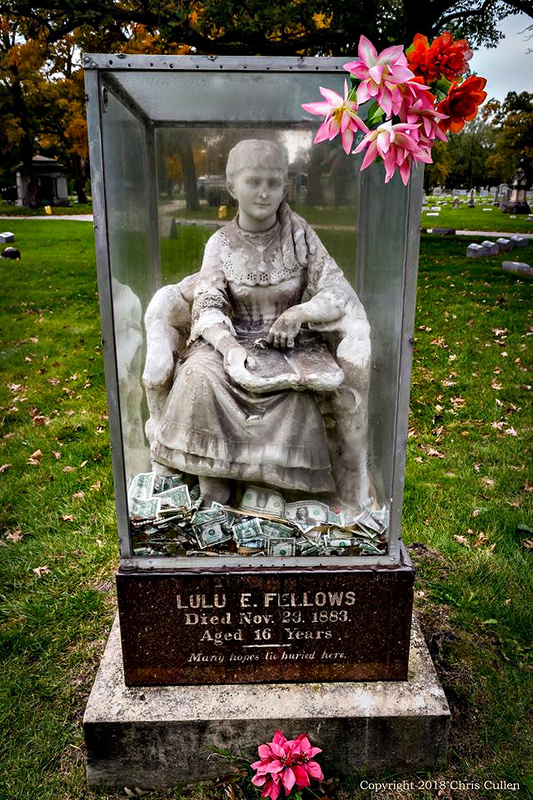 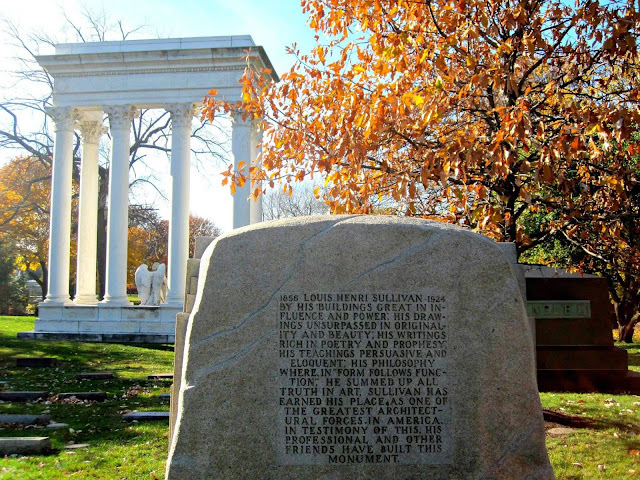 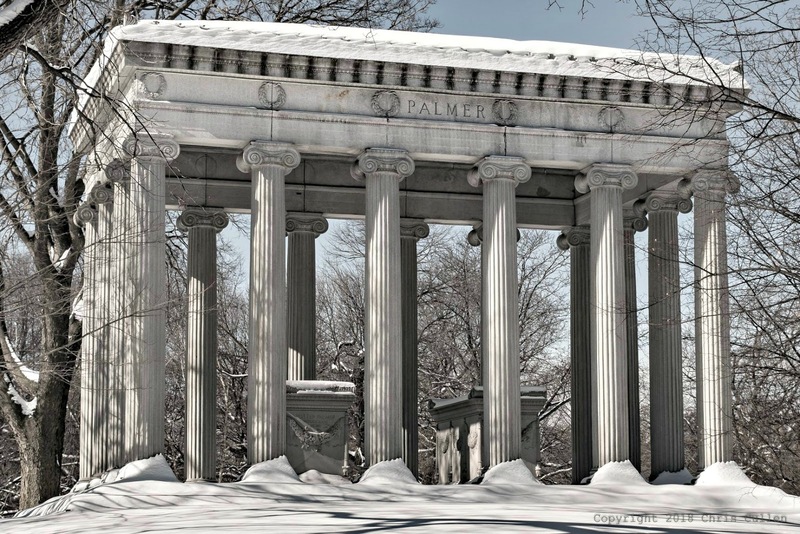 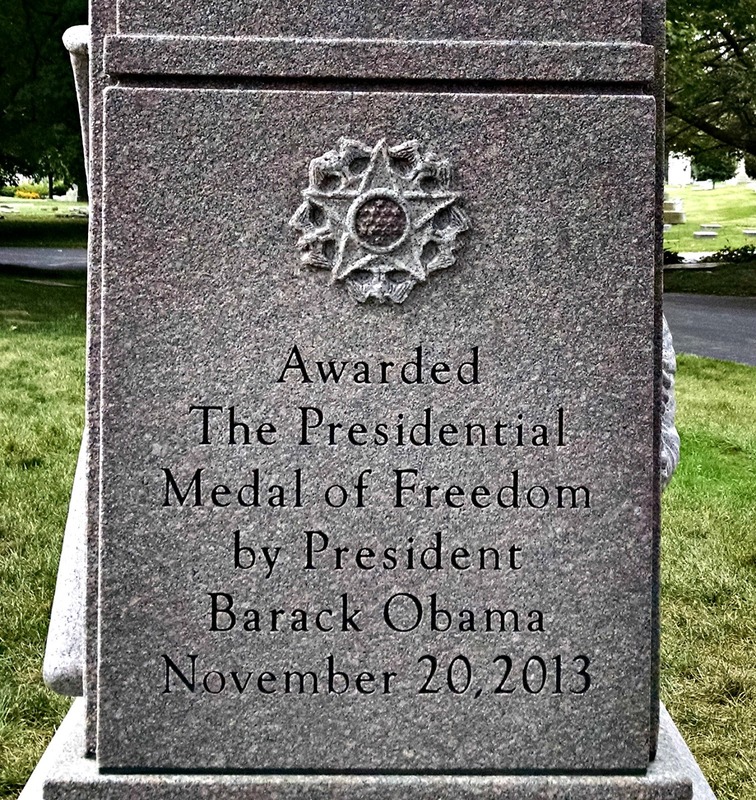 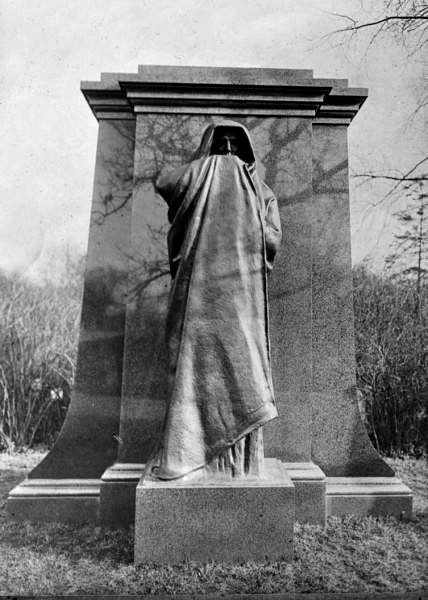 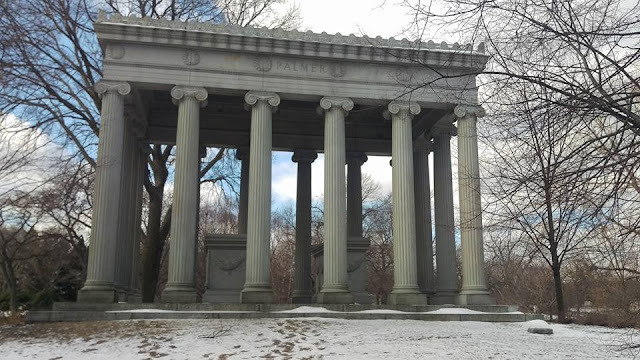 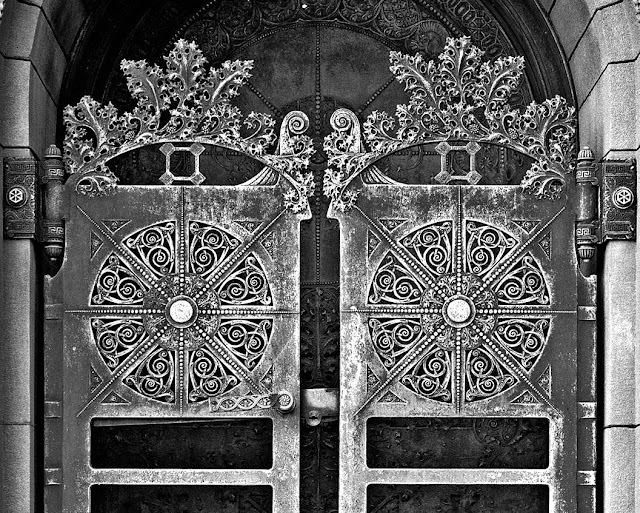 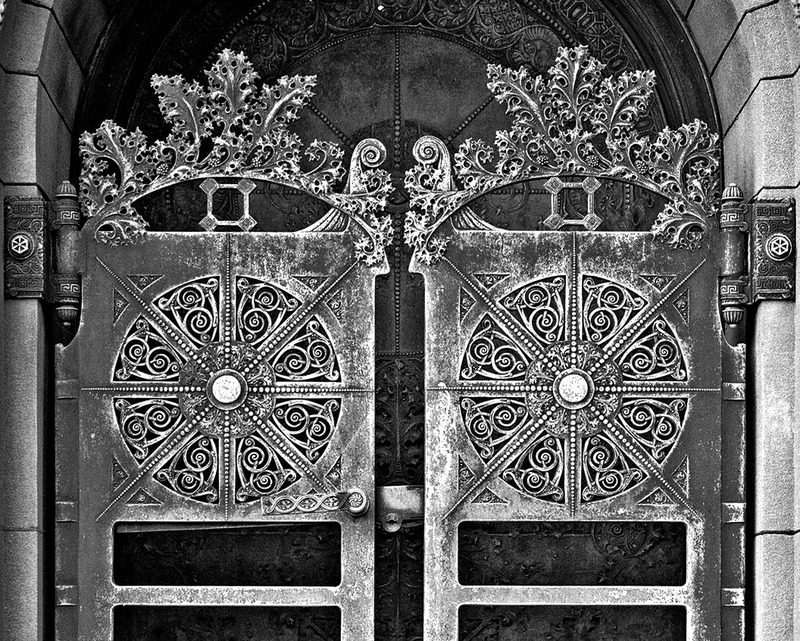 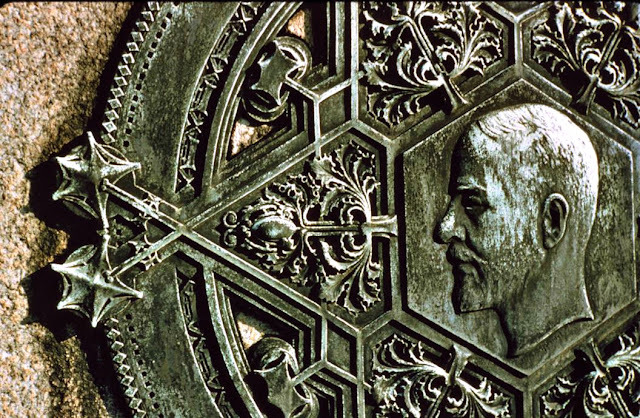 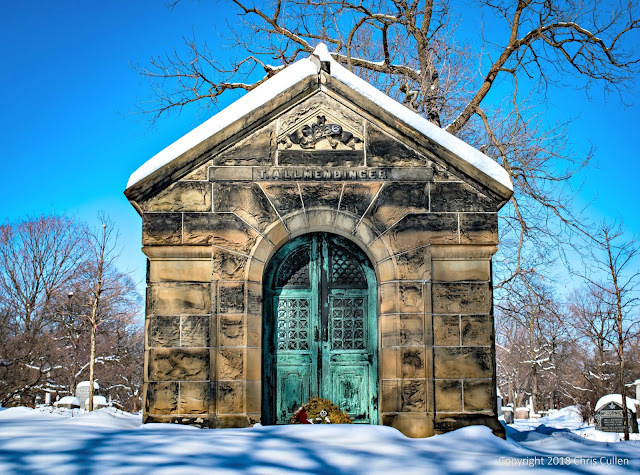 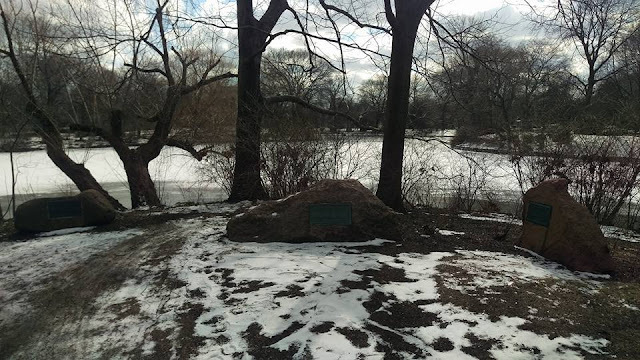 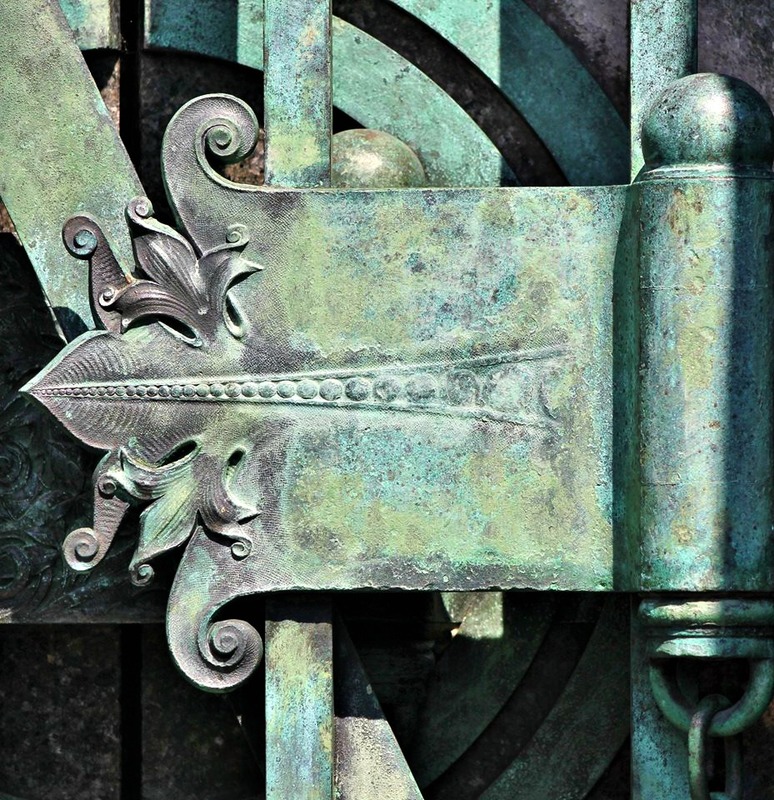 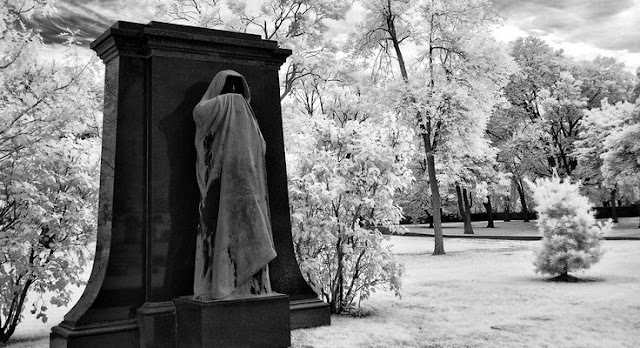 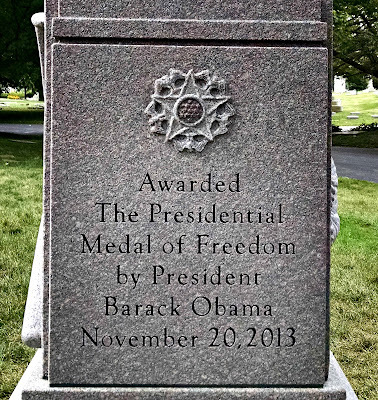 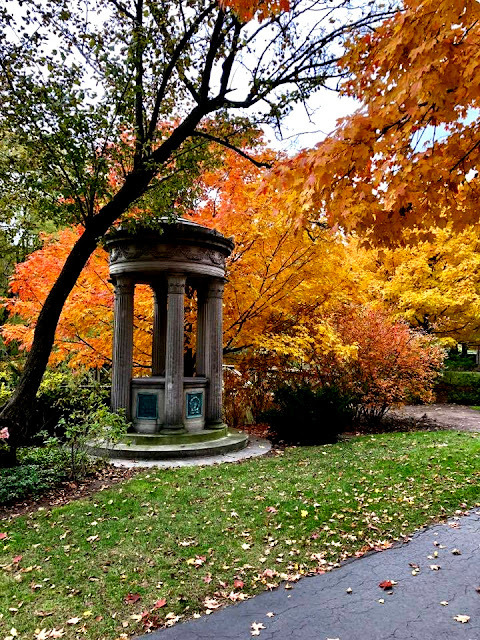 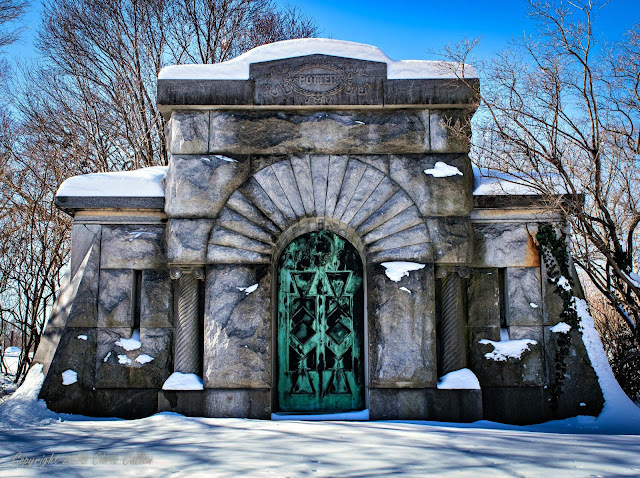 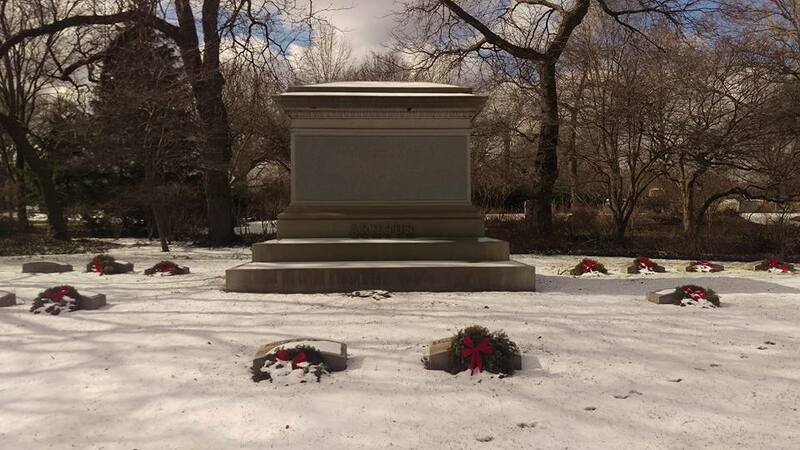 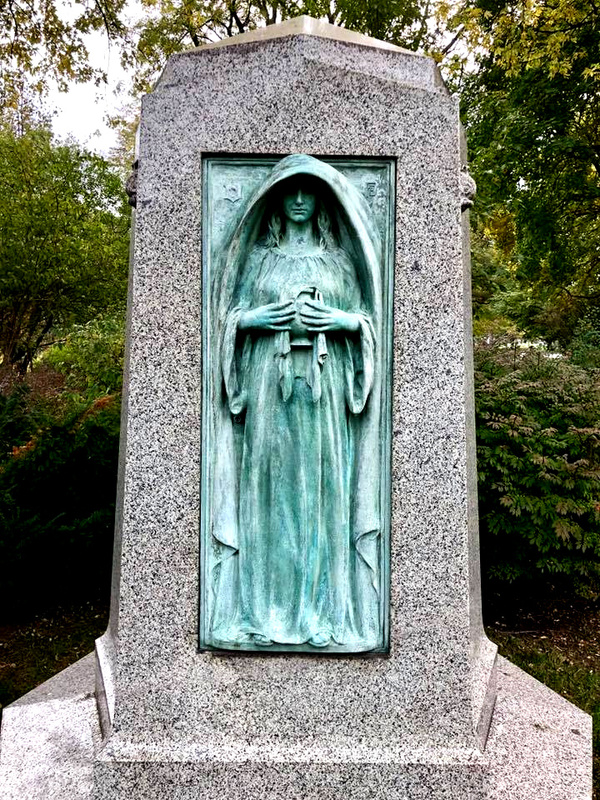 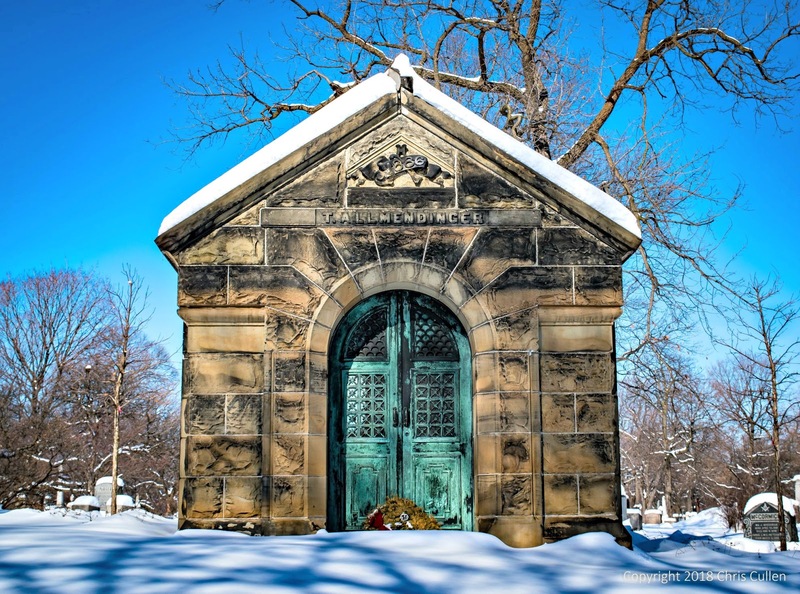 Up to the present thirty seven thousand interments have been made Graceland Cemetery." 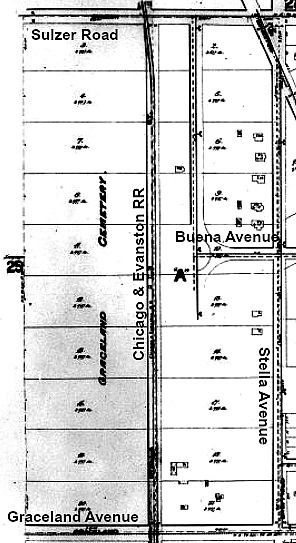 1894 Sanborn Fire edited Map indicates the location of the railroad station that was once located along the Chicago, Milwaukee-Evanston tracks (now the location of the Redline) off Buena Avenue with current view via Google Maps. 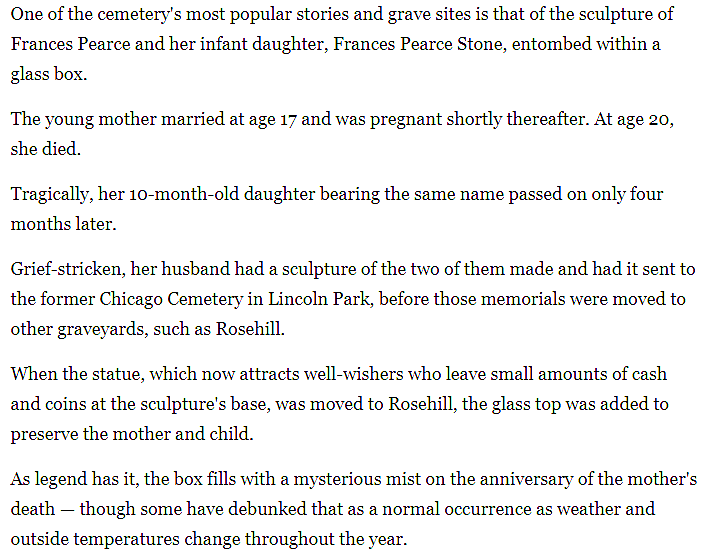 To read this article google 'Chicago Public Library-Chicago Tribune'. The reader will need a CPL card to gain access. 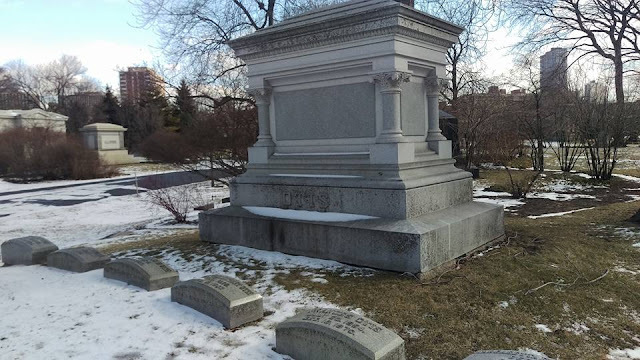 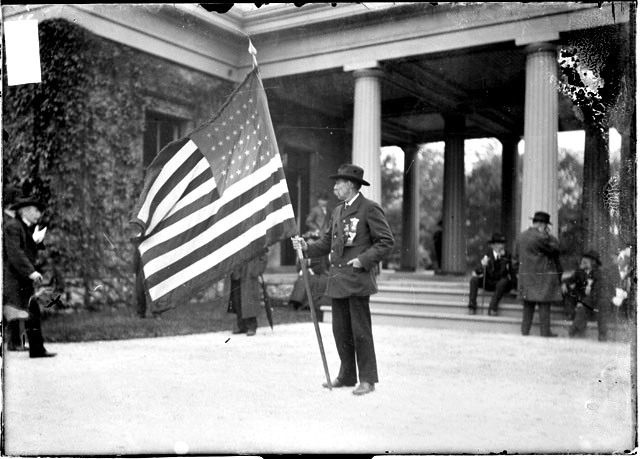 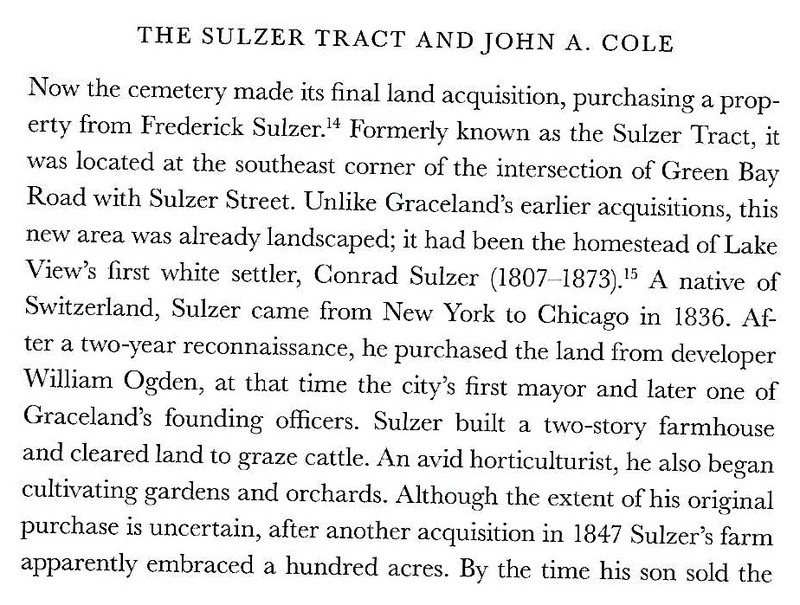 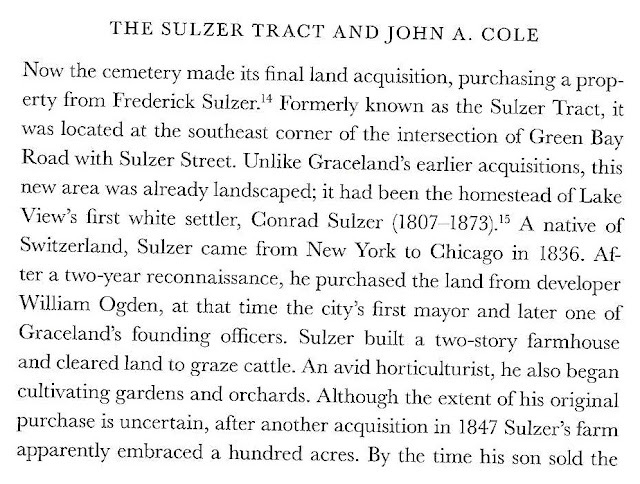 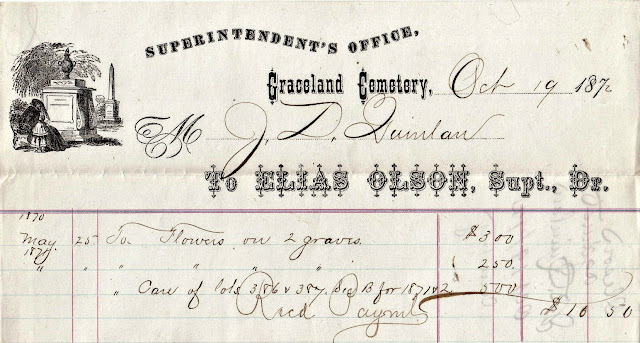 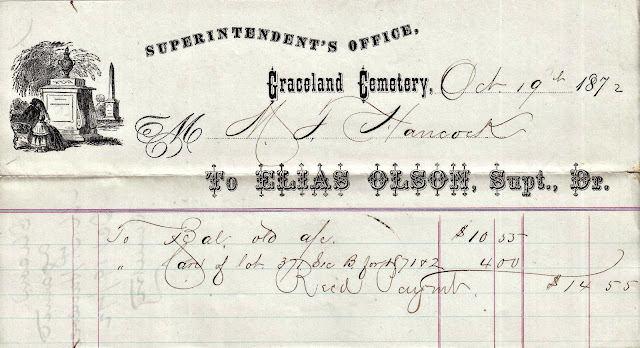 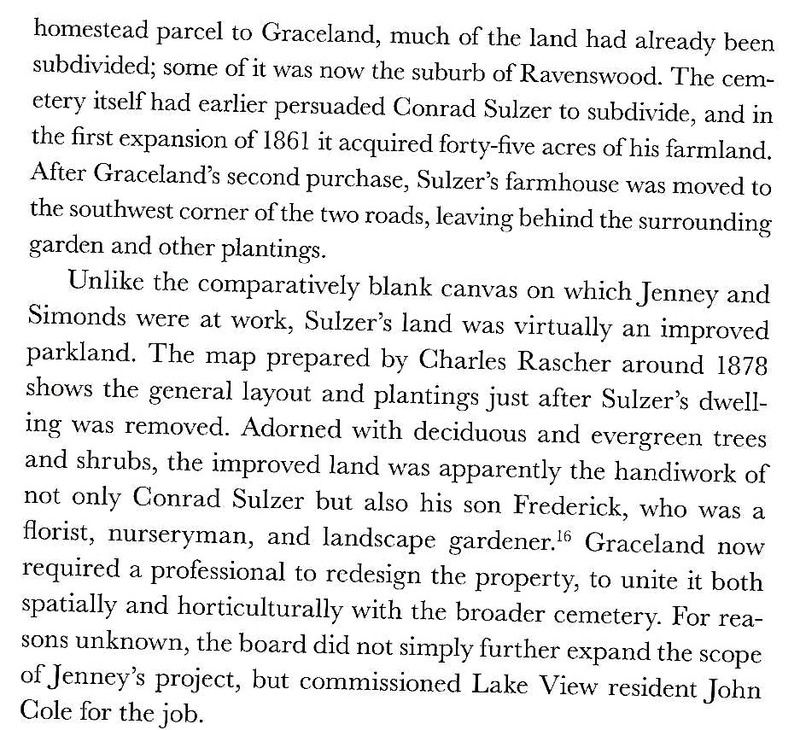 Conrad Sulzer, noted as one of the first Euro settler in the township owned property along the new cemetery & donated his original property to the Graceland Cemetery Company. The Township of Lake View had some interesting discussions about their expansion beyond their initial land purchase. 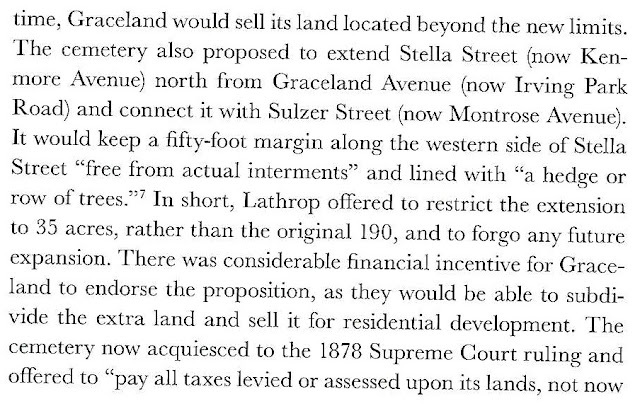 The conflict involved lost taxation to the township treasure. 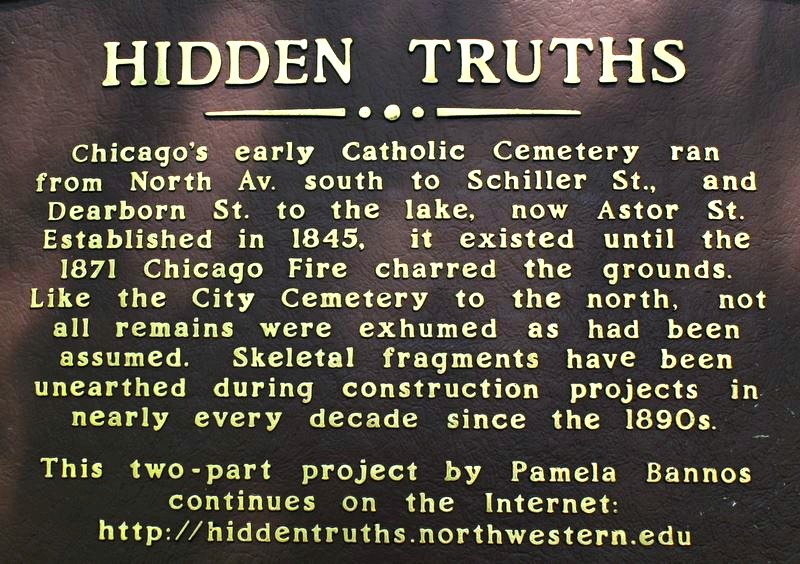 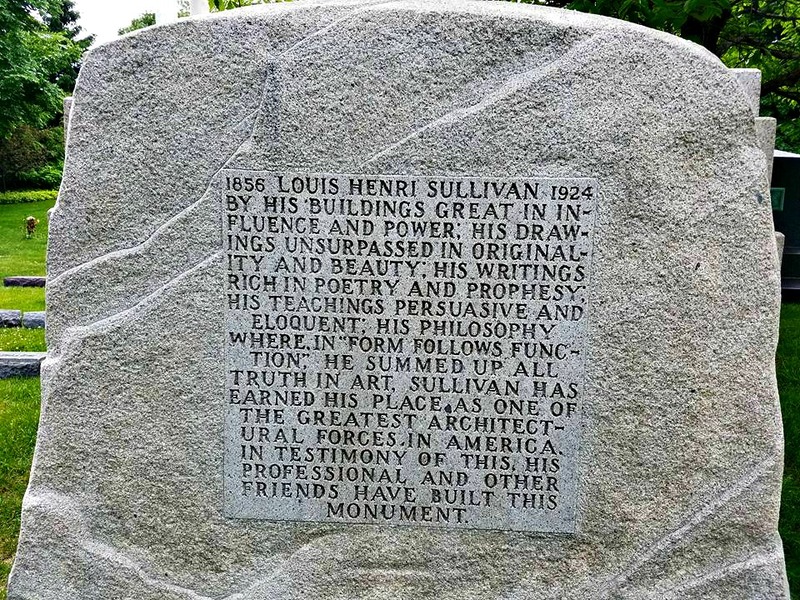 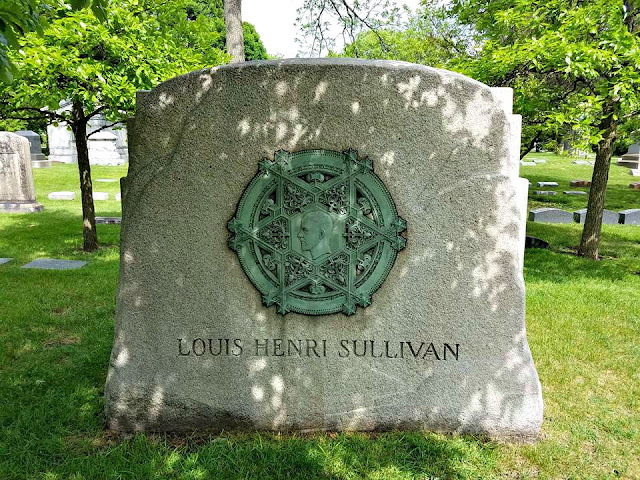 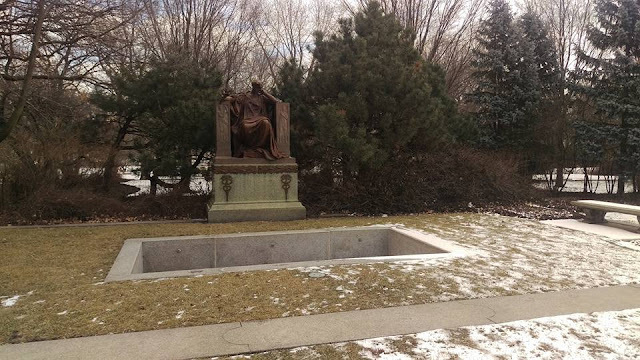 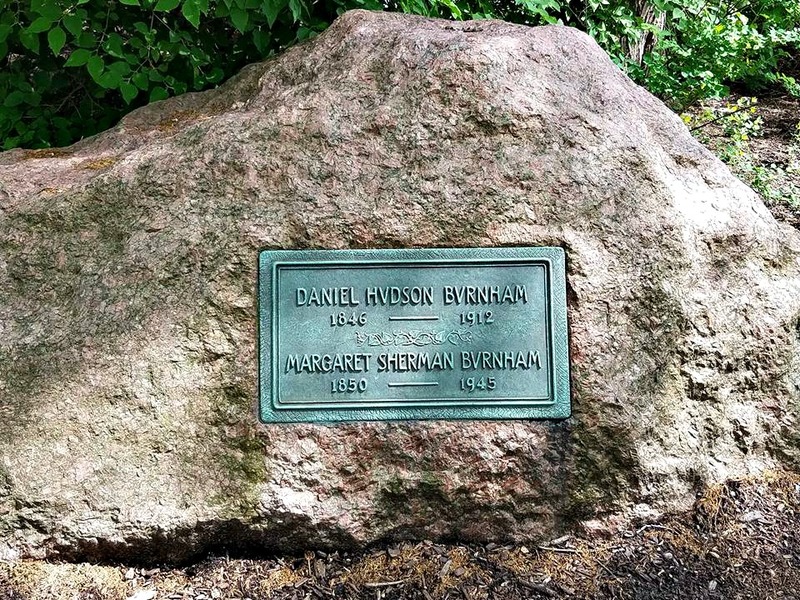 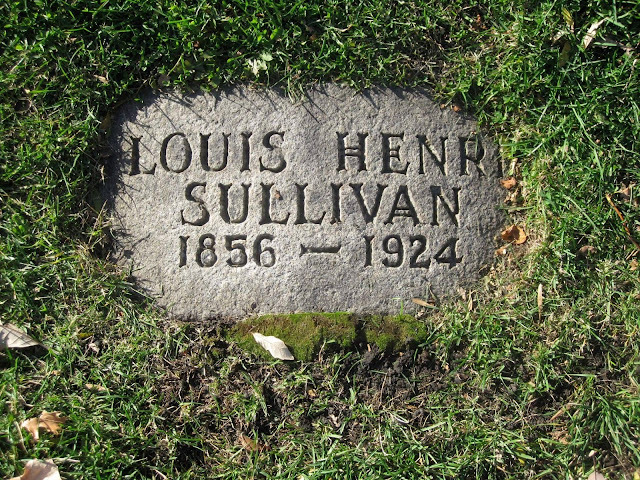 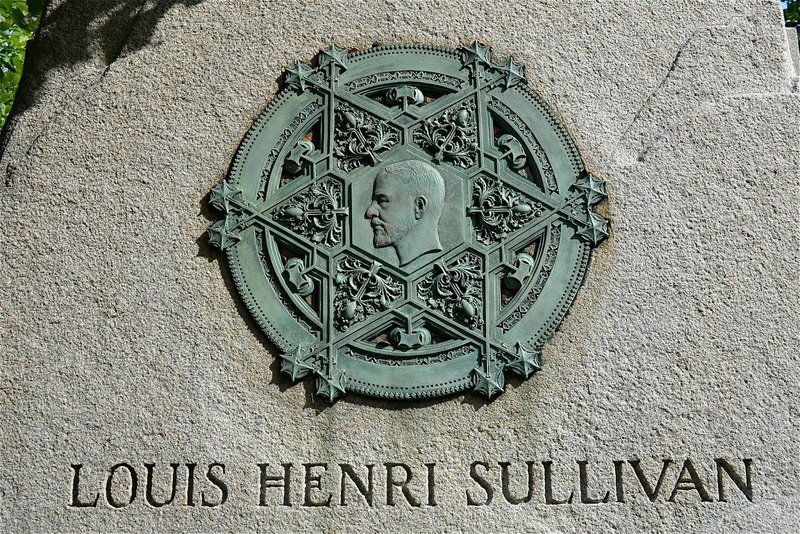 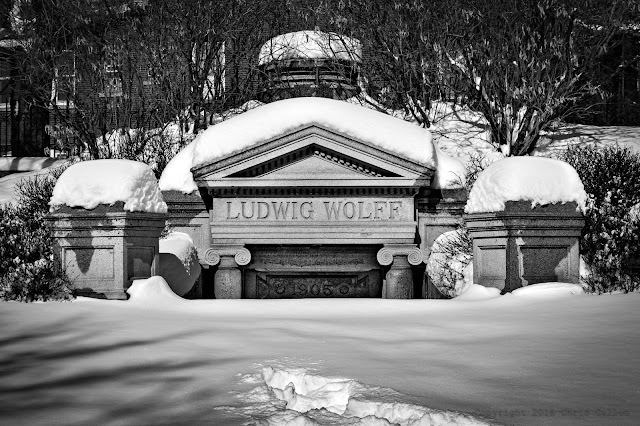 the man of founded the neighborhood of Streeterville, was buried here but not by choice. 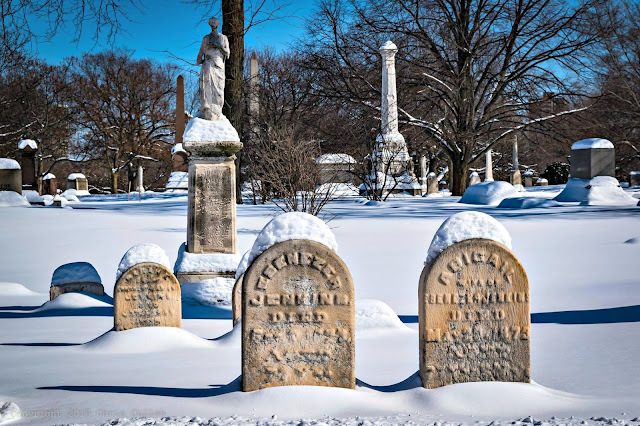 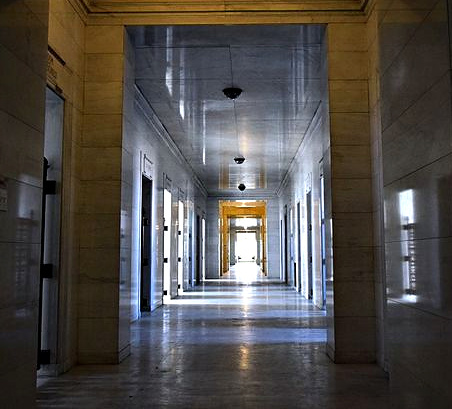 All photos + captions were submitted by TJ Casey to Forgotten Chicago-Facebook in 2016. 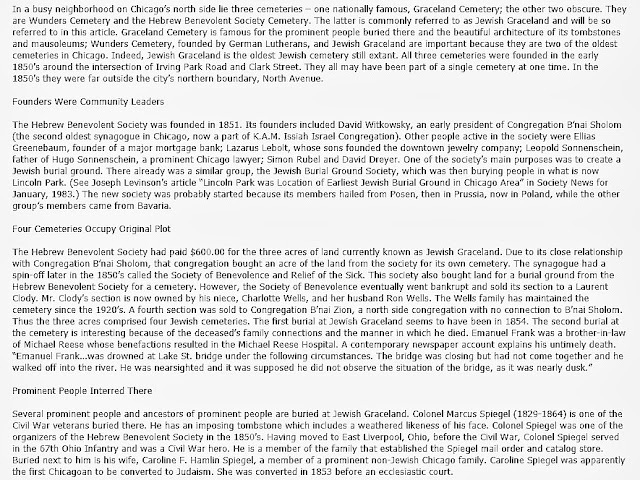 I included the links. 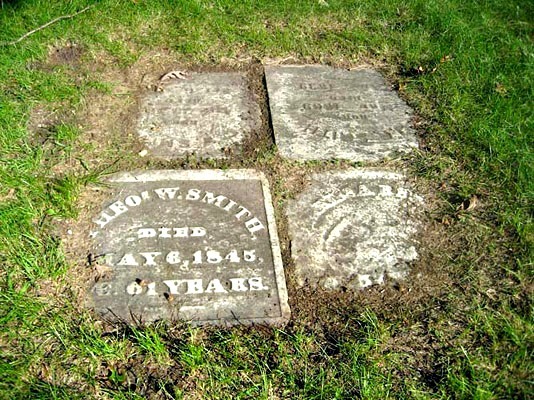 Read about the less known but important folks buried here. 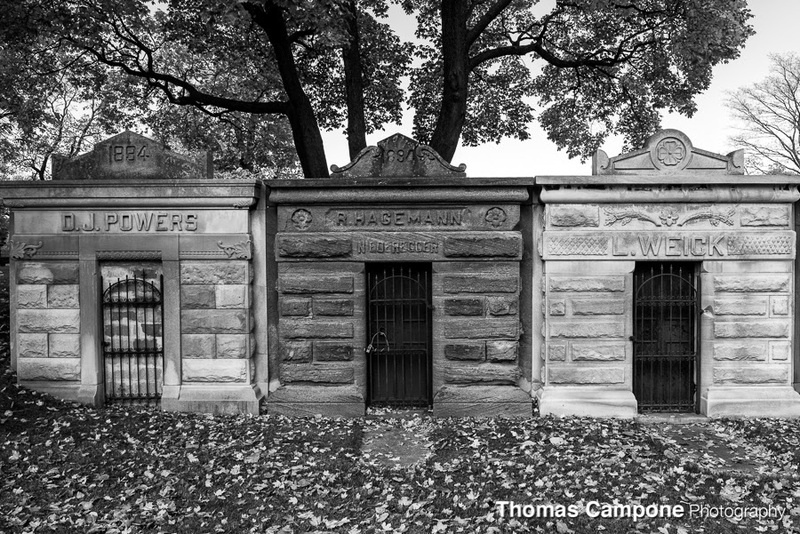 Notes: View more photos of this cemetery via Flickr. 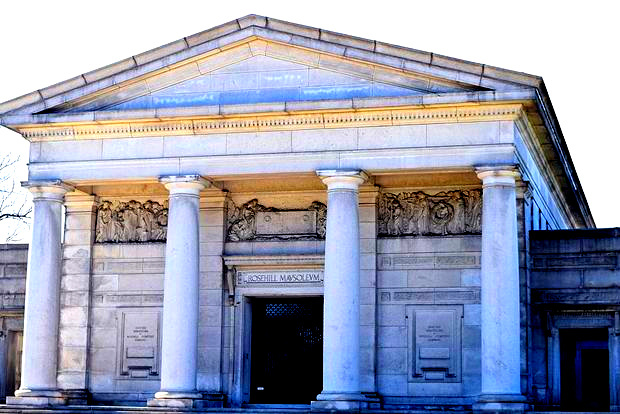 With this link are the names of military personnel who are buried at this cemetery as of 1922. 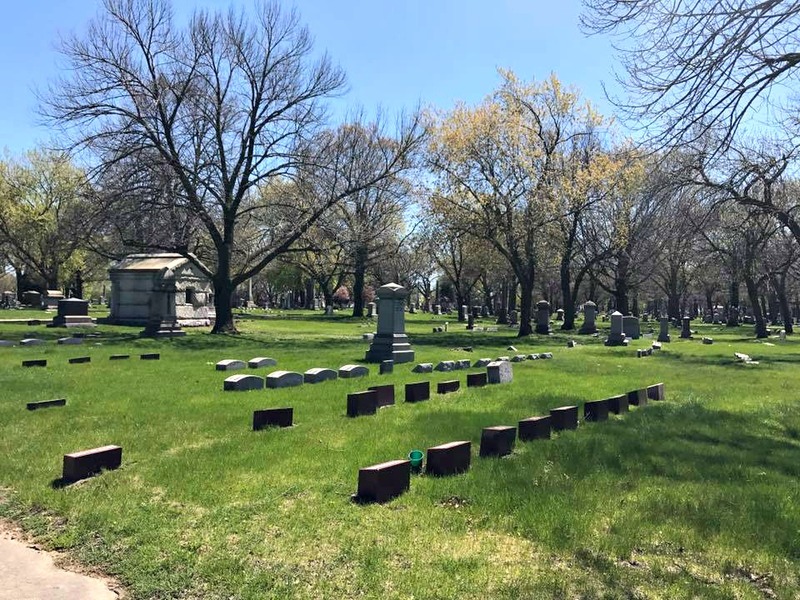 Here is a partial listing with grave photos of those buried in this cemetery - some long forgotten - click on name for grave photo & information. 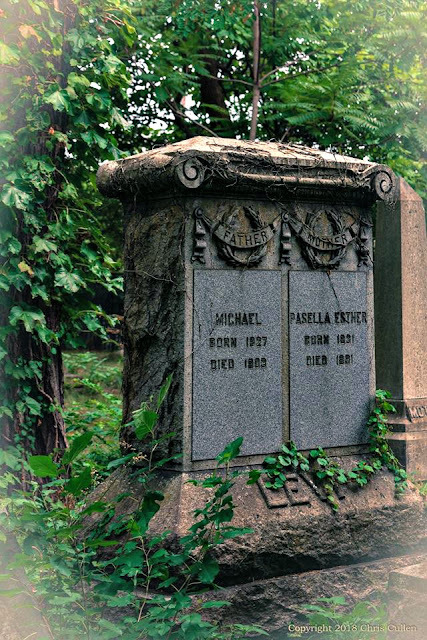 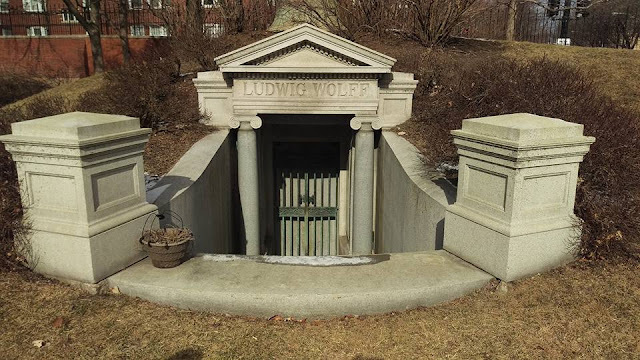 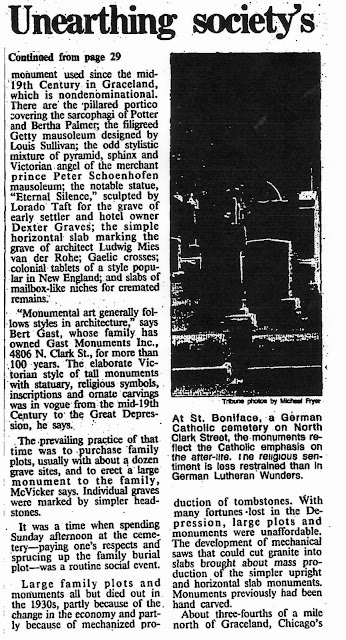 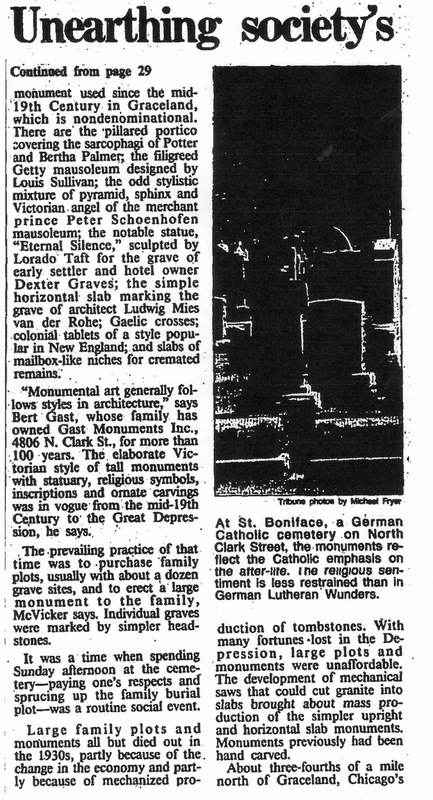 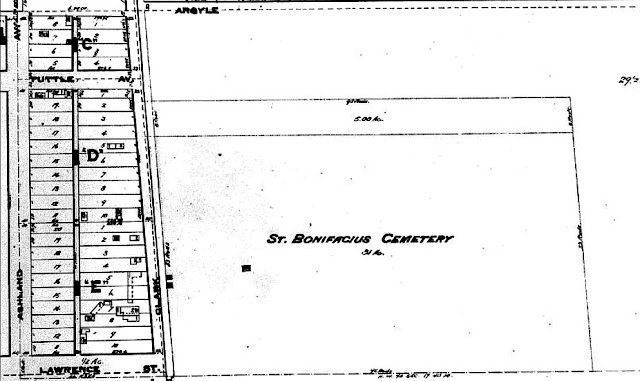 as Boniface Cemetery was the first of the German-American owned cemetery that contains the burials of the successful builders of the then German community. 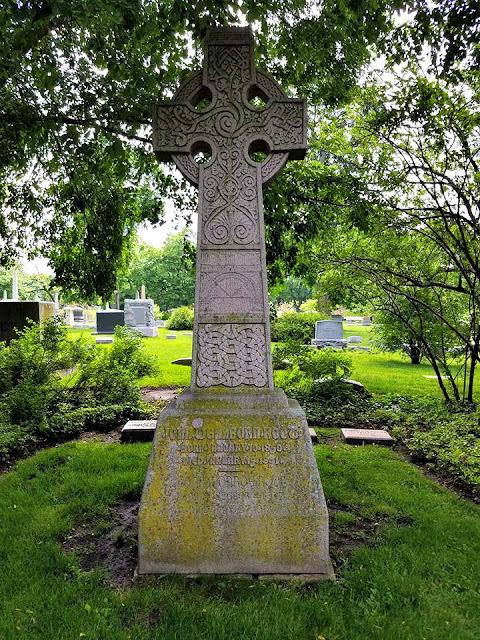 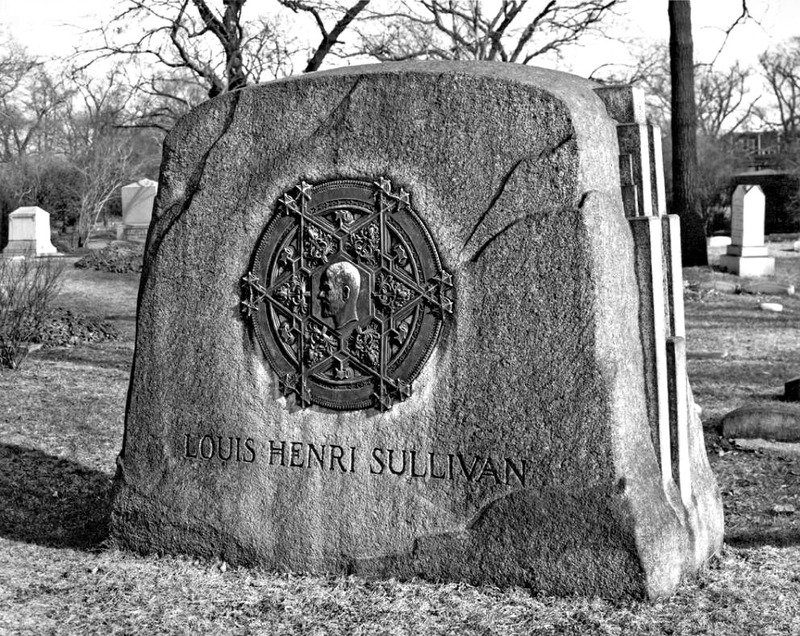 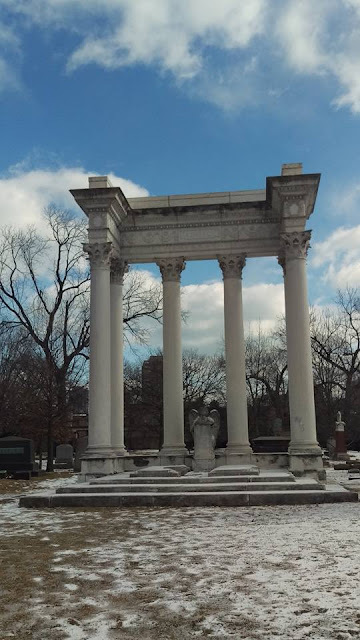 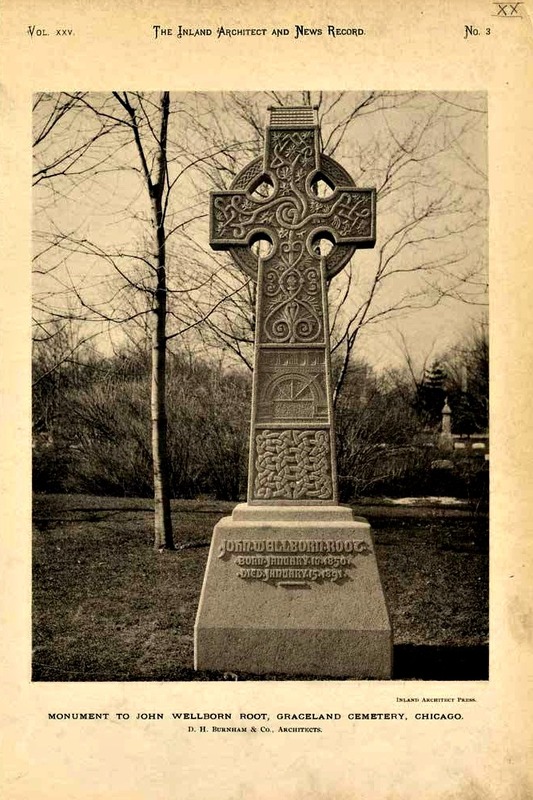 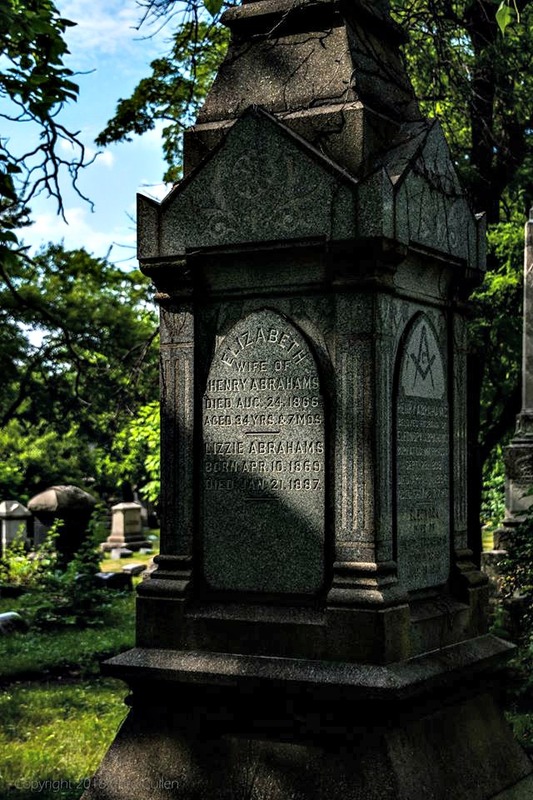 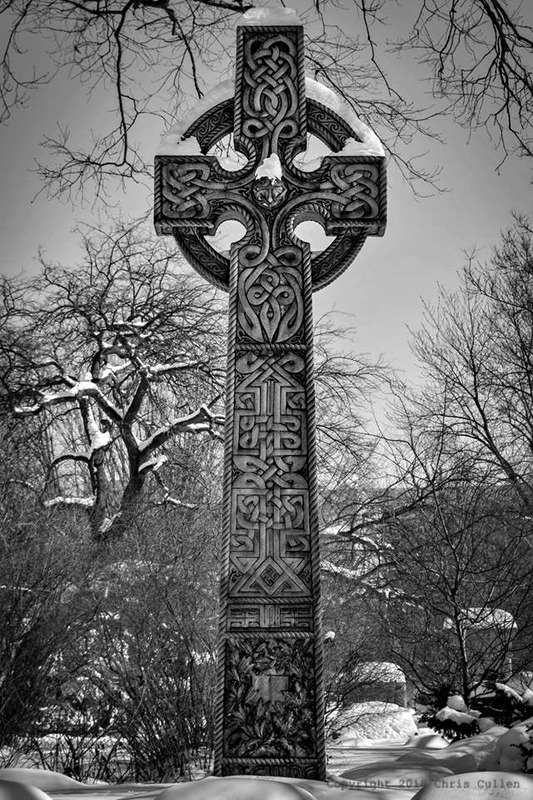 According to Chicago and Cook County Cemeteries this cemetery was named after Saint Boniface, a scholar, teacher, & missionary who for 36 years served the so called pagan tribes of Germany. Saint Boniface is known as the “Apostle of Germany.” The cemetery underwent extensive renovation in the 1960’s, with the old gate removed to permit better vehicle passage. 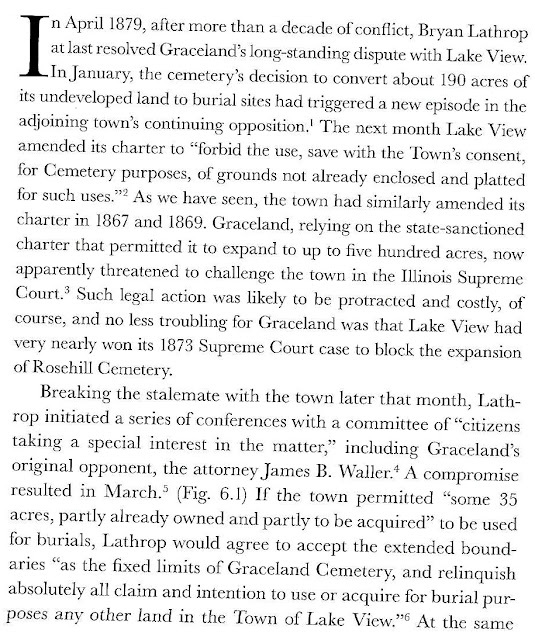 This cemetery once located in rural Lake View Township found itself surrounded by the 21st century city with no additional land available for growth. 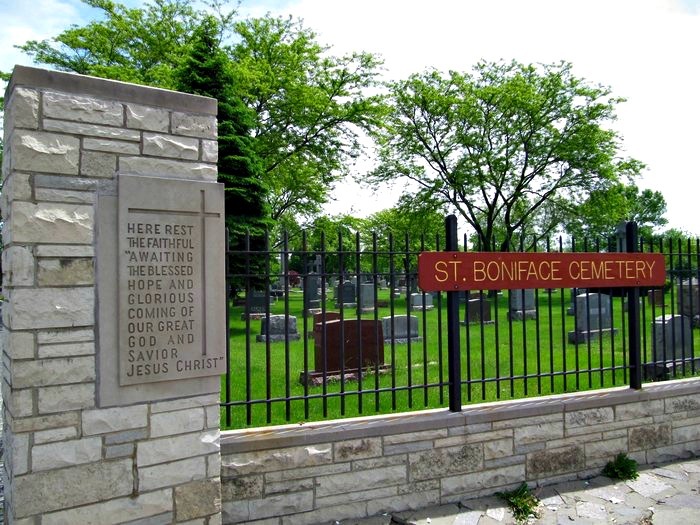 According to an online source 'Find a Grave' the first internment at St. Boniface was for a 9-day old infant named Marie Jung. 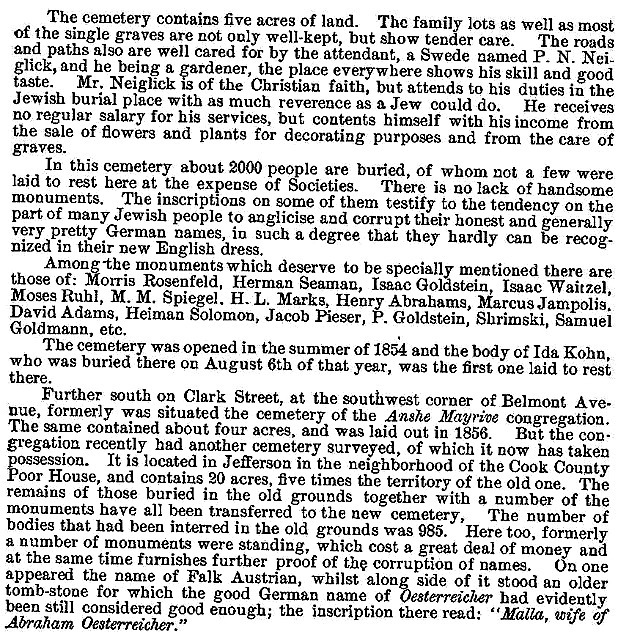 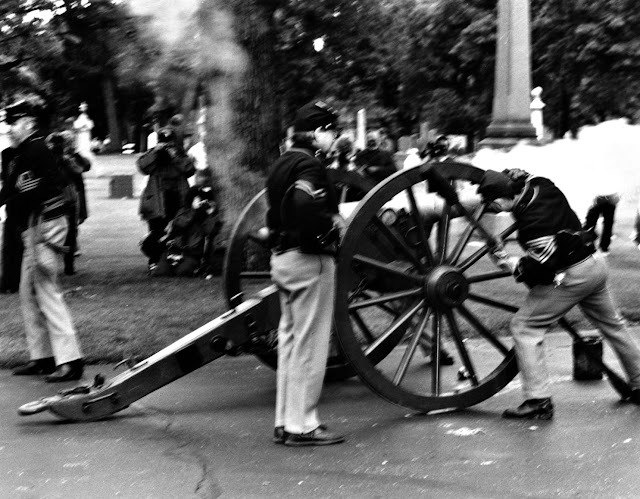 This burial took place on October 19, 1863. 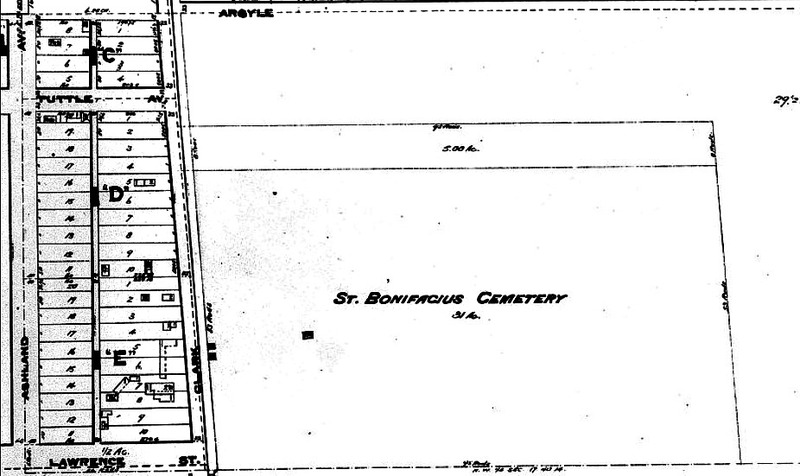 Currently, there have been 90,501 burials at St. Boniface. 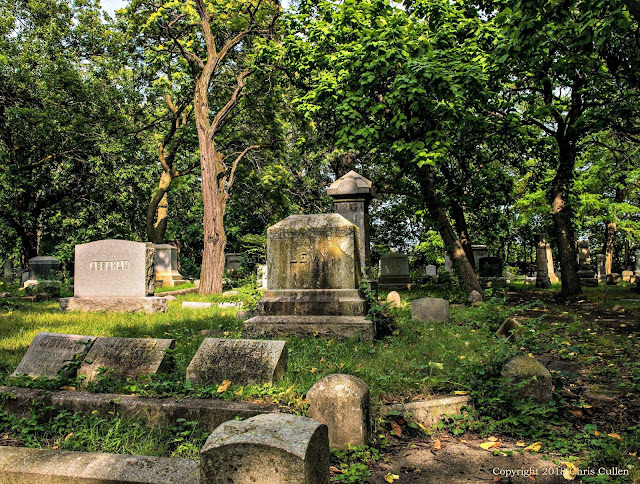 While this cemetery no longer has any grave space available for purchase current burials are still held for persons who hold a deed to an unused plot. 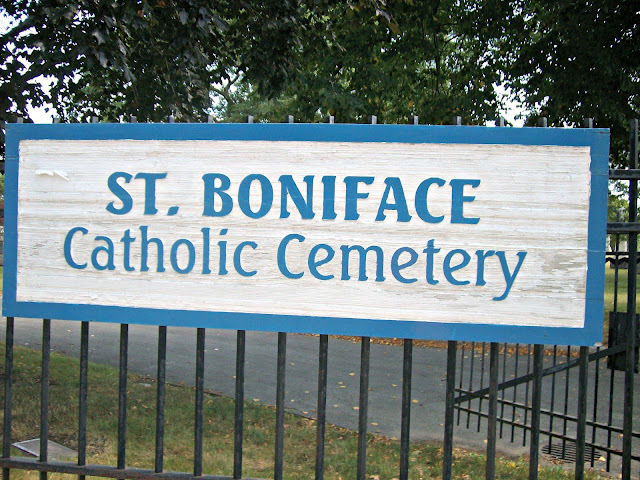 View more photos of Boniface Cemetery via Flickr. With this link are the names of military personnel who are buried at this cemetery as of 1922. 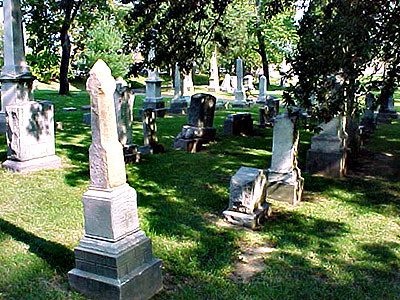 Here is a partial listing with grave photos of those buried in this cemetery - some long forgotten - click on name for grave photo. 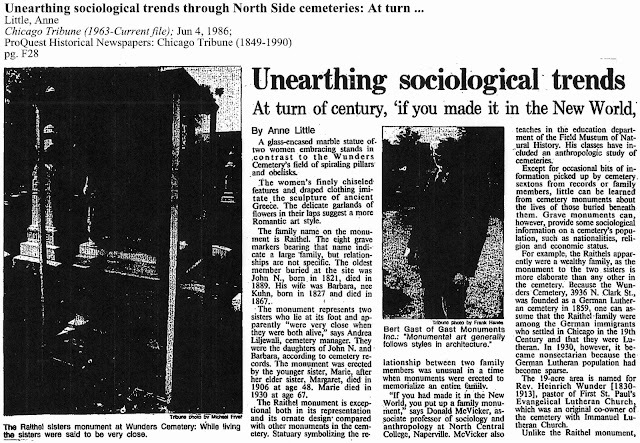 Also view more photos from Explore Chicago from the late 1980's. 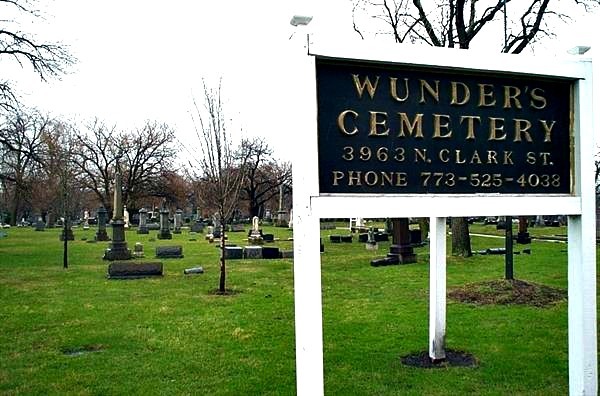 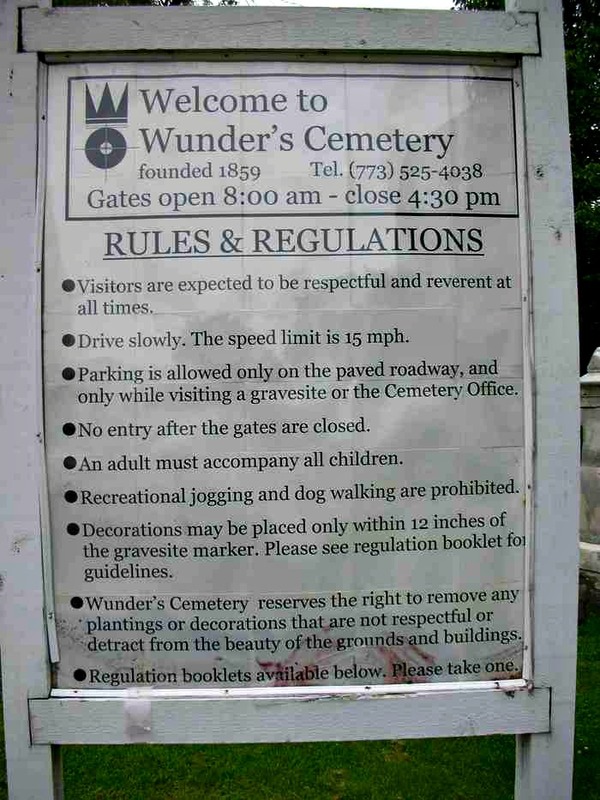 presently known as Wunder’s Cemetery. 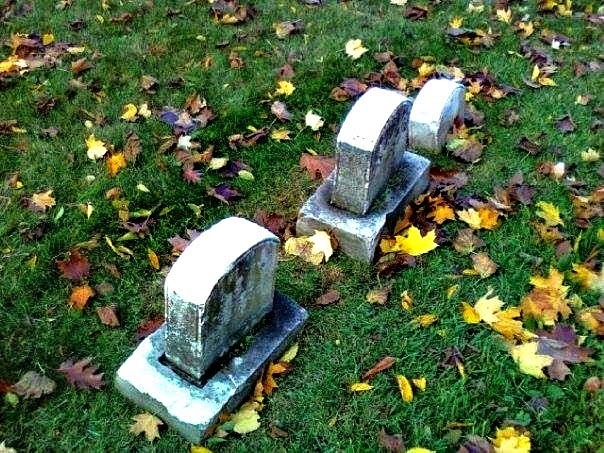 With this link are the names of military personnel who are buried at this cemetery as of 1922. View more photos of this cemetery via Flickr. 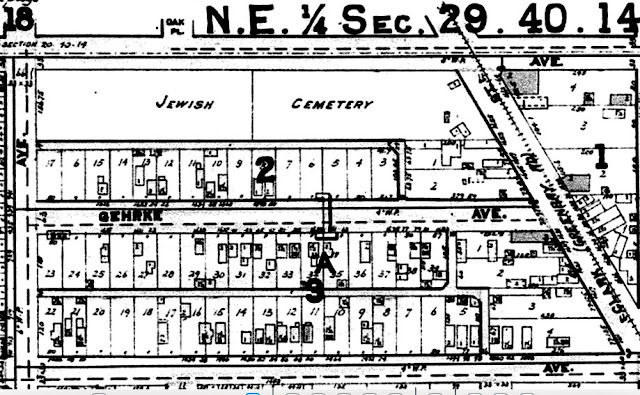 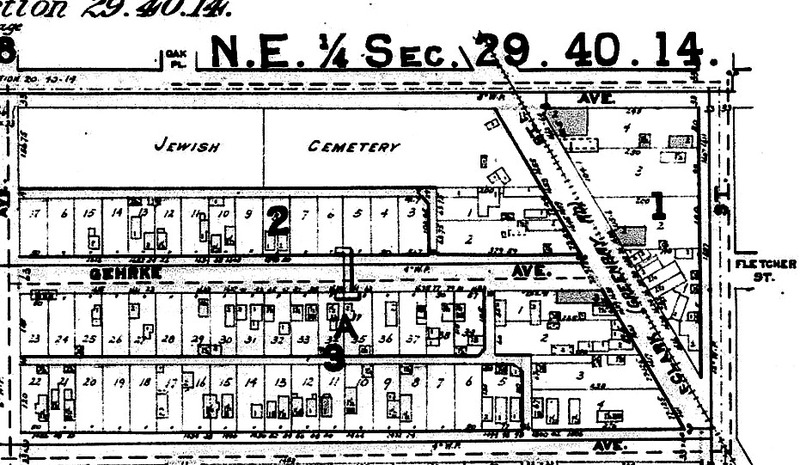 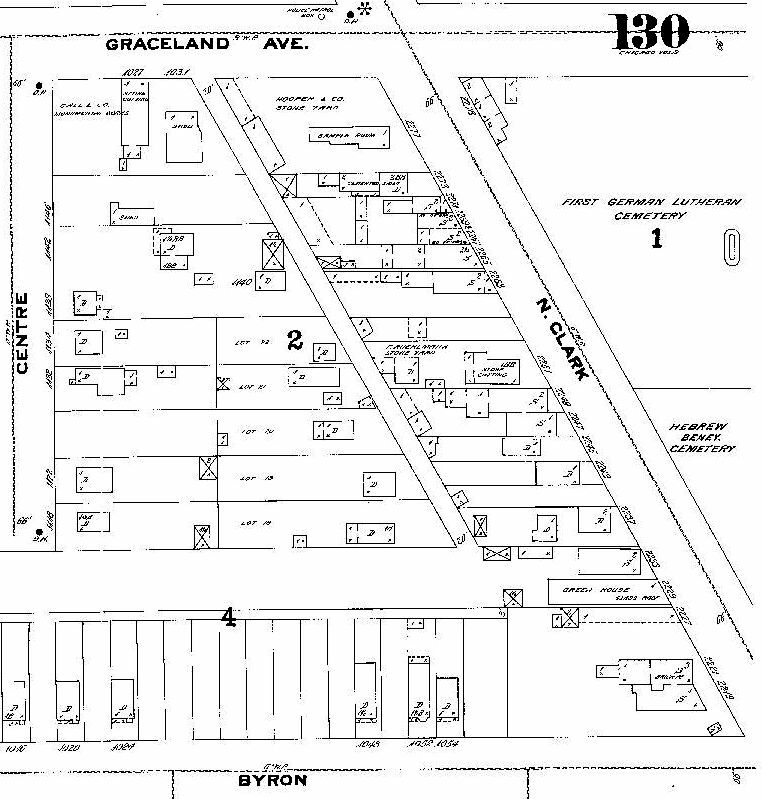 According to my research another Jewish cemetery was located on the southwest corner of Clark & Belmont - from Clark to Sheffield called Mount (Anshe) Mayriv Cemetery. 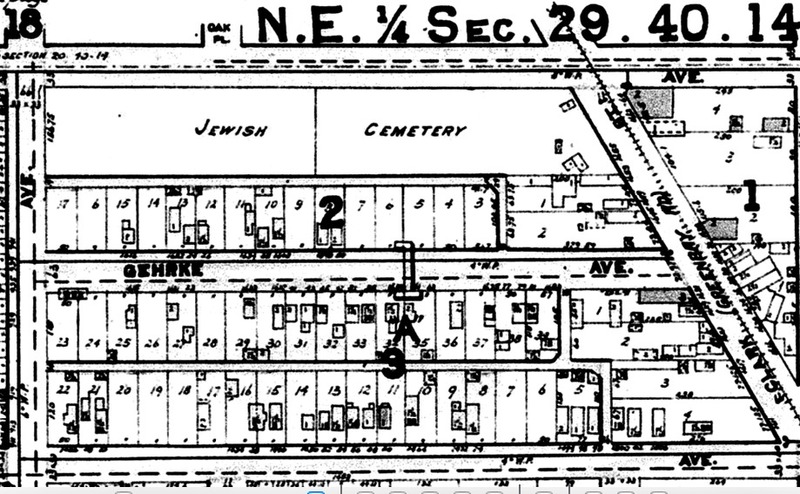 Gate 2: B'nai Shalom, KAM (948 burials). 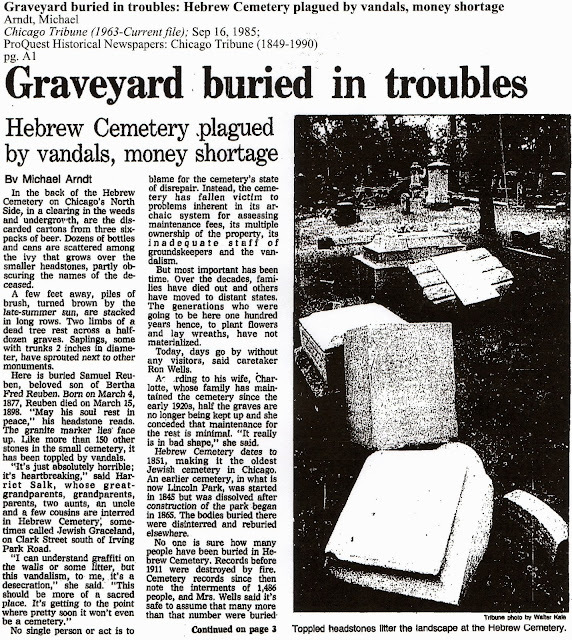 The two center sections (Gates 2 & 3) are owned by the Hebrew Benevolent Society. 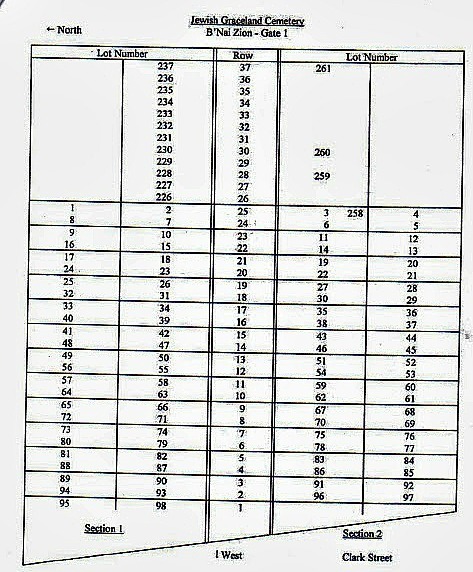 Gate 4: Chevra Kadisha (837 burials). 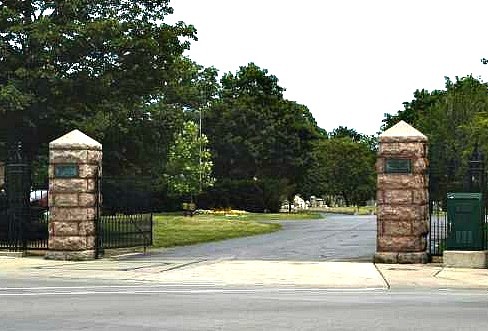 The North section (Gate 1) and the South section (Gate 4) are owned by Doris Wess-Evon. 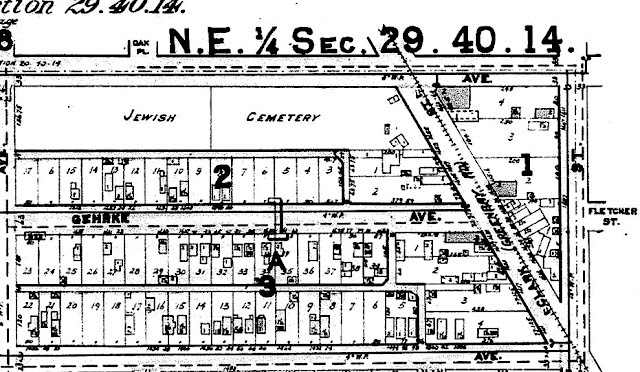 Also, Gates 1 and 4 (the north & south sections) are privately owned, while Gates 2 and 3 (the central sections) are owned and maintained by the Hebrew Benevolent Society. 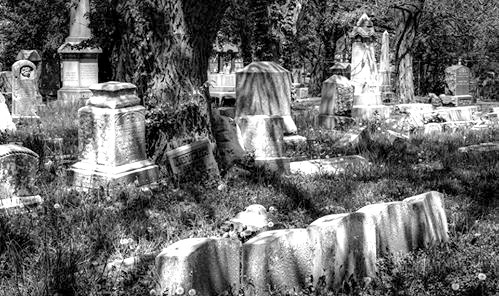 View more photos of this cemetery via Flickr and here is a partial listing with grave photos of those buried in this cemetery, some long forgotten. 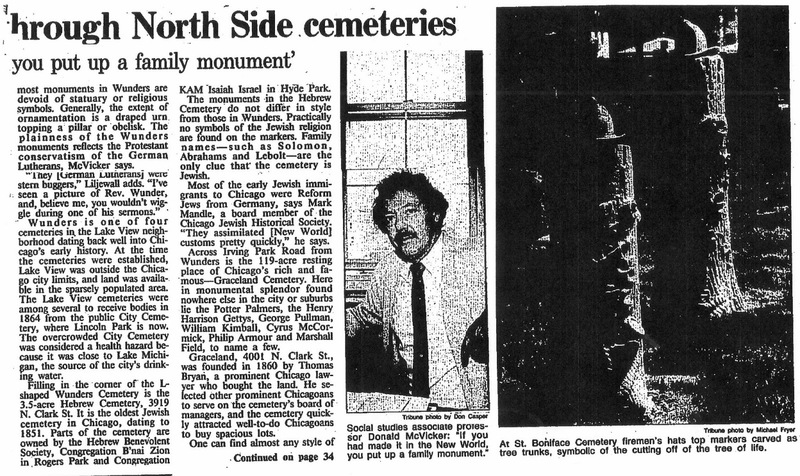 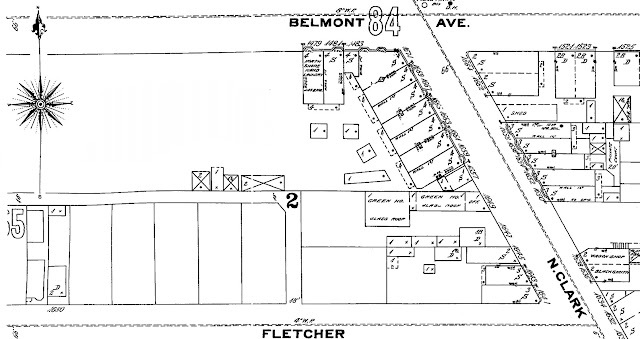 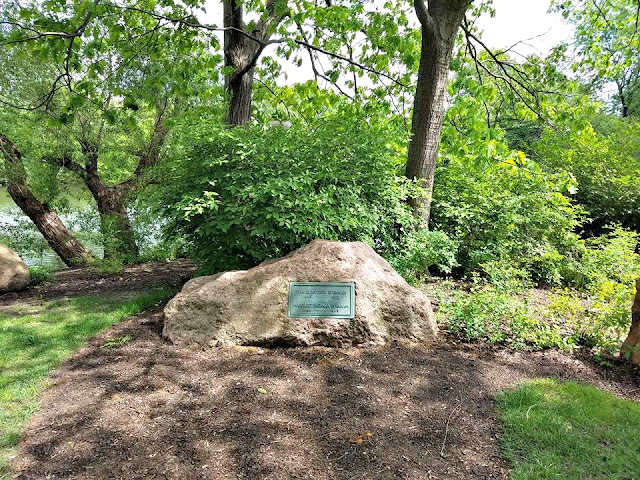 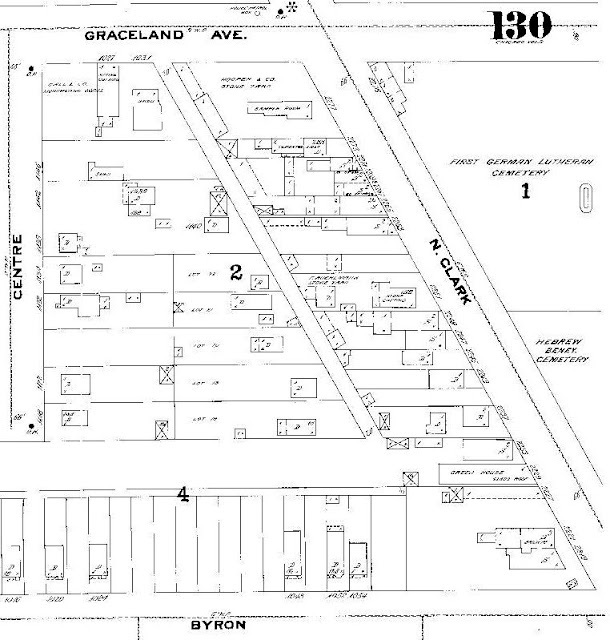 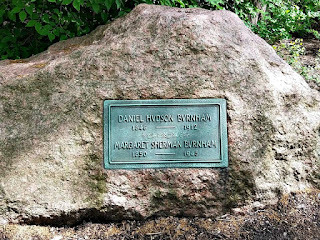 Please scroll up to read about the apparent first Jewish cemetery on Belmont Avenue from Clark Street to Sheffield called Mount Mayriv Cemetery. 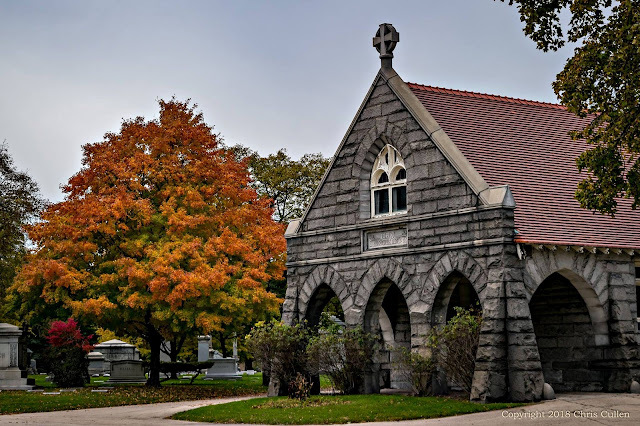 The other cemetery not listed in the post is the church graveyard of Old St. Henry's Catholic Church that has the oldest remaining attached cemetery in Chicago. 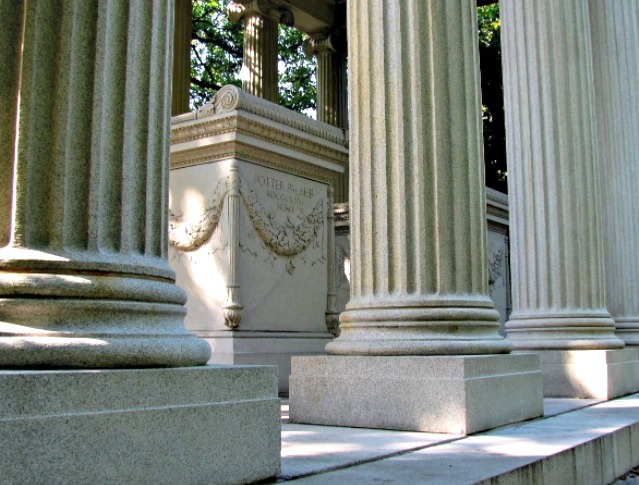 During the 19th century, and especially in its later years, snacking in cemeteries happened across the United States. 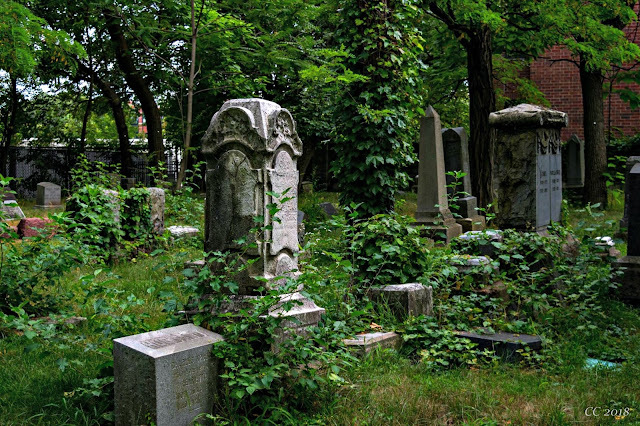 It wasn’t just apple-munching alongside the winding avenues of graveyards. 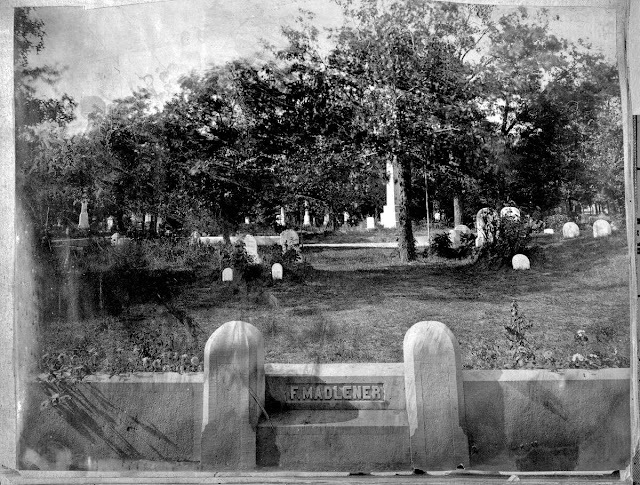 Since many municipalities still lacked proper recreational areas, many people had full-blown picnics in their local cemeteries. 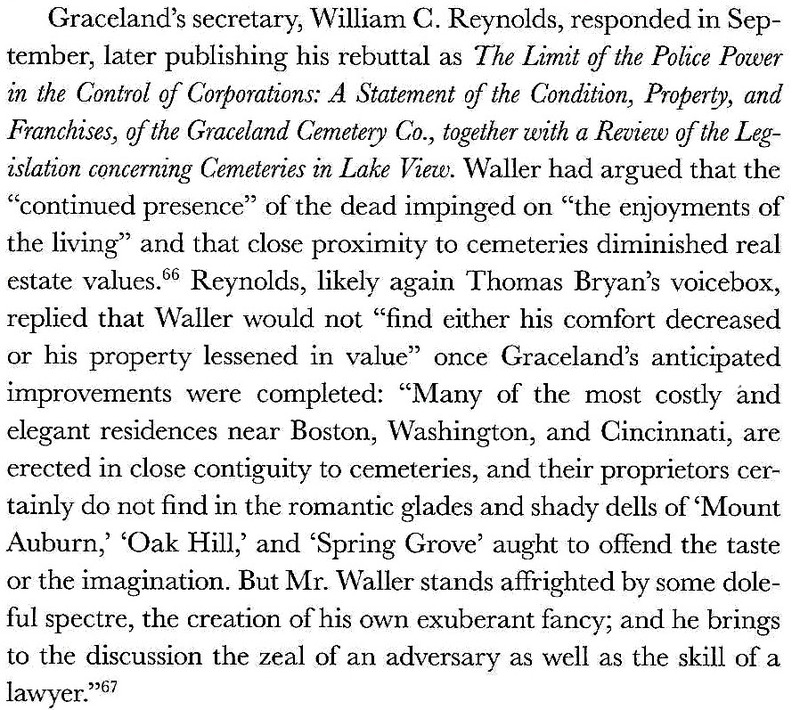 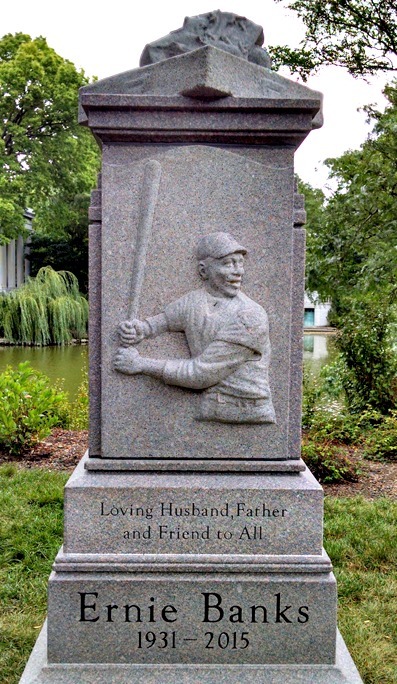 The tombstone-laden fields were the closest things, then, to modern-day public parks. 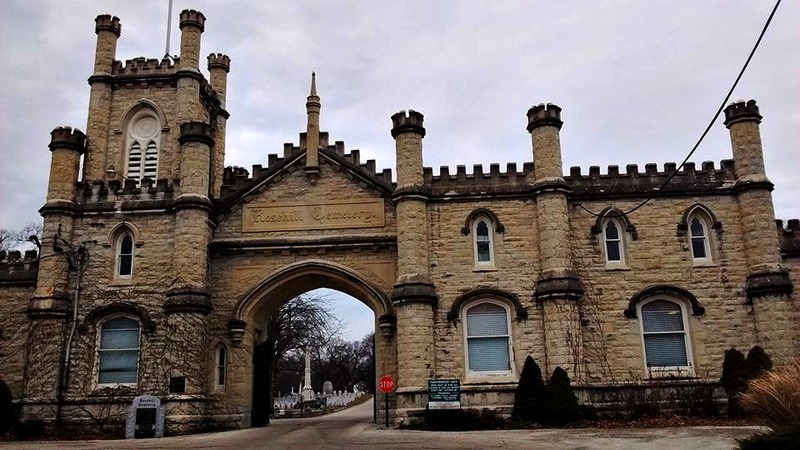 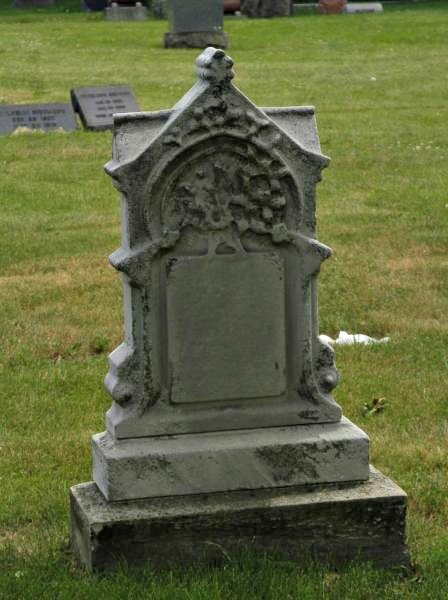 Here is a list of all the cemeteries in Illinois. 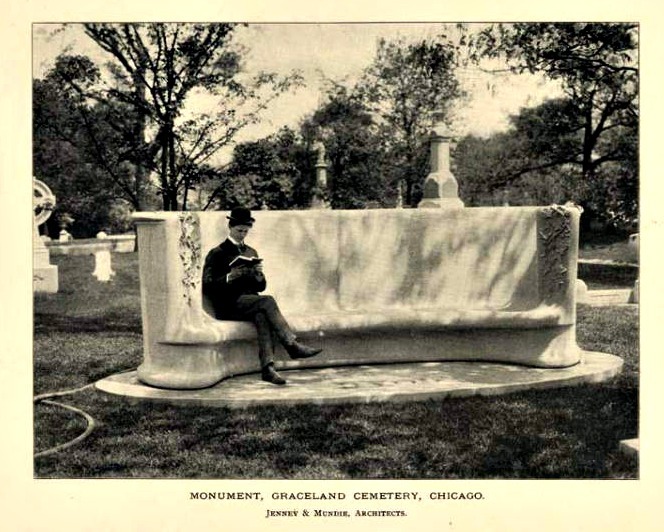 Read more about re-interments of graves from one cemetery to another by WBEZ as well the mention of those cemeteries with this link.